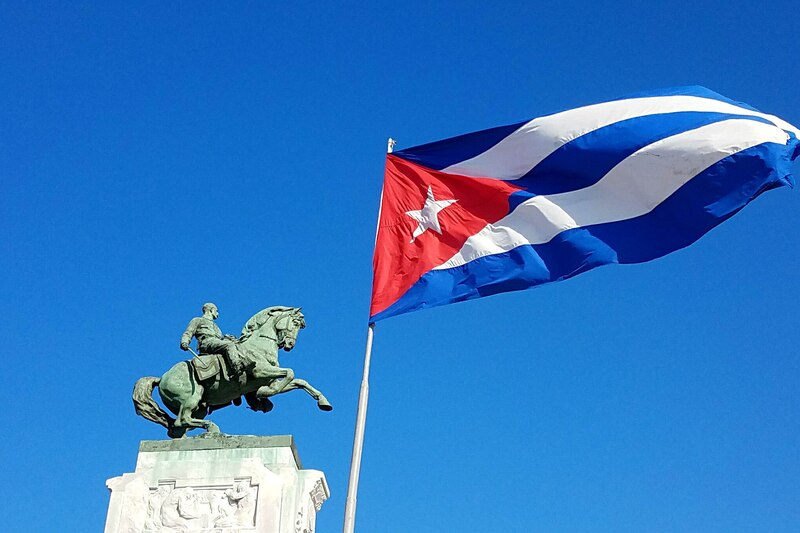 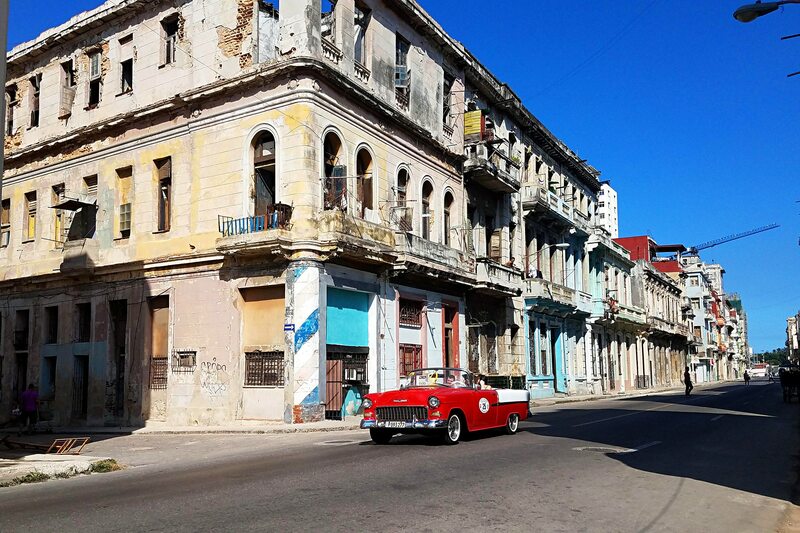 It seems Cuba is something everyone knows both everything and nothing about. 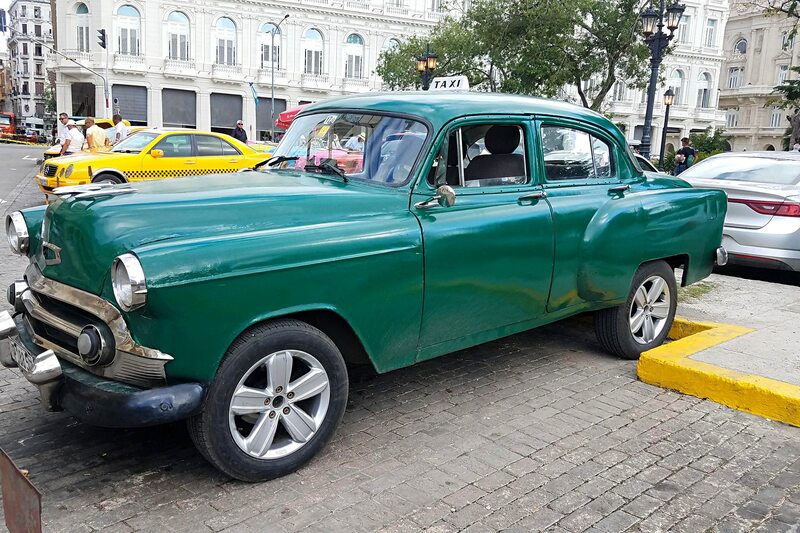 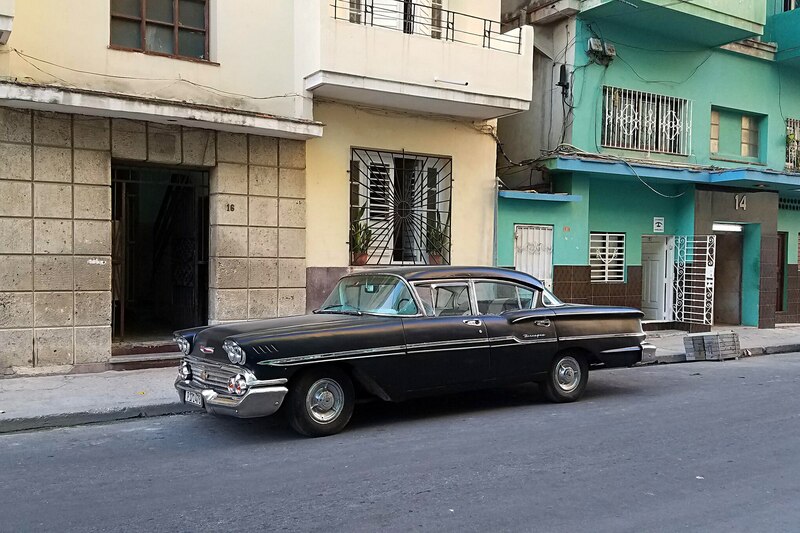 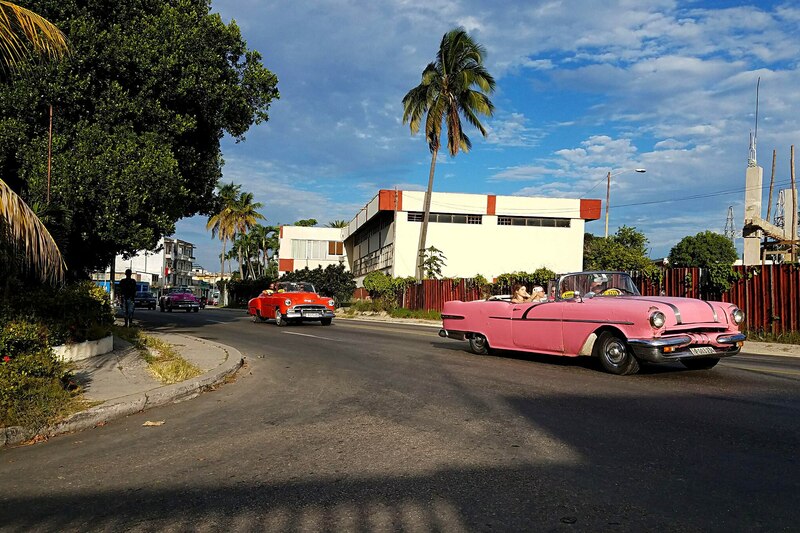 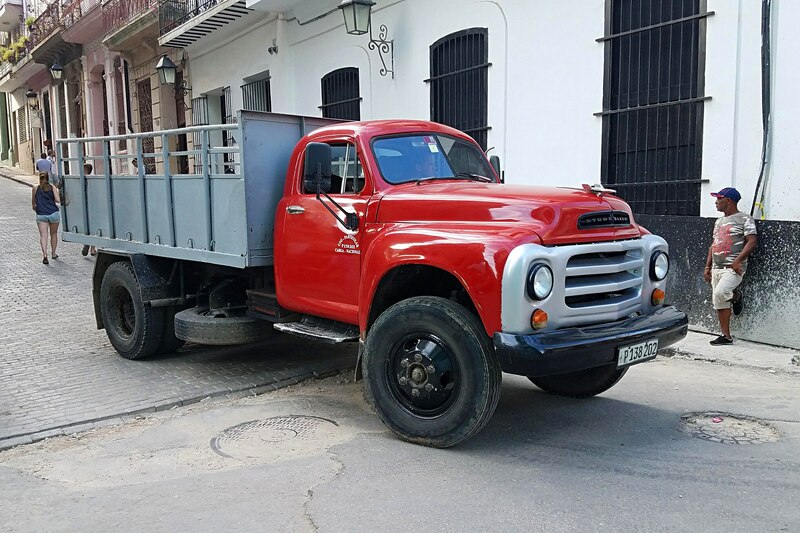 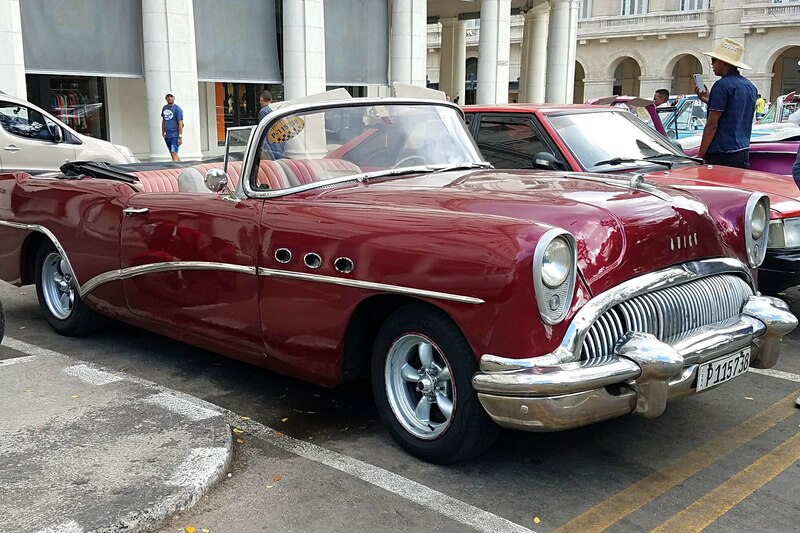 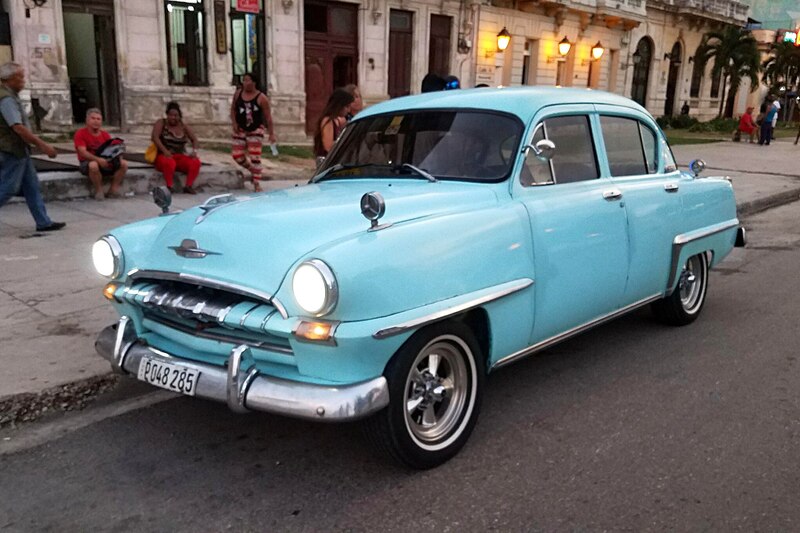 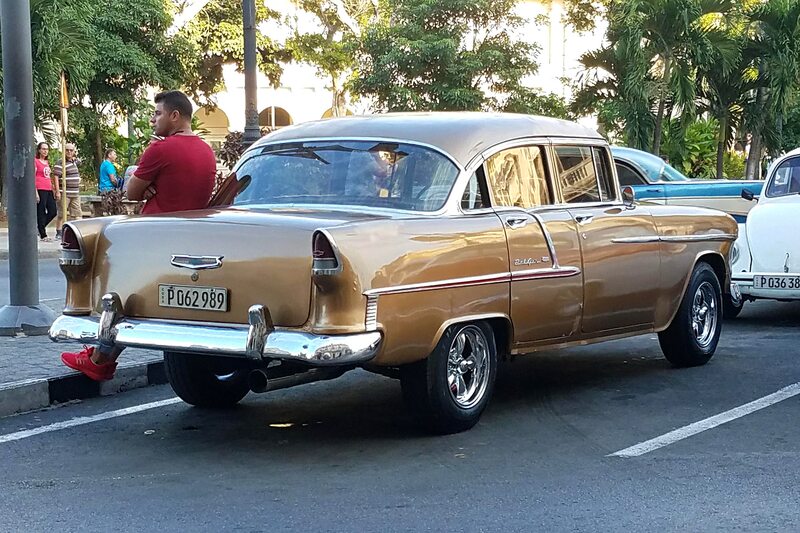 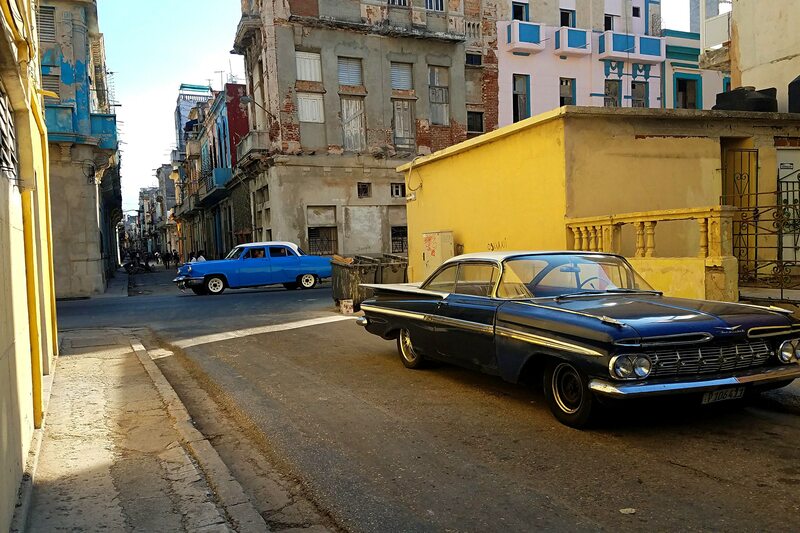 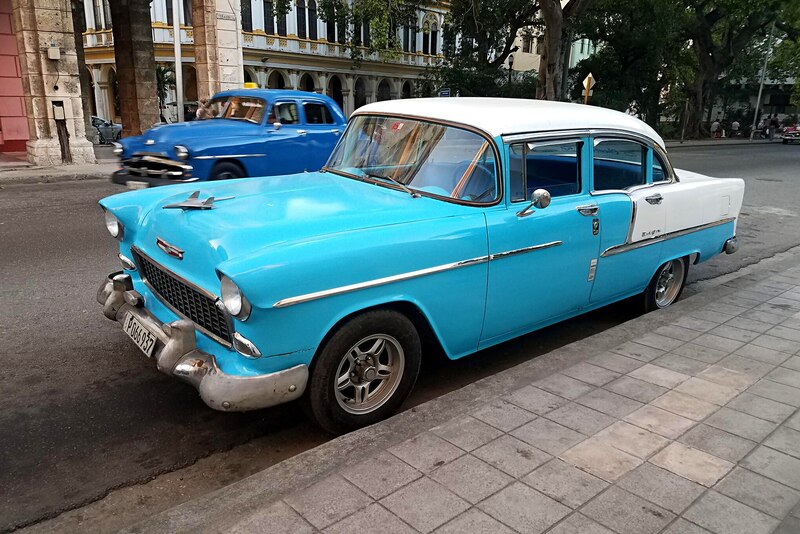 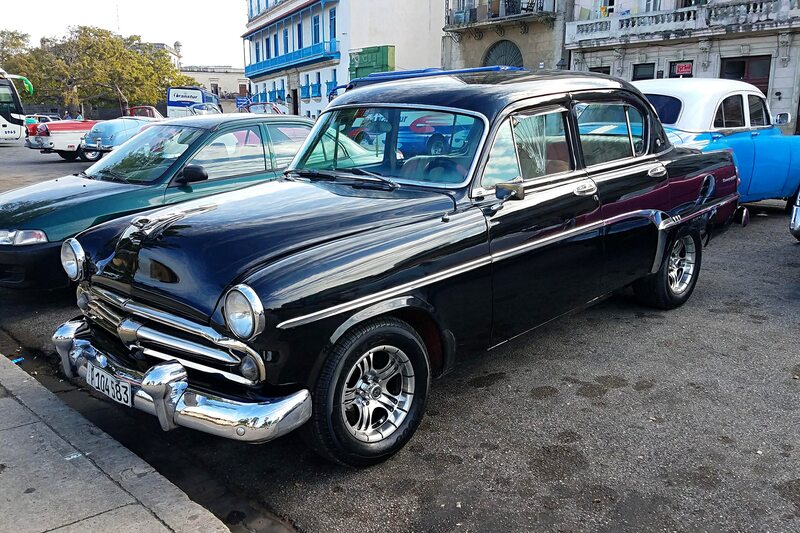 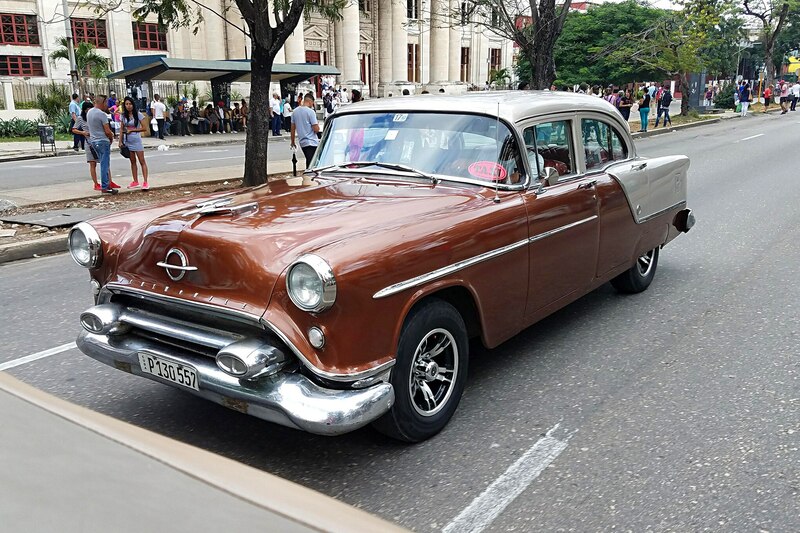 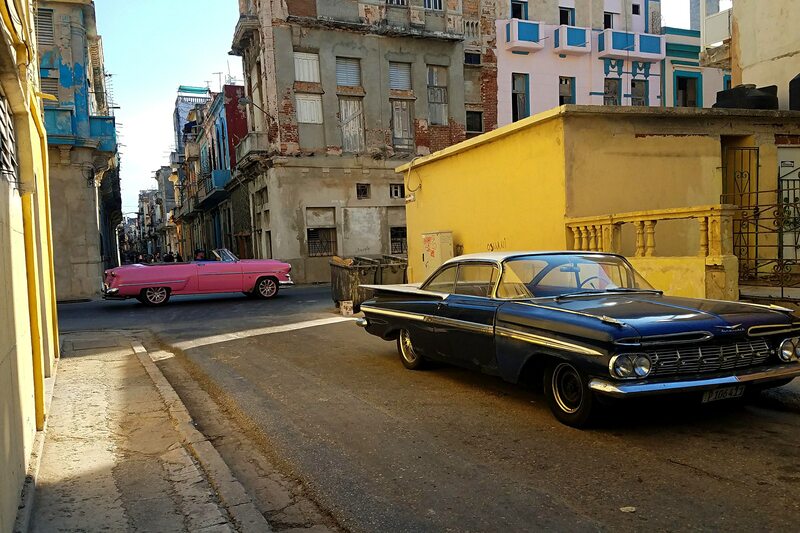 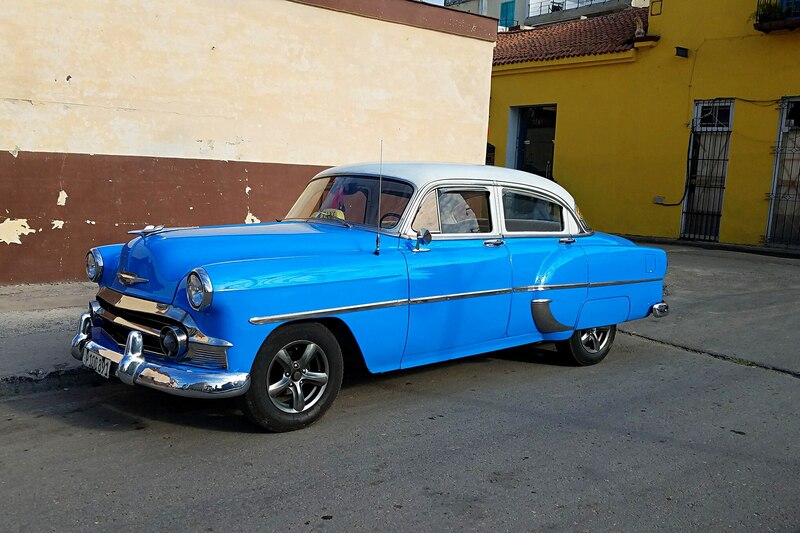 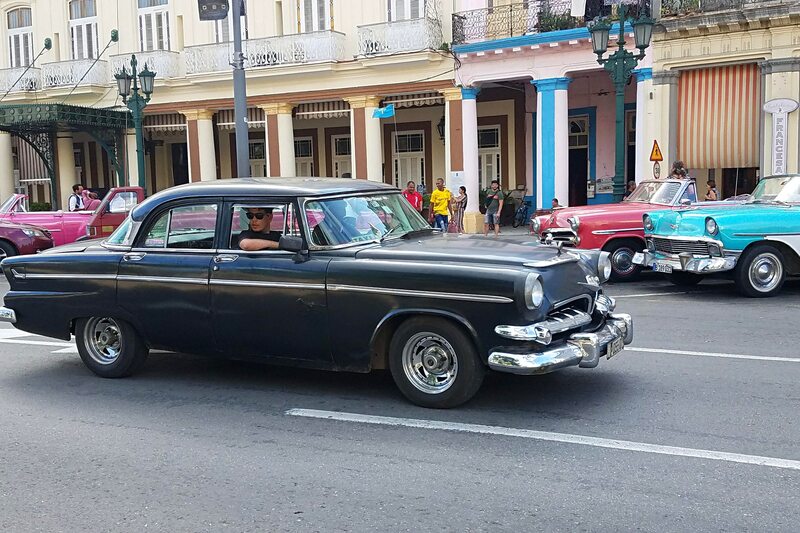 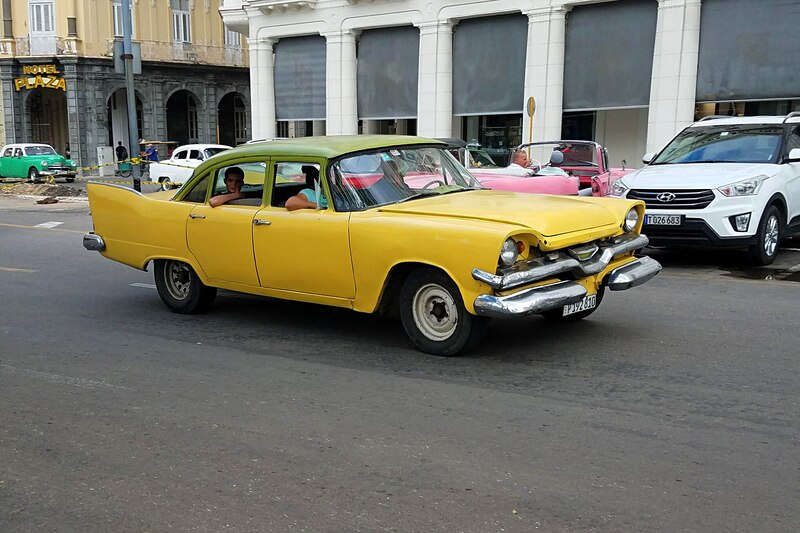 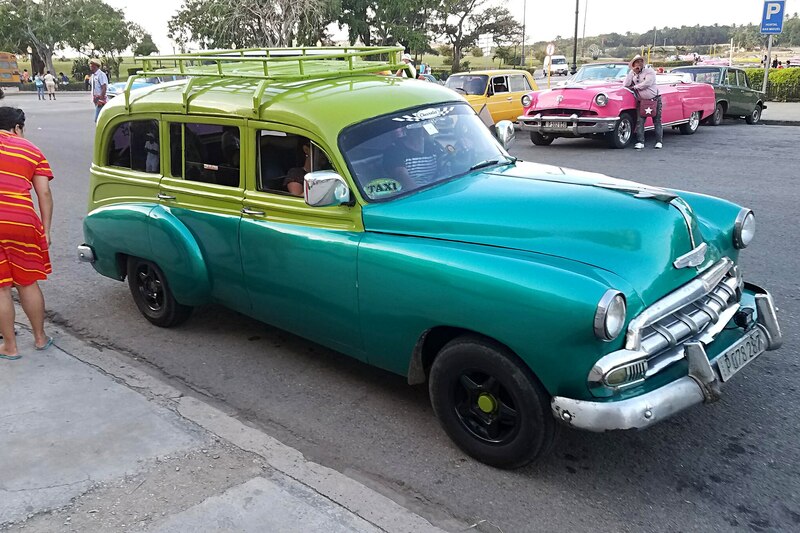 If someone were to say “Cuba” to a group of hot rodders, they’d probably conjure up images of old ’50s-era cars driving down city streets; a place where time had stopped back when cars still had large amounts of steel and chrome on them. 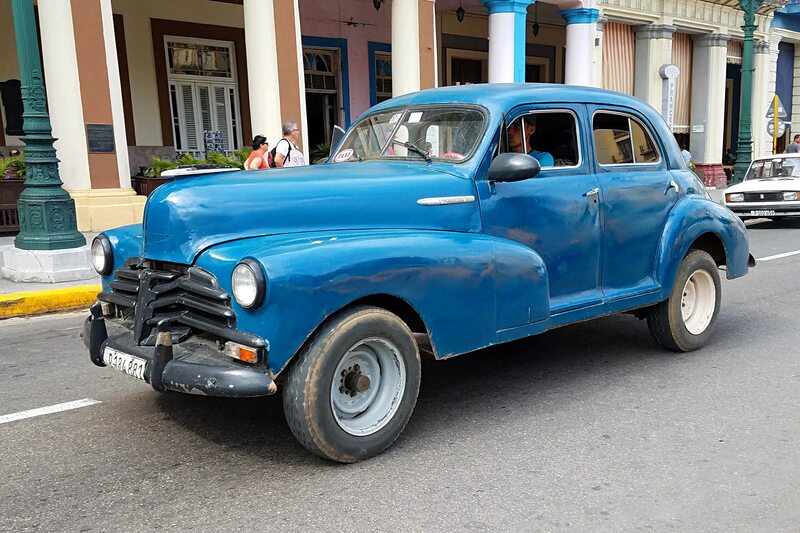 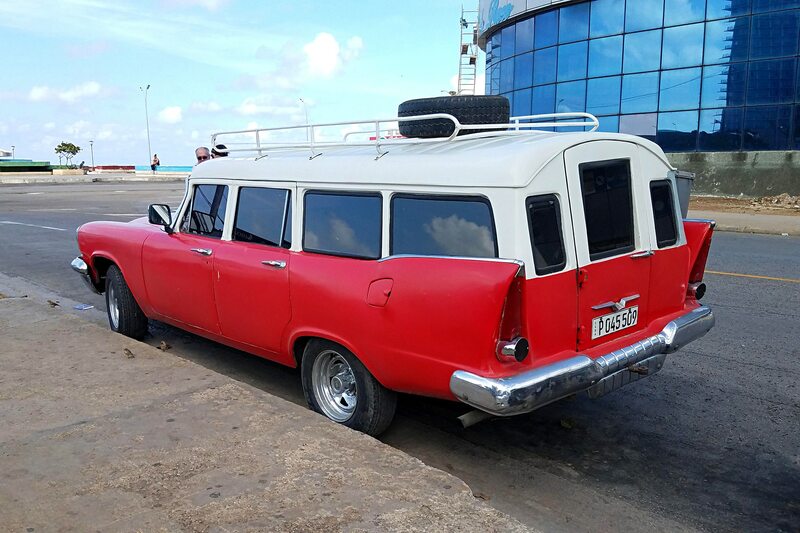 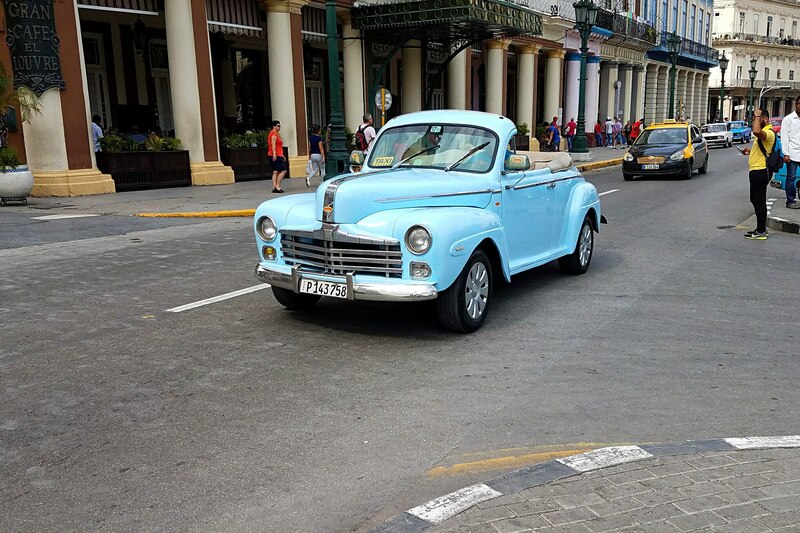 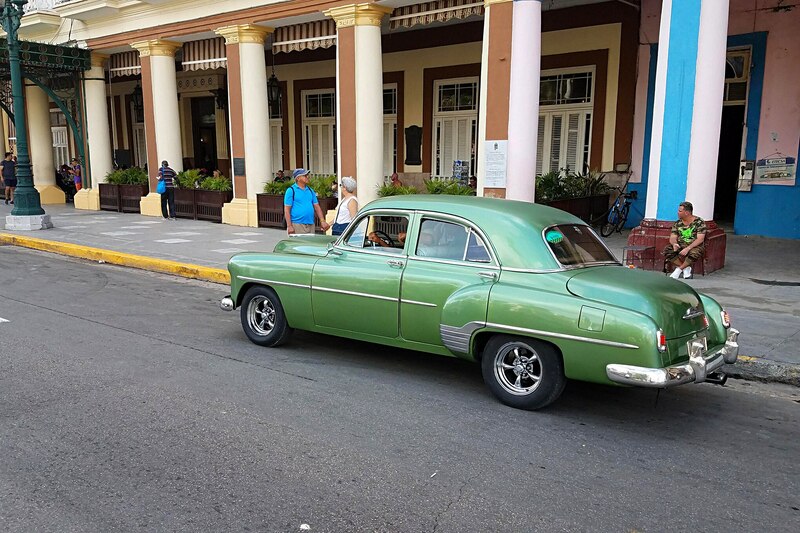 And though the lure of seeing all these old cars being used as daily drivers or taxis would be strong with these rodders, very few have ever seen it for themselves due to the travel restrictions put in place by the U.S. government preventing any kind of tourism with the island nation. 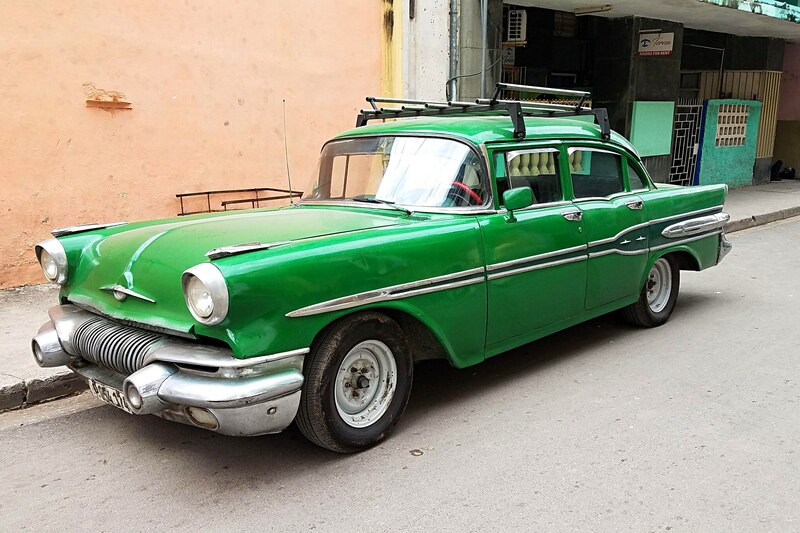 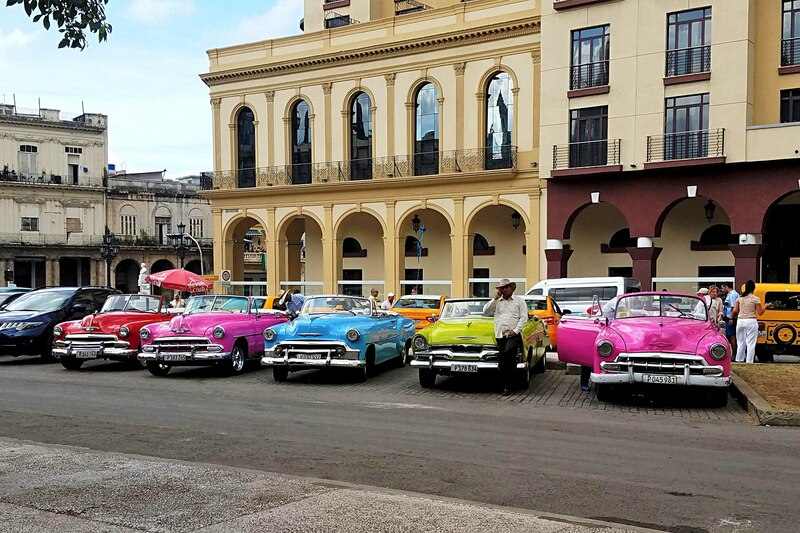 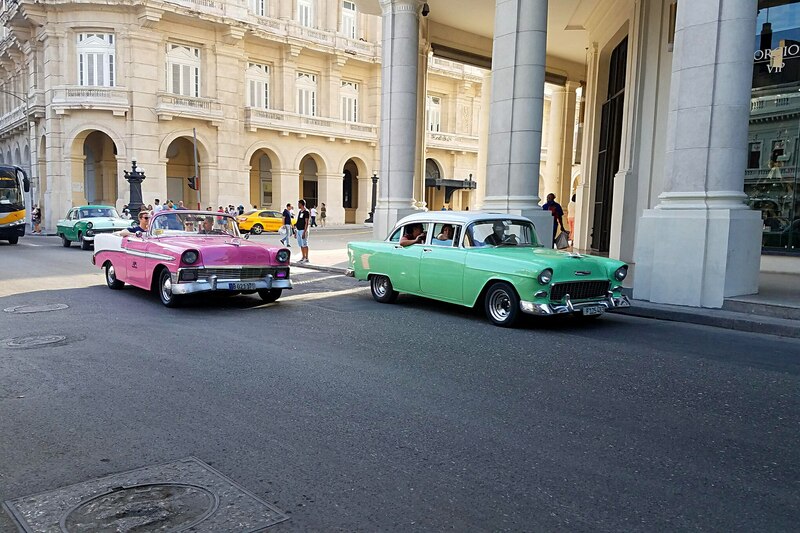 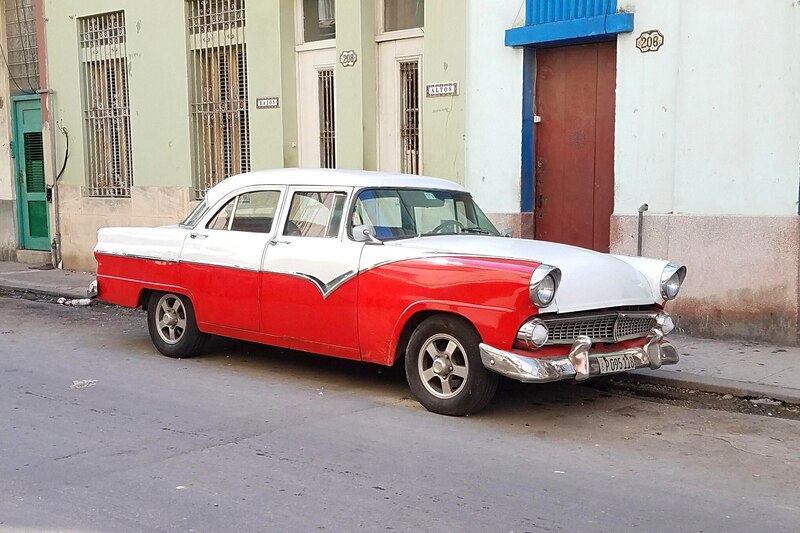 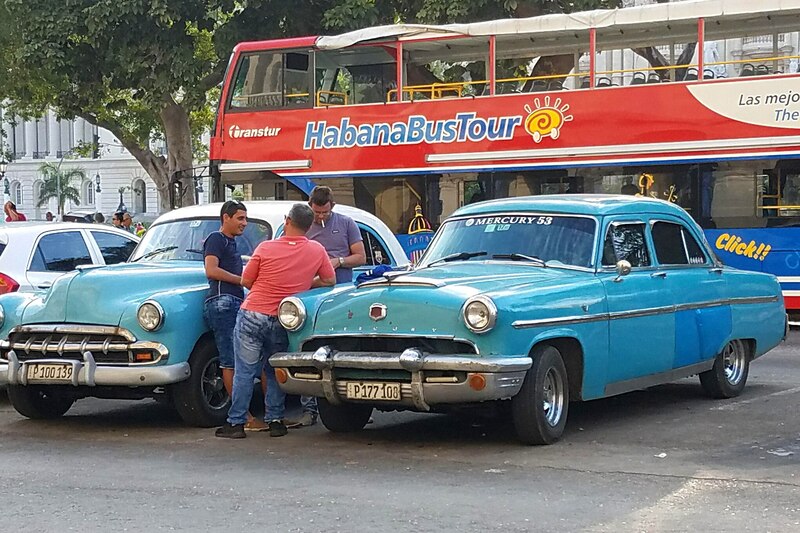 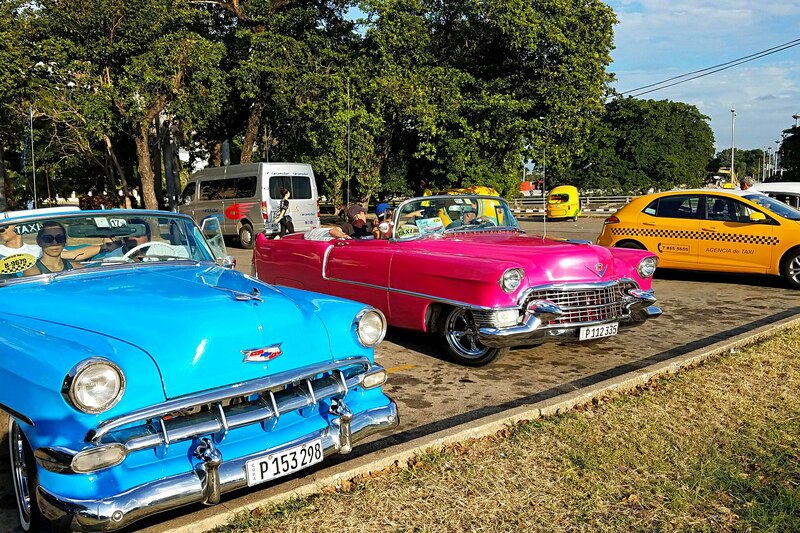 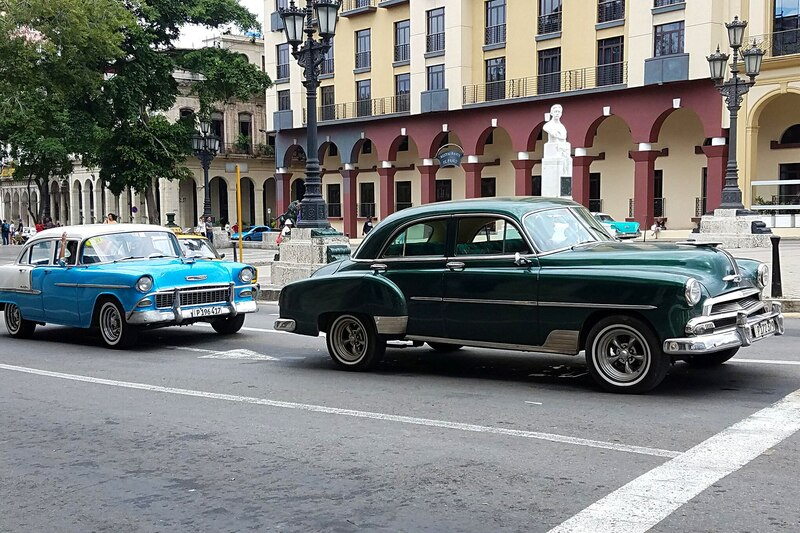 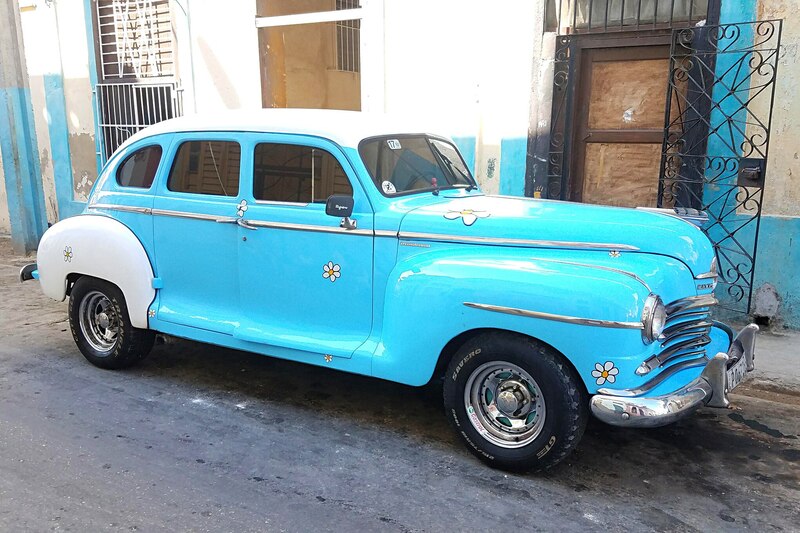 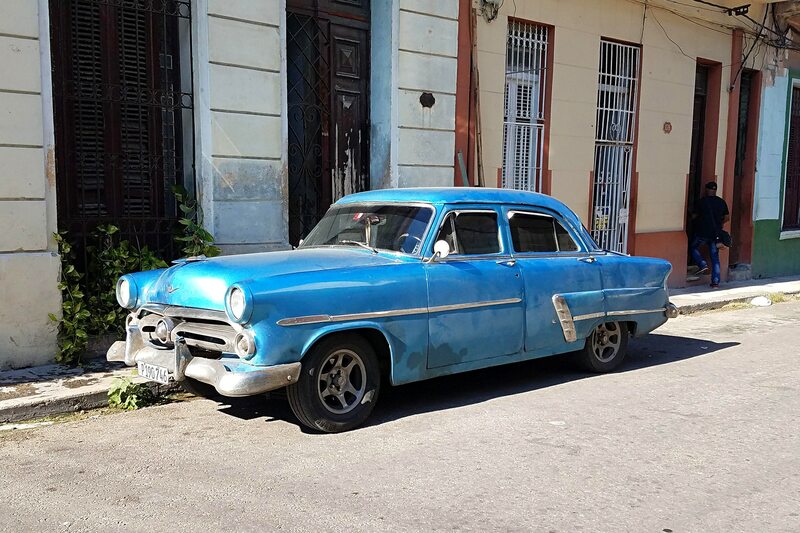 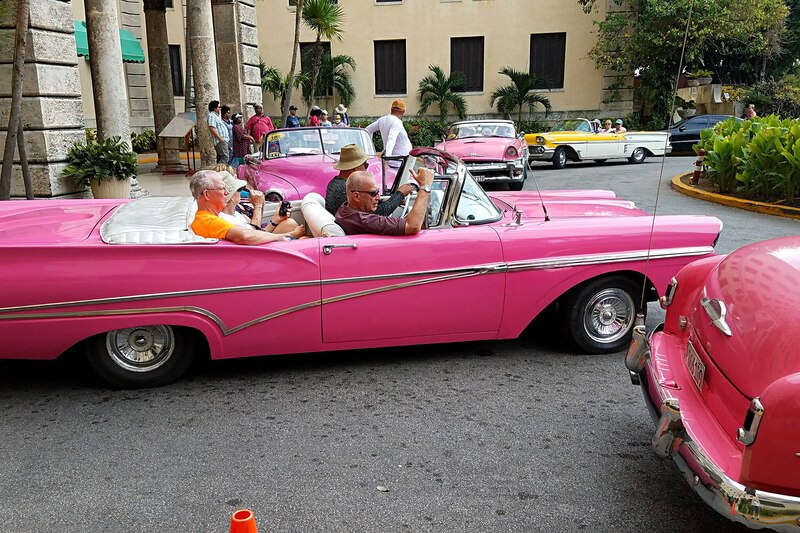 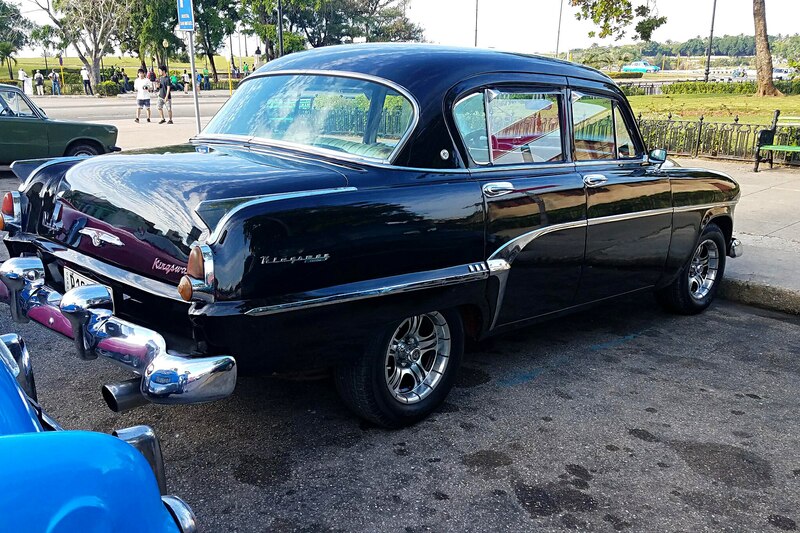 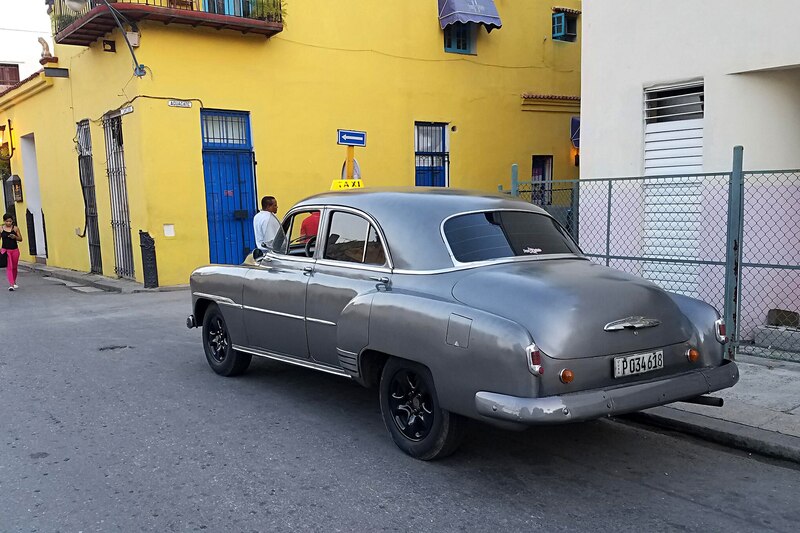 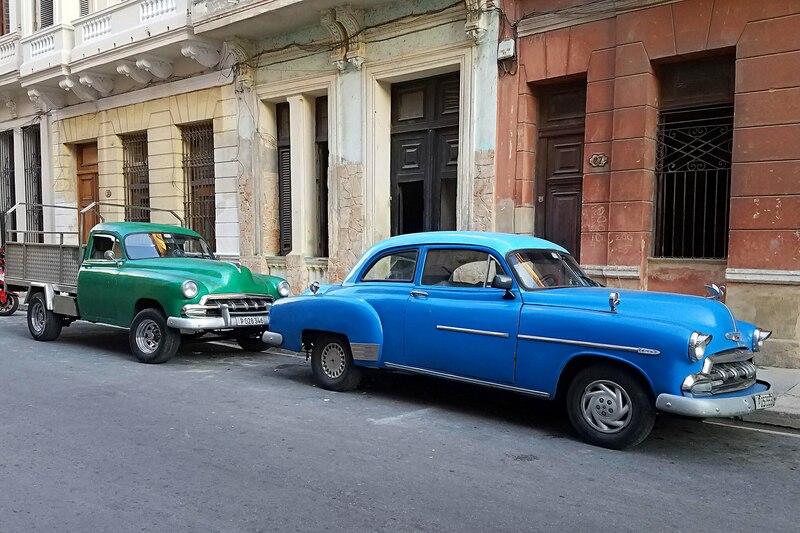 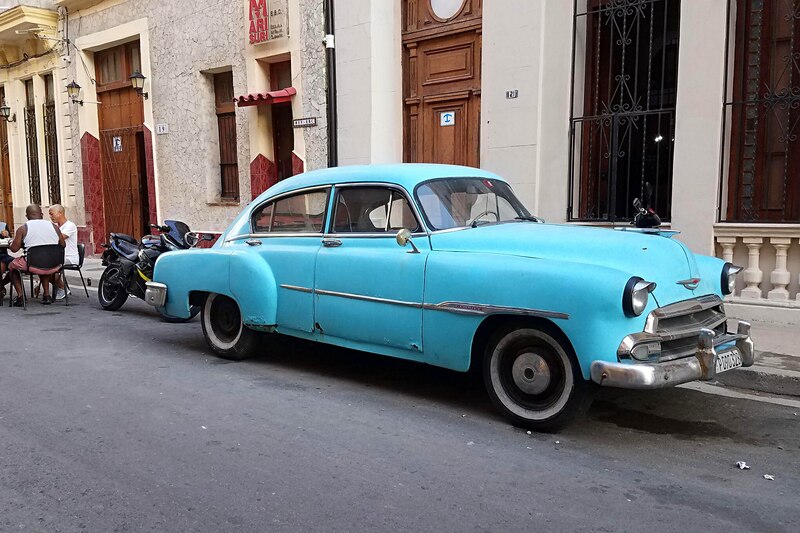 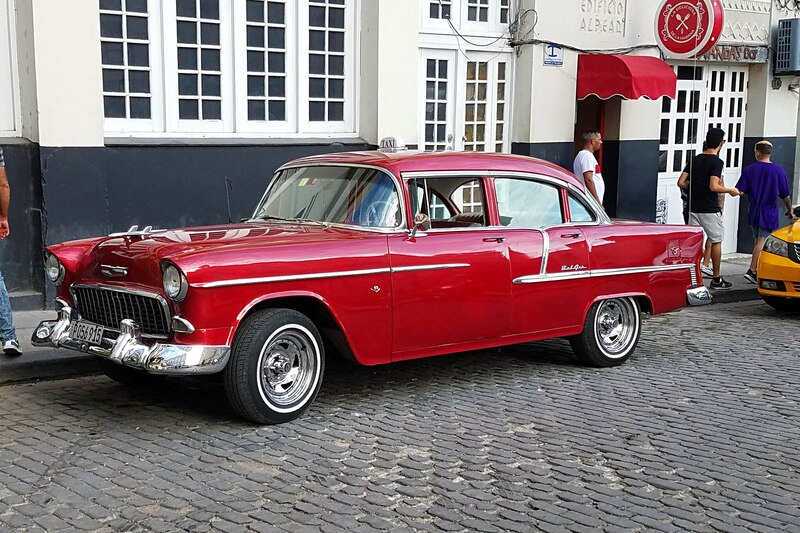 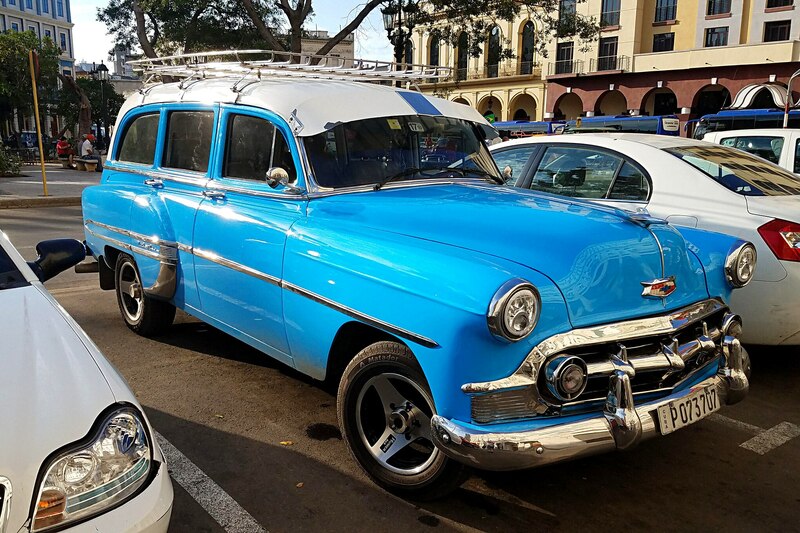 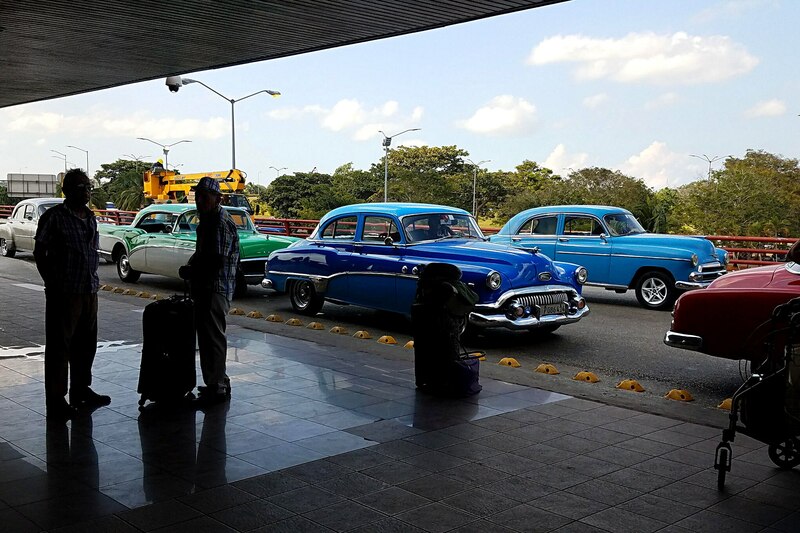 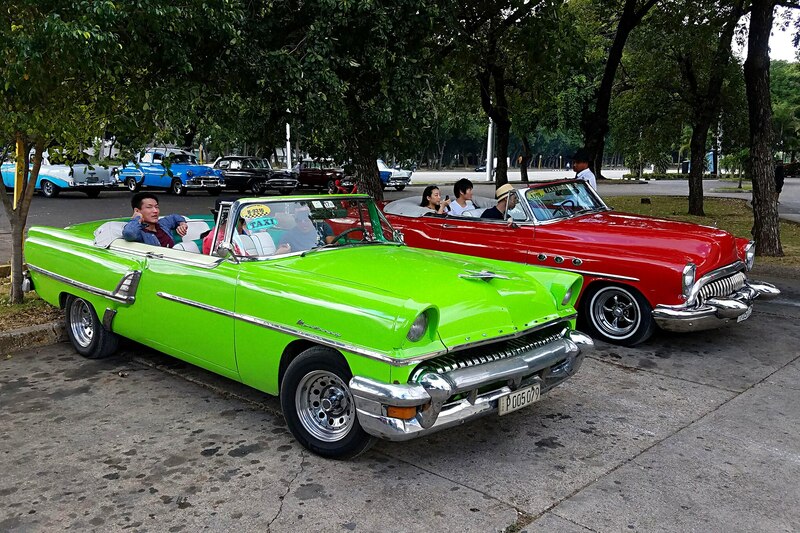 Like these rodders I, too, have wanted to see Cuba for years, but only recently was able to put together a trip together to fly from Miami to Havana to see for myself what it’s like, and I was blown away when I got there; American cars from the ’50s were everywhere. 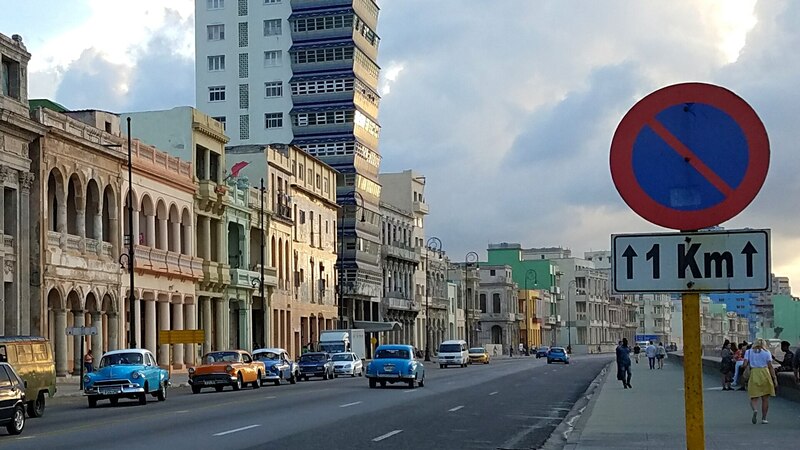 From the moment I left the airport and down the highway, to every single street I traveled on, at any hour and every day—there were so may you couldn’t figure out which way to look. 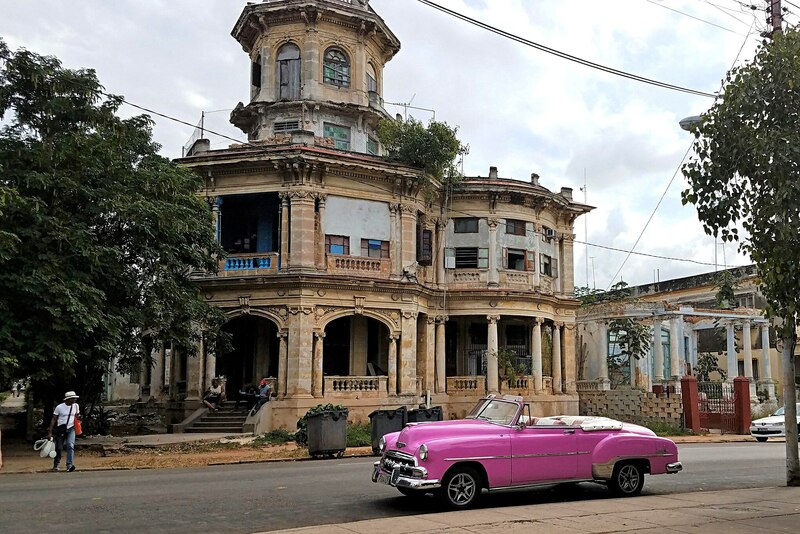 Old Habana (the Cuban spelling of Havana) has been around since the early 16th century, and much of the Spanish-influenced architecture is still in place, but much of it is in a serious state of disrepair. 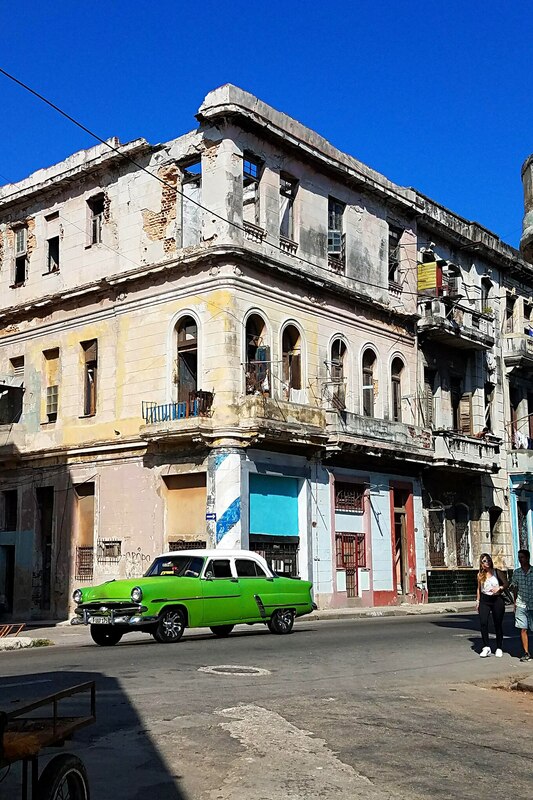 There are specific areas (where the tourists go) that is in decent shape, and a brand new Chinese hotel is being built in the midst of downtown, but most of the buildings in the immediate outskirts are crumbling and severely damaged by time. 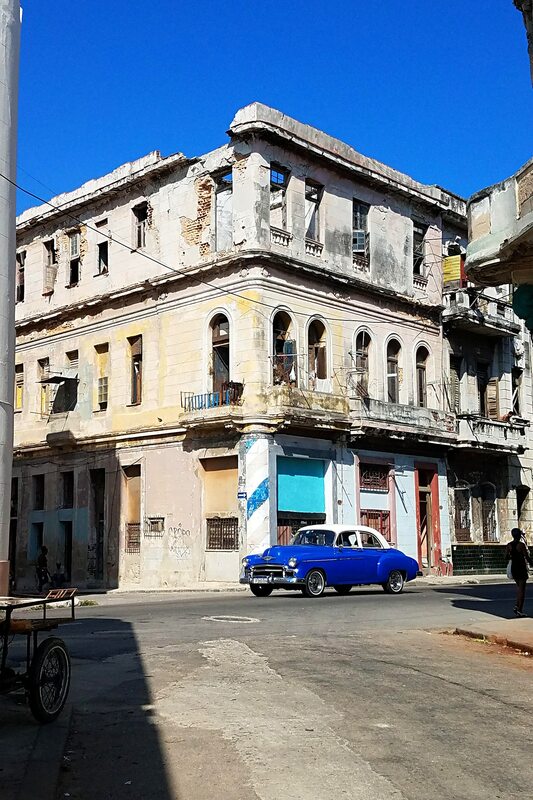 You can’t tell by looking at the buildings if the damage is from a recent hurricane or tornado or just not maintained for the past 80 or 100 years. 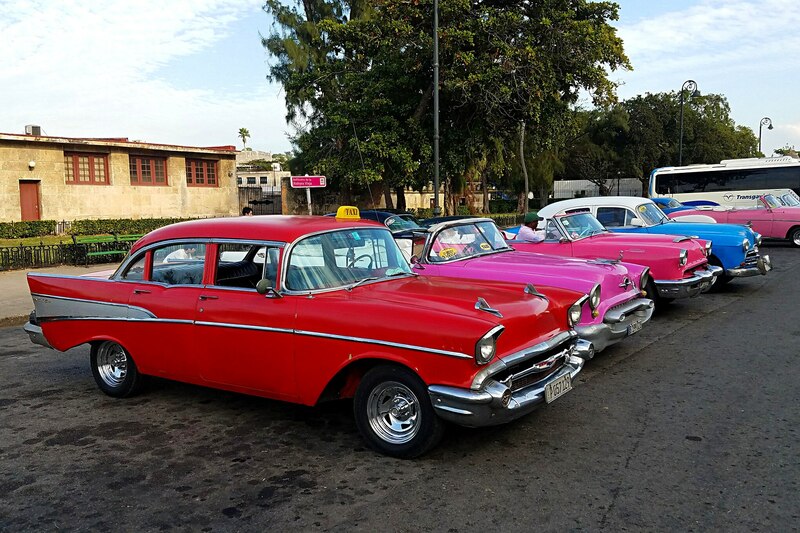 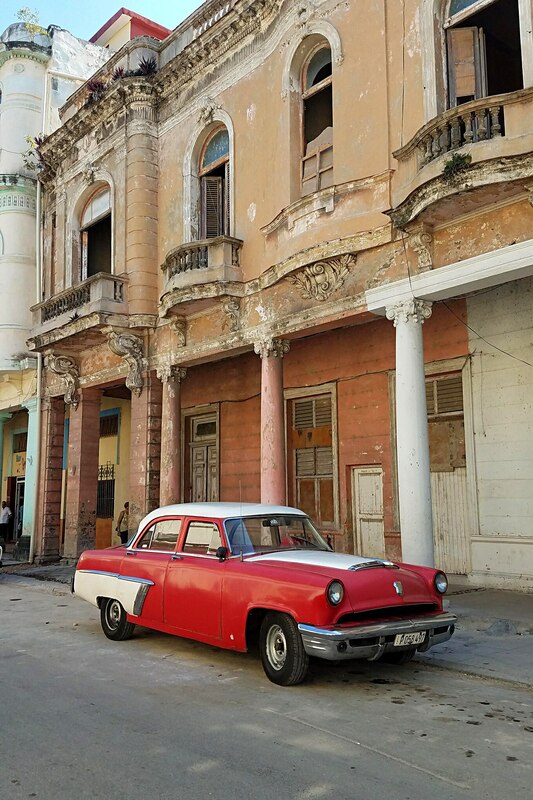 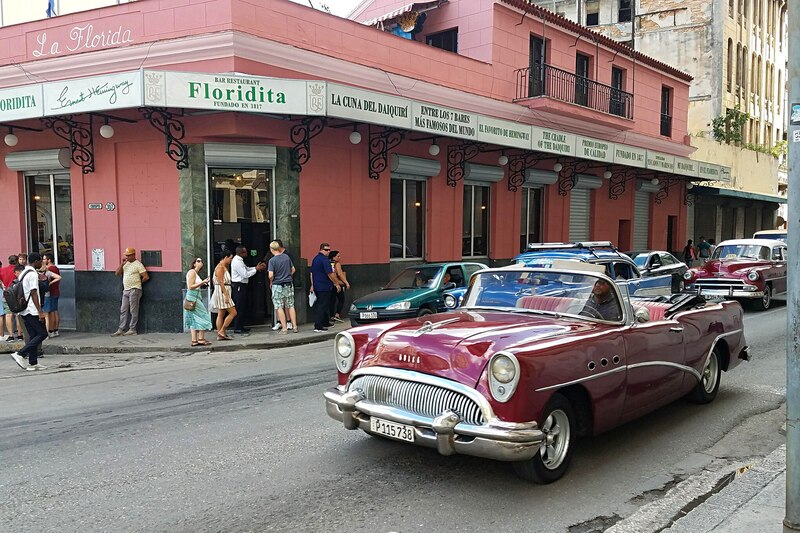 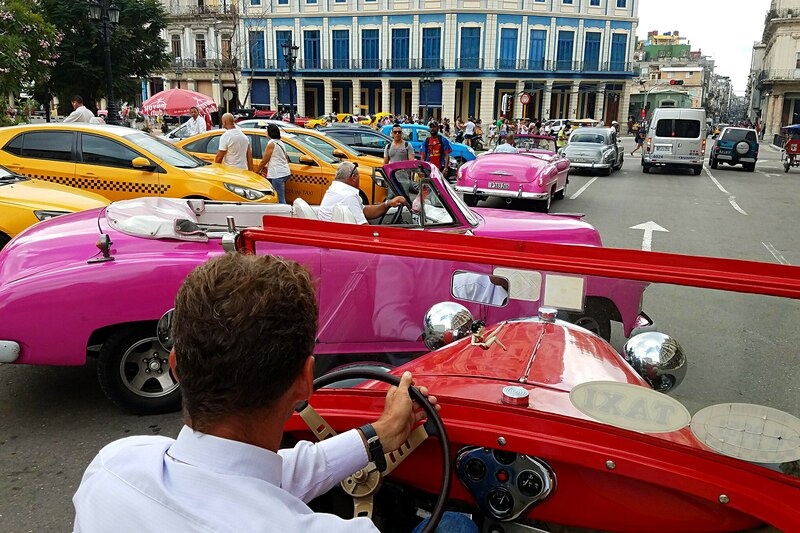 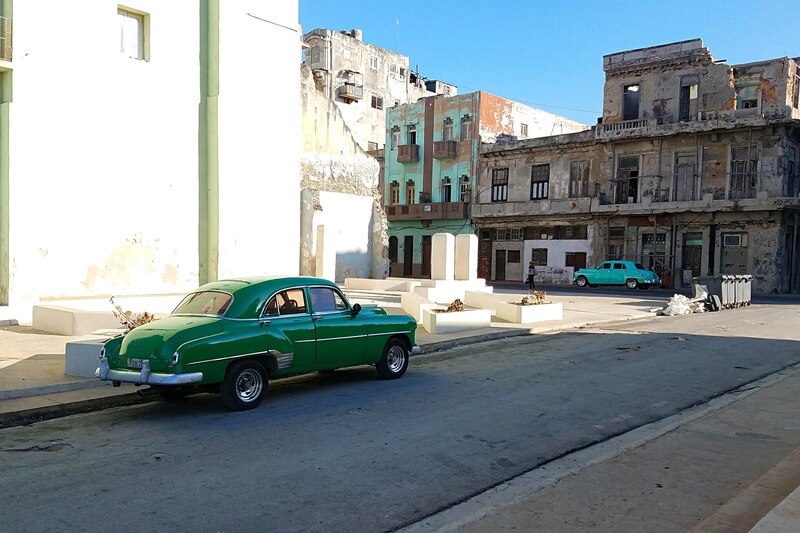 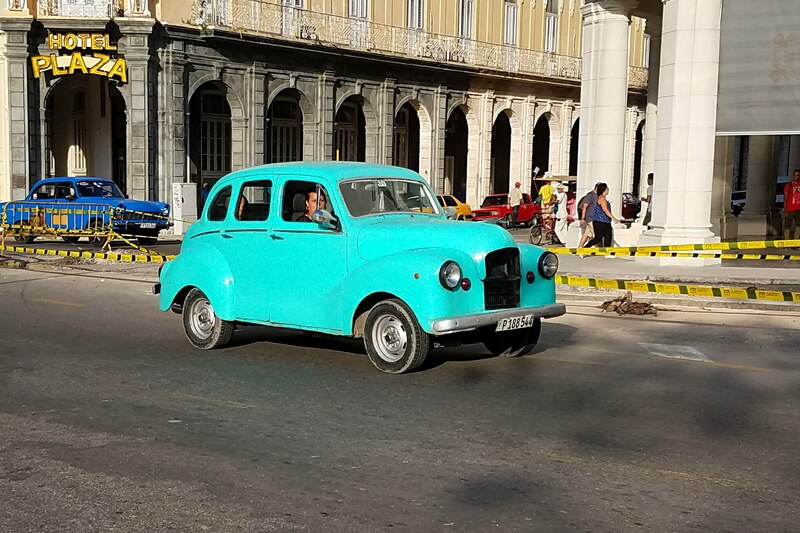 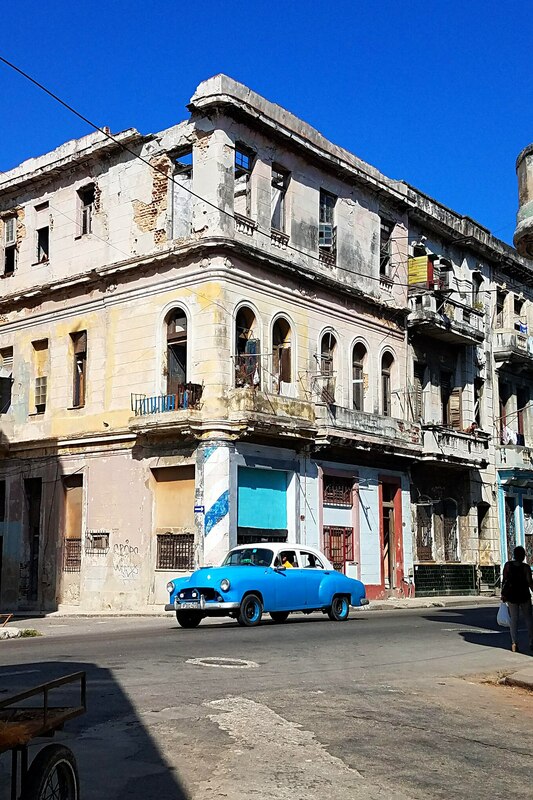 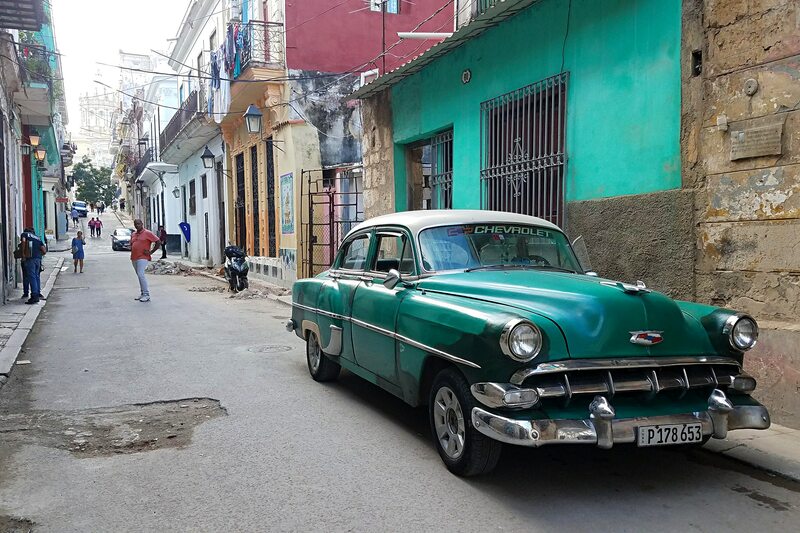 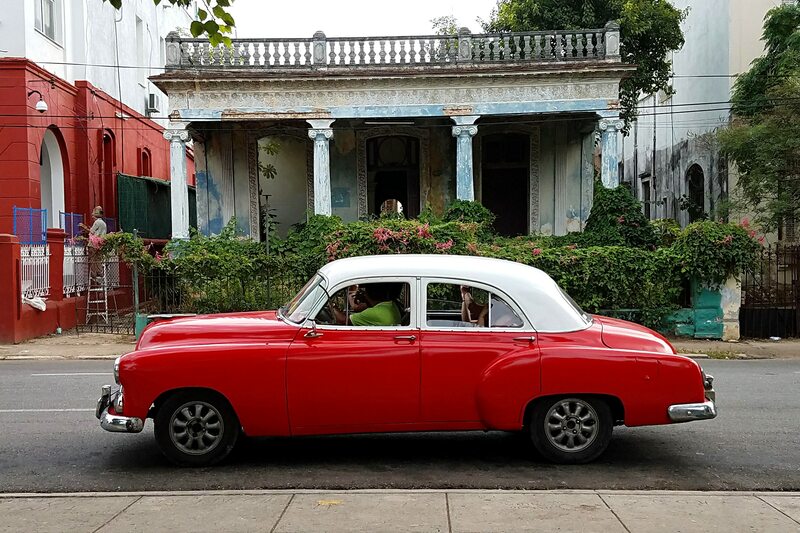 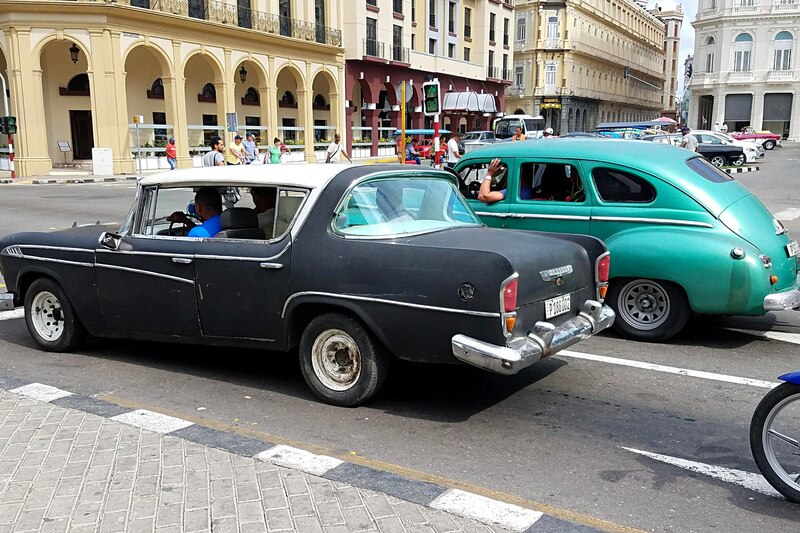 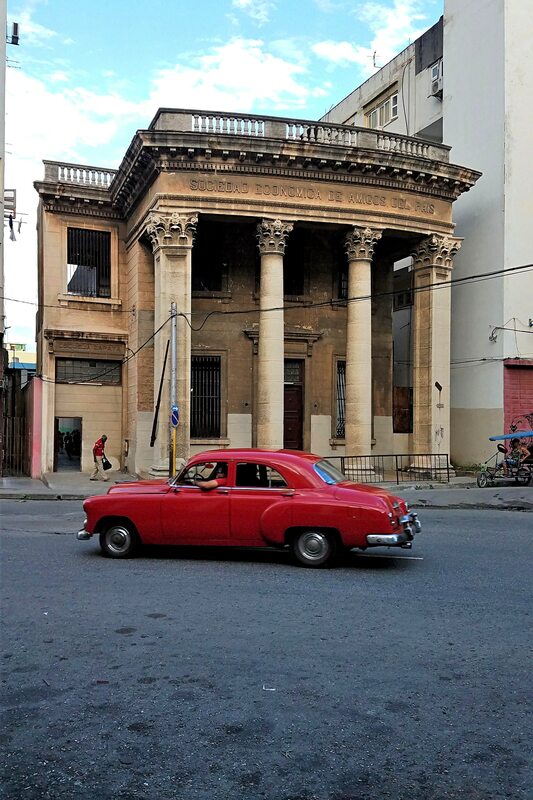 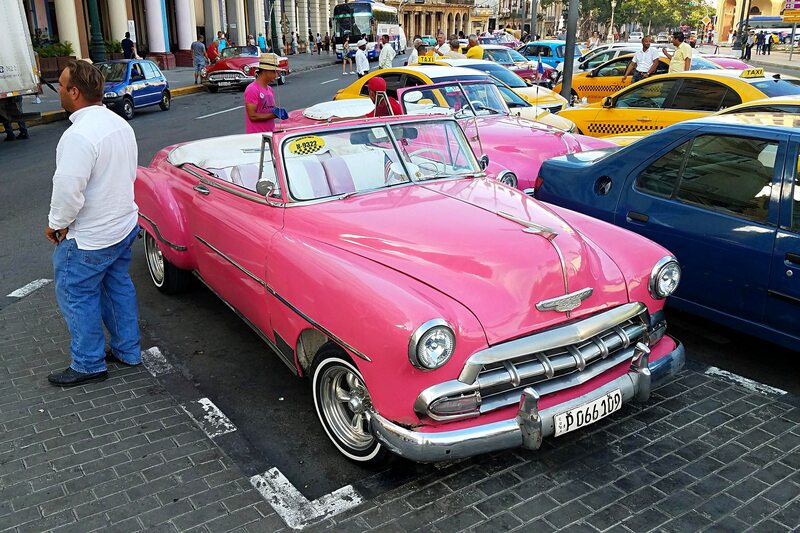 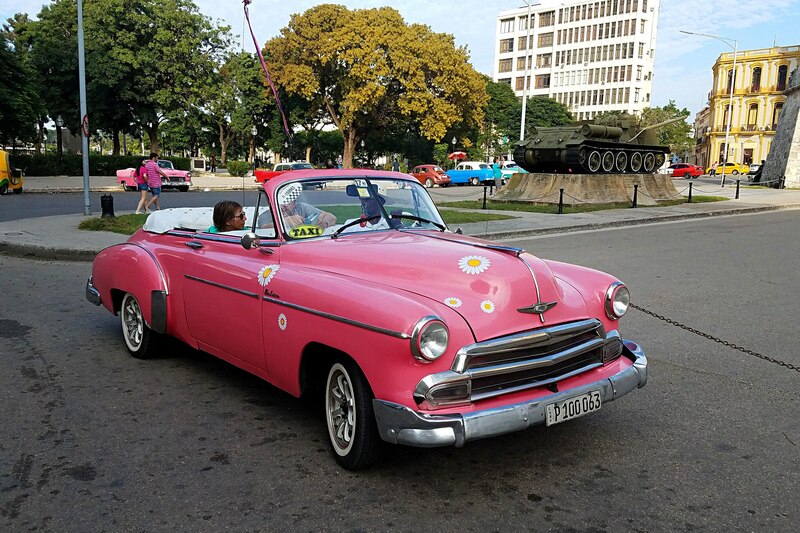 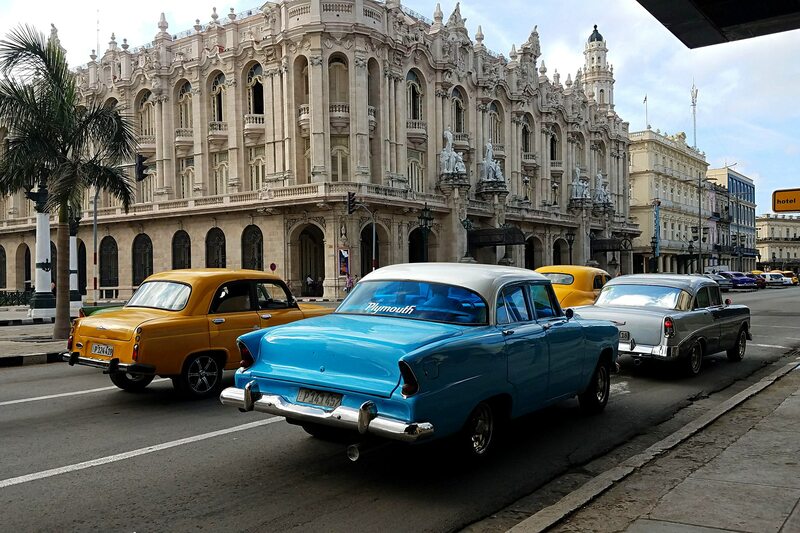 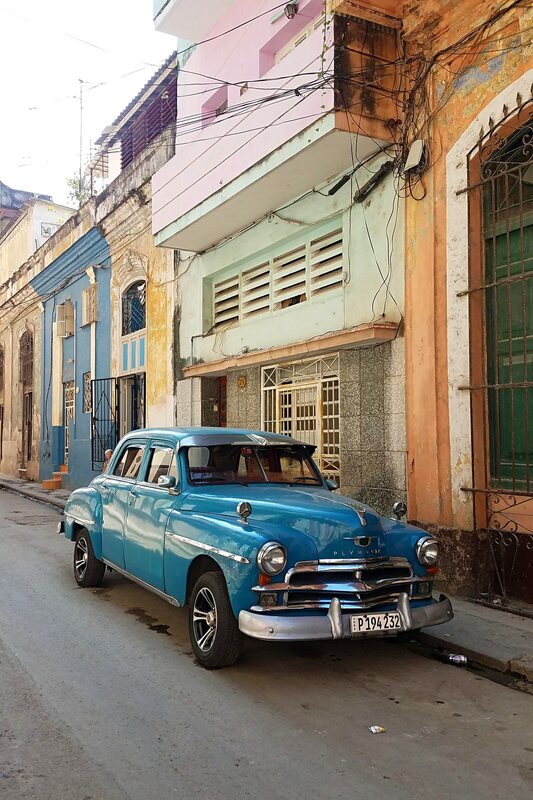 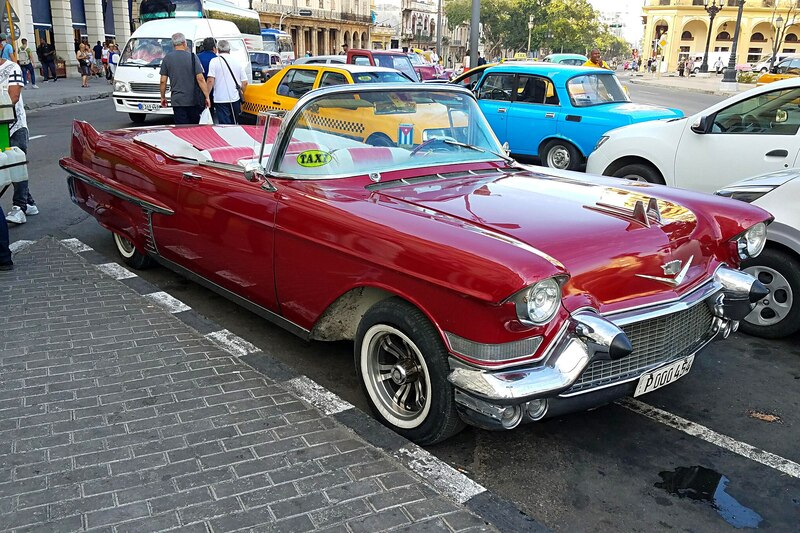 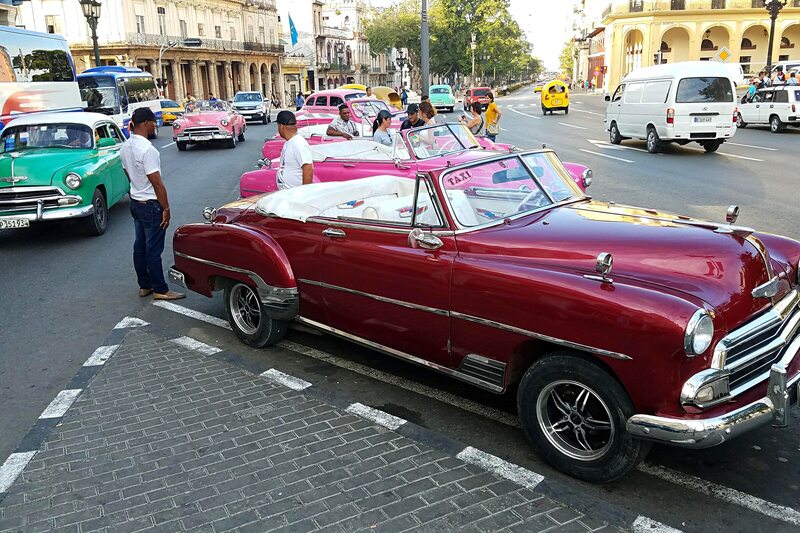 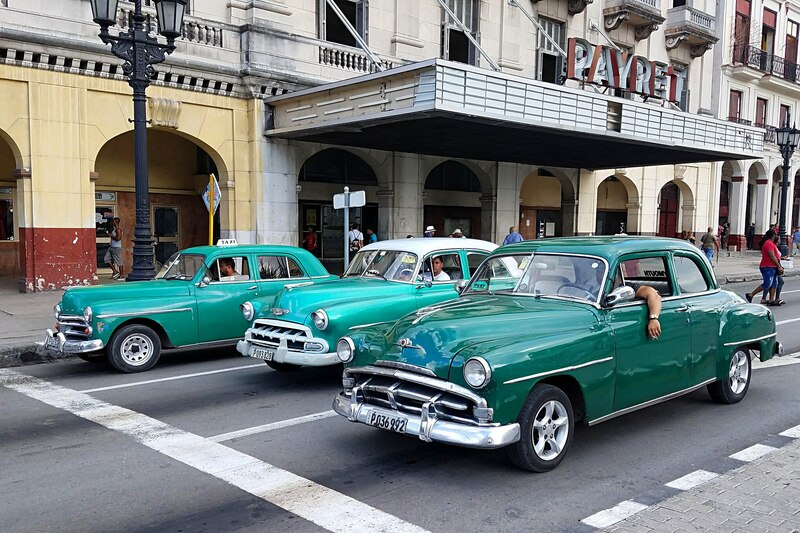 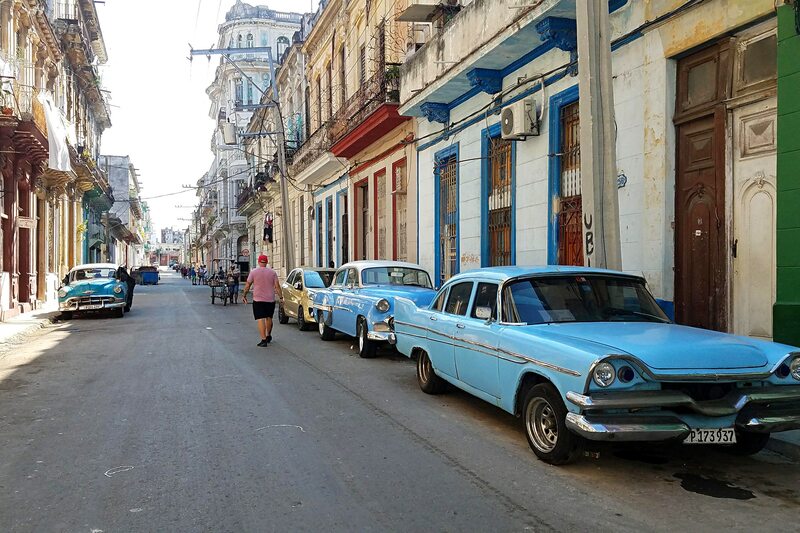 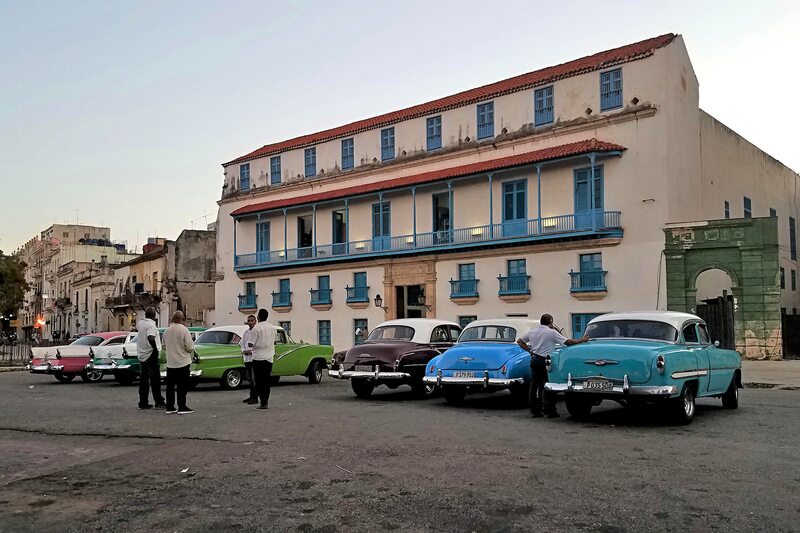 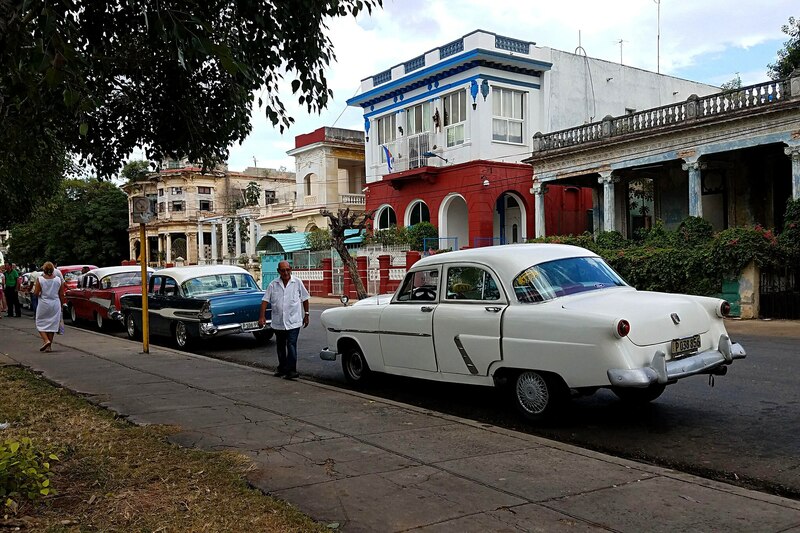 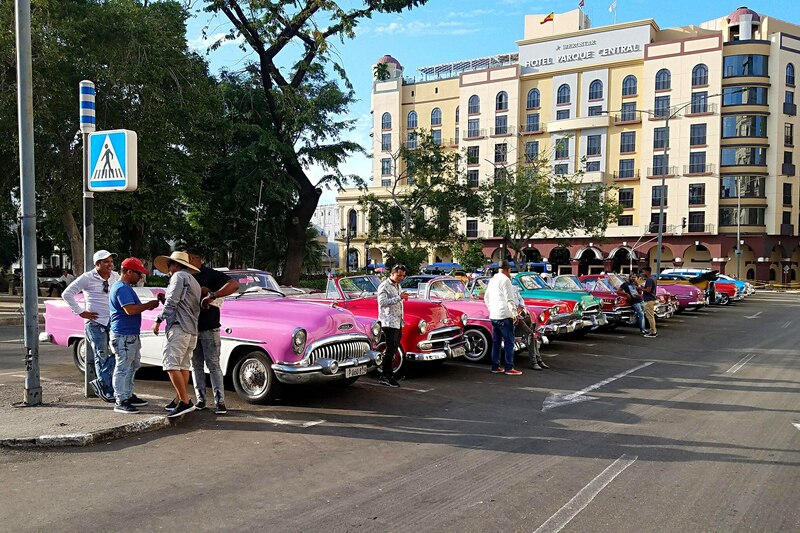 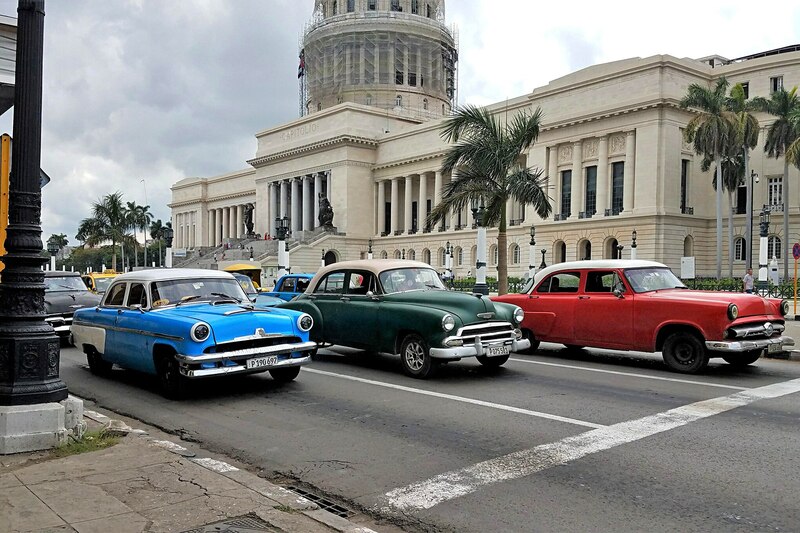 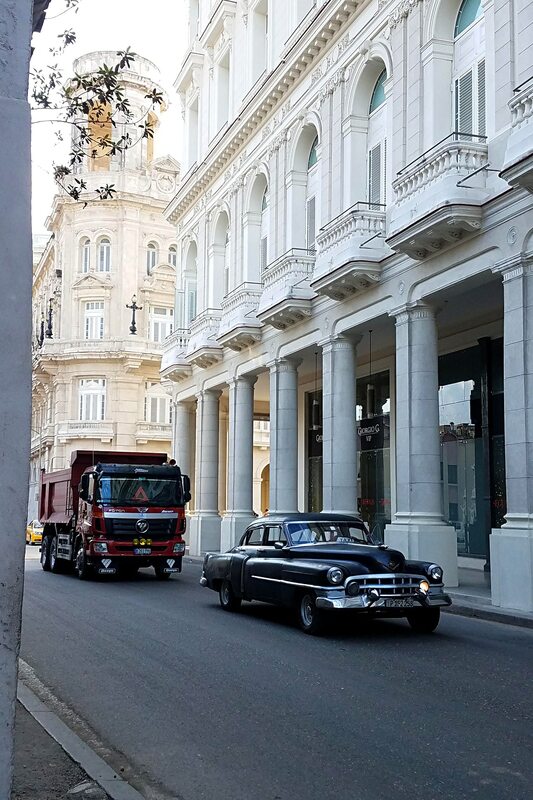 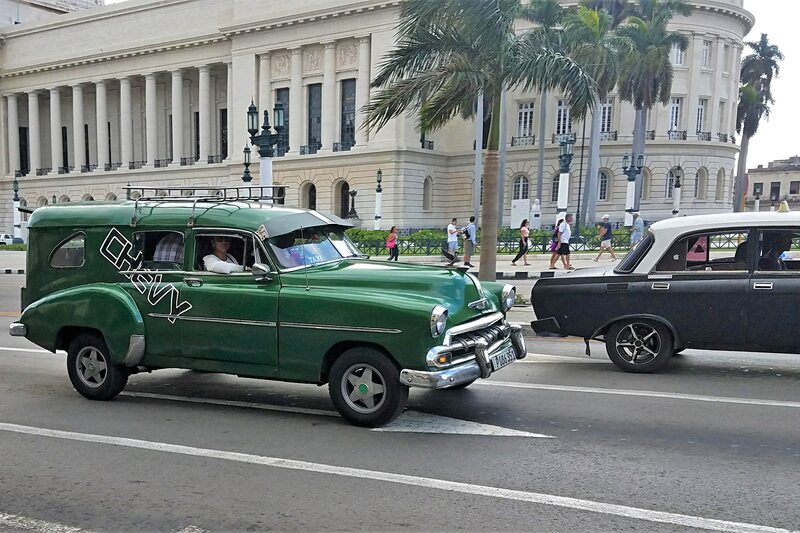 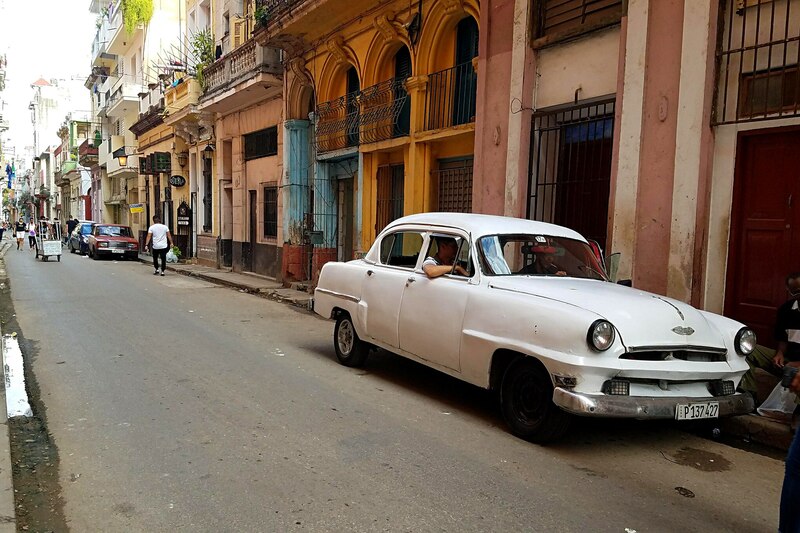 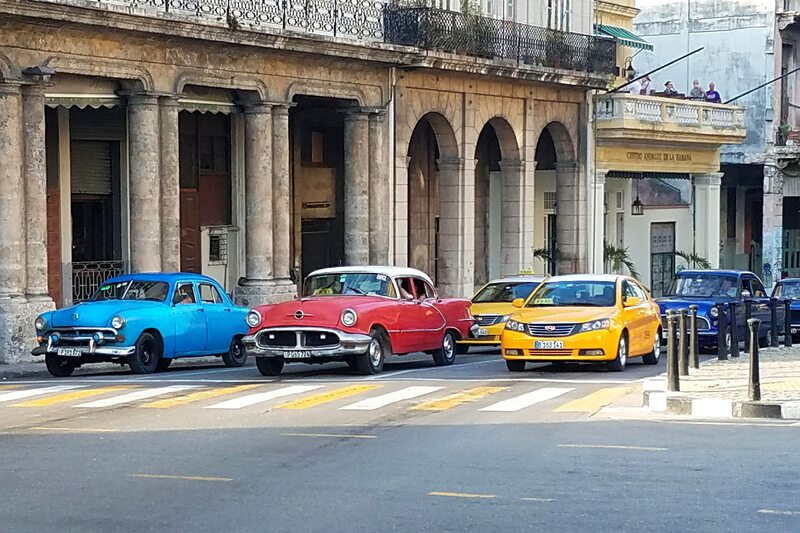 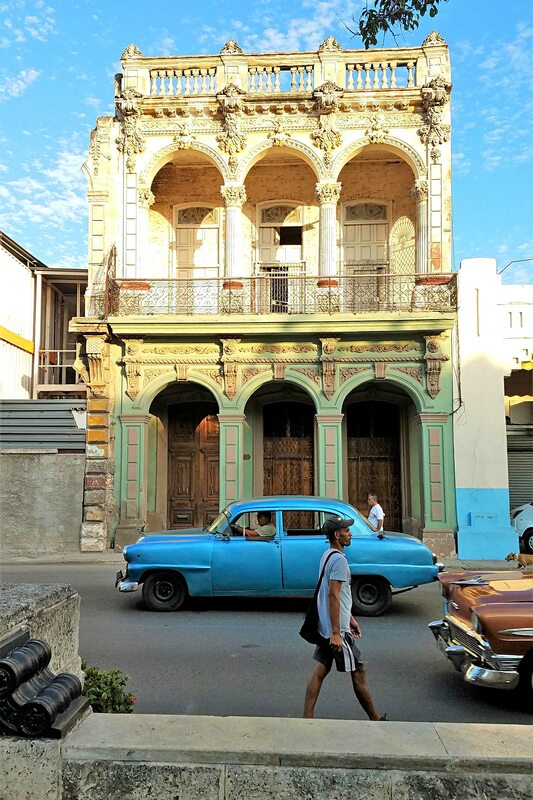 But the rest of the world has been visiting Cuba for decades, and a flood of enterprising taxi drivers tote euro tourists around the city while pointing out interesting spots in Cuban history. 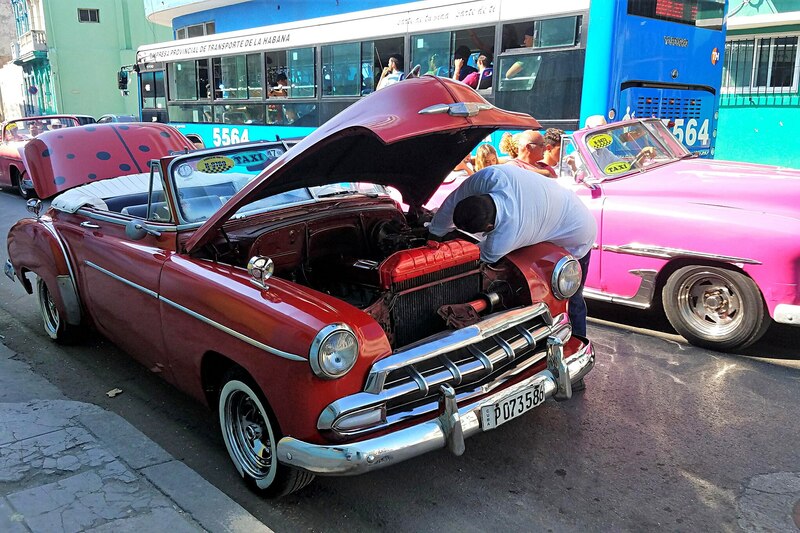 Most of these cars are late ’50s Chevrolets, but maybe 90 percent of the old cars I saw have had their drivetrains replaced by the more available Audi, Peugeot, or even Lada powerplants. 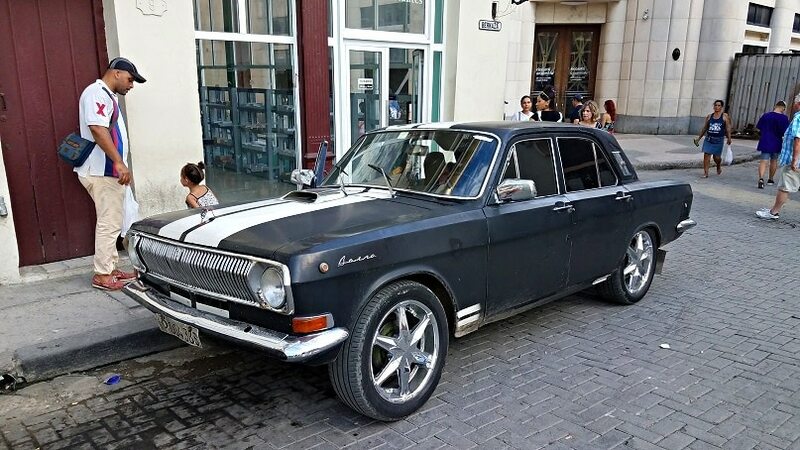 (The Soviet-made Lada, the third-most produced vehicle in the world behind the VW Bug and the Model T, was popular in eastern-bloc countries in the ’70s). 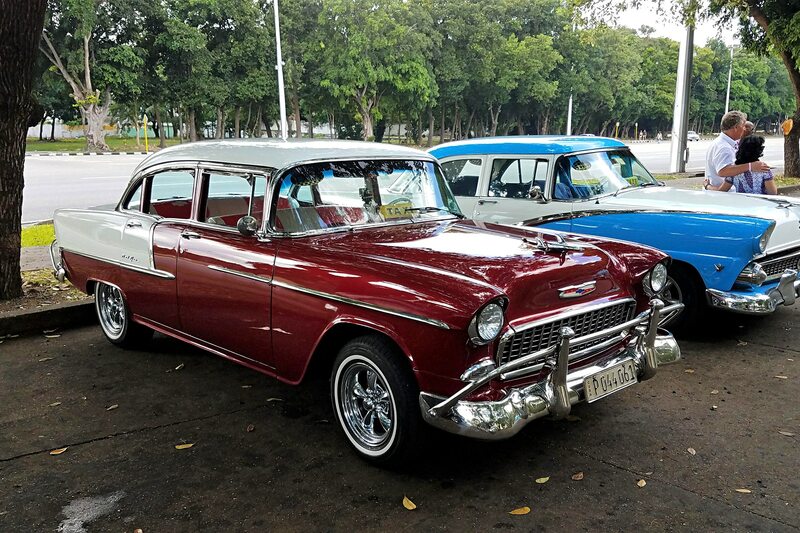 We ran across 1955 Chevys with 1.8-liter Korean diesel engines as well as Mercedes-powered Bel Airs. 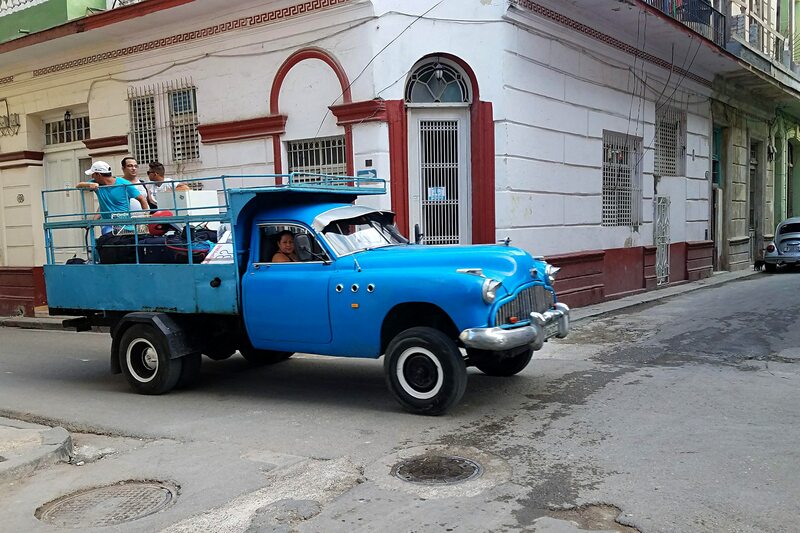 Still, it seems there are more Chevys driving around Cuba’s capitol than you might find at the Street Rod Nationals, and they use them every single day in every which way they can; usually as taxis but also for those employed in a construction or fabrication trade to haul goods in makeshift trailers. 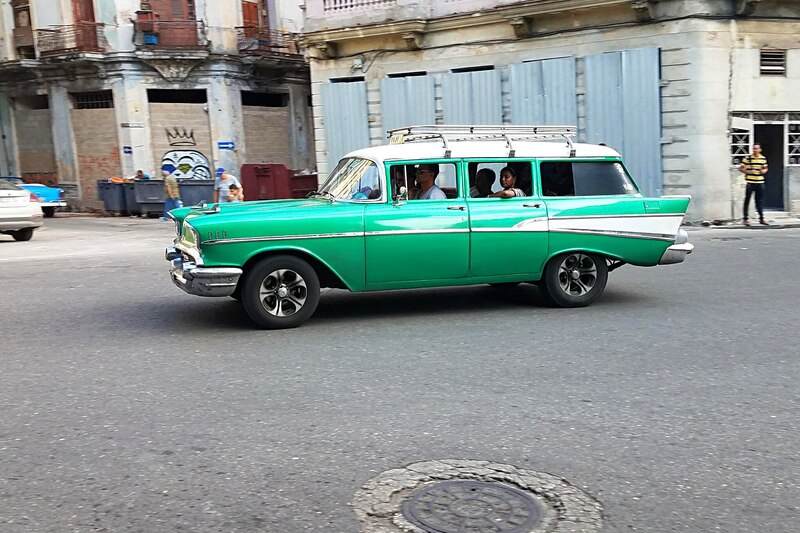 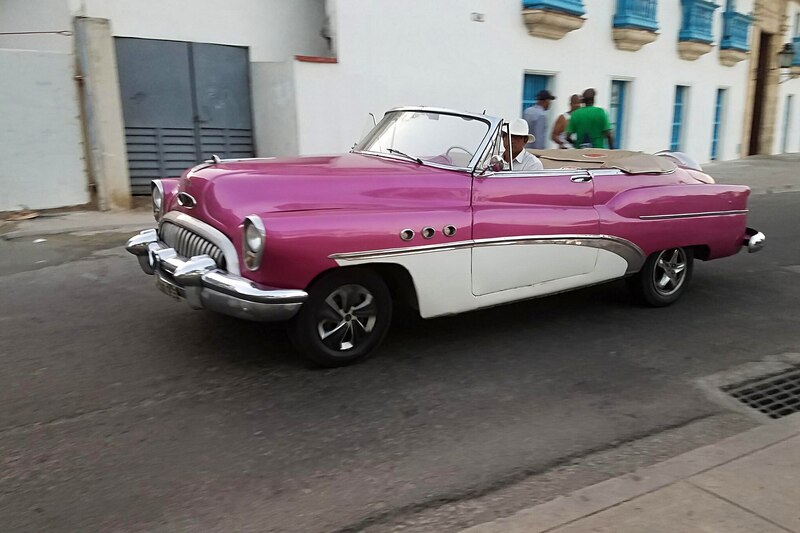 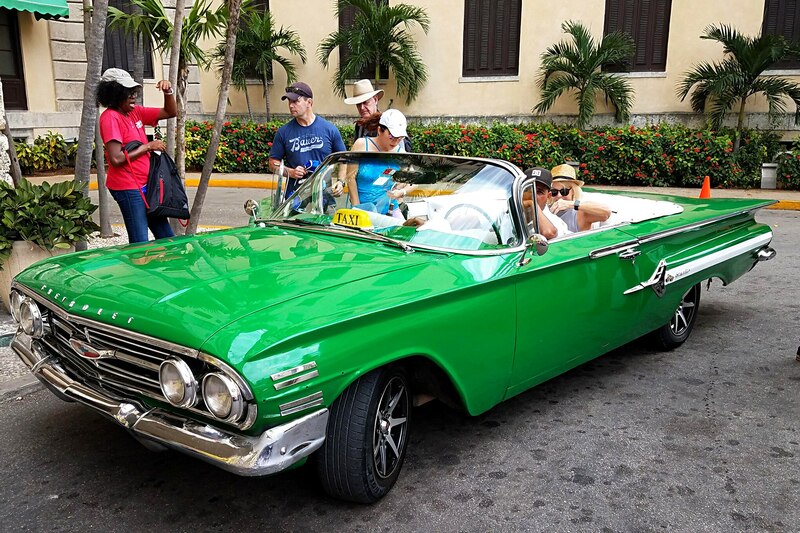 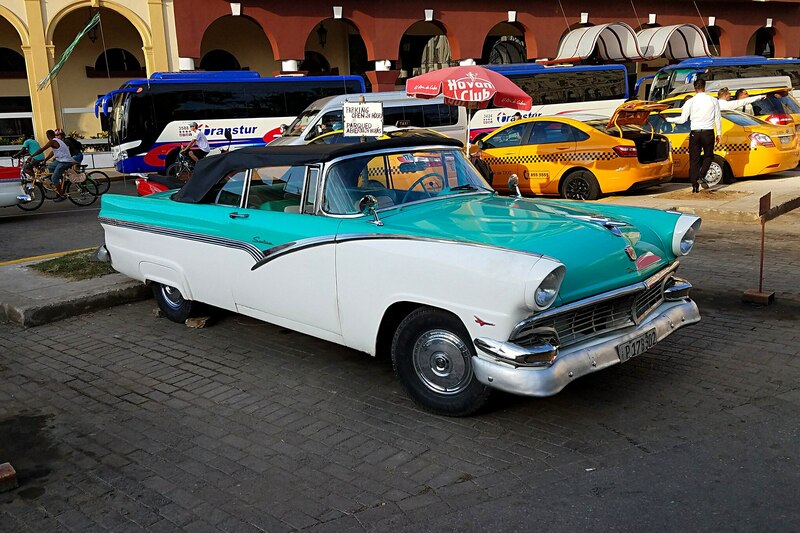 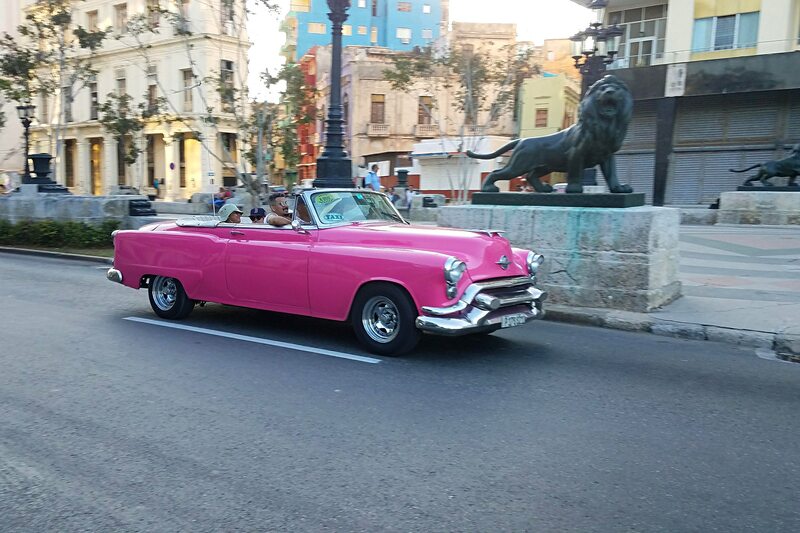 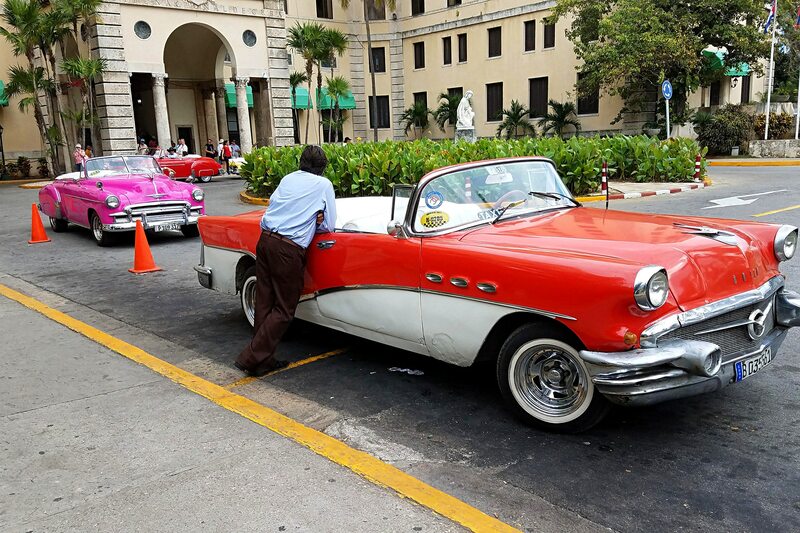 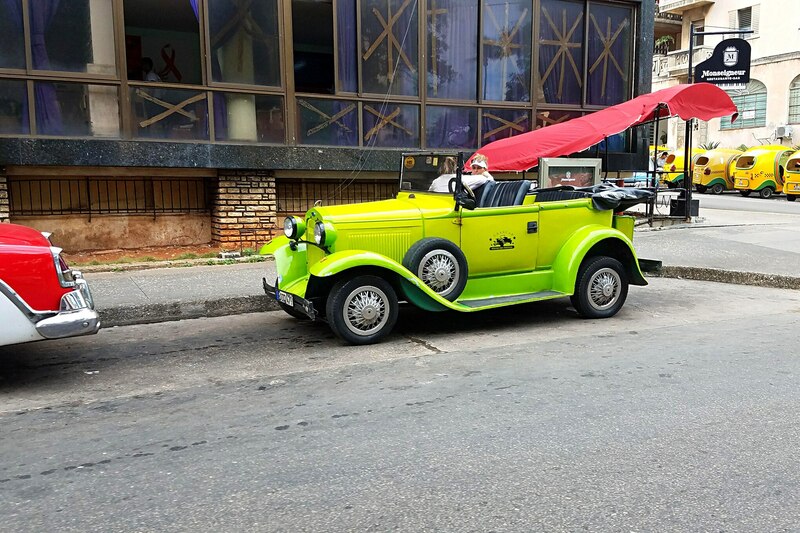 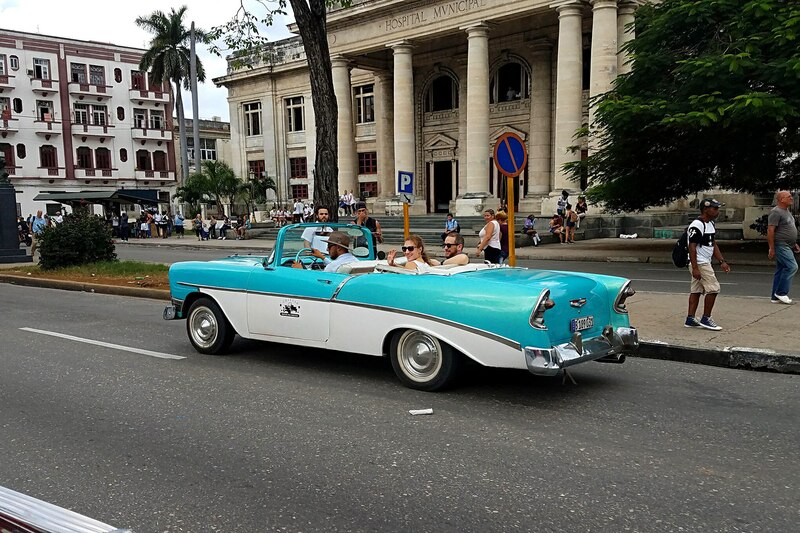 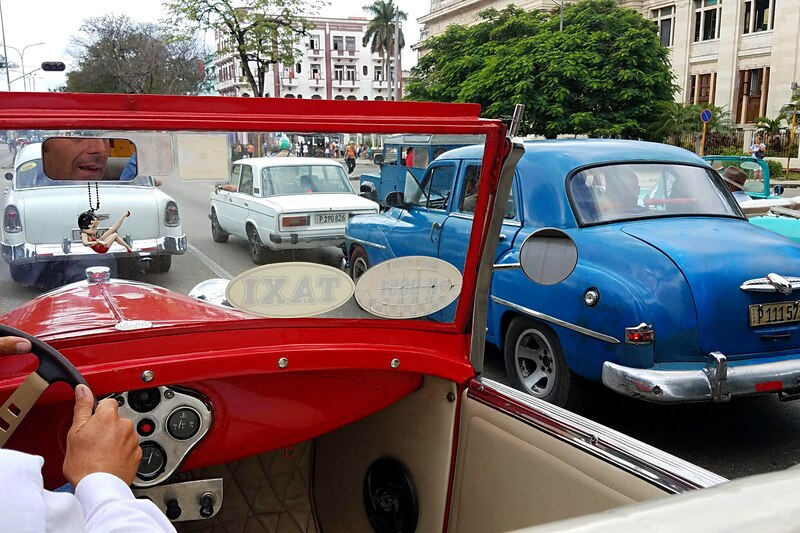 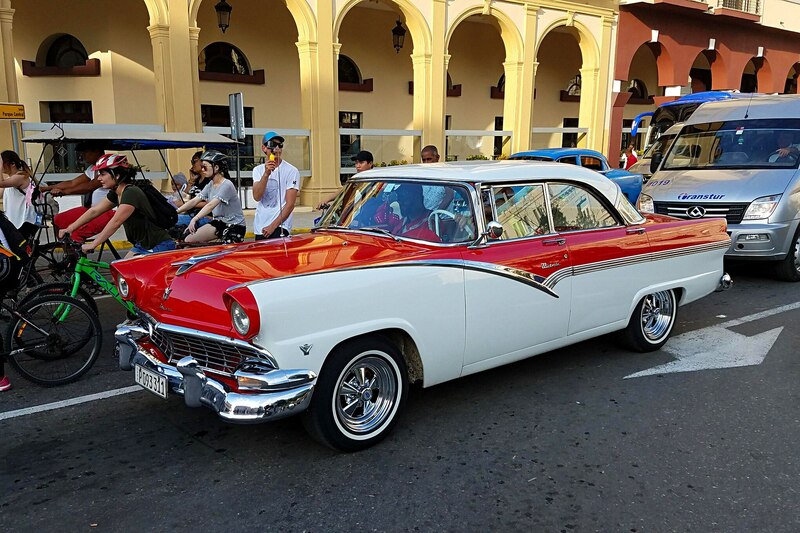 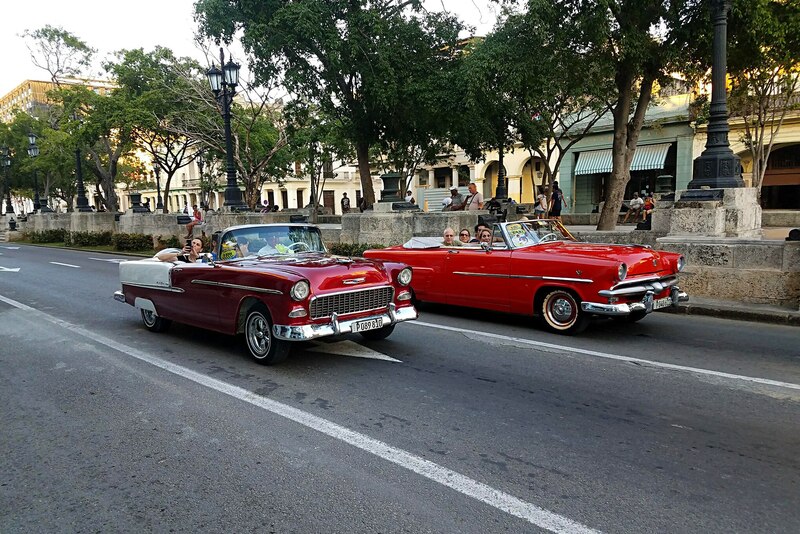 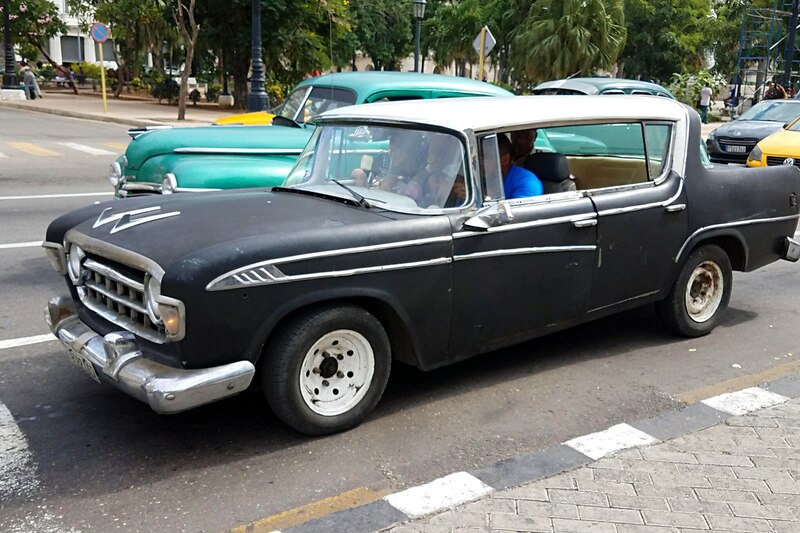 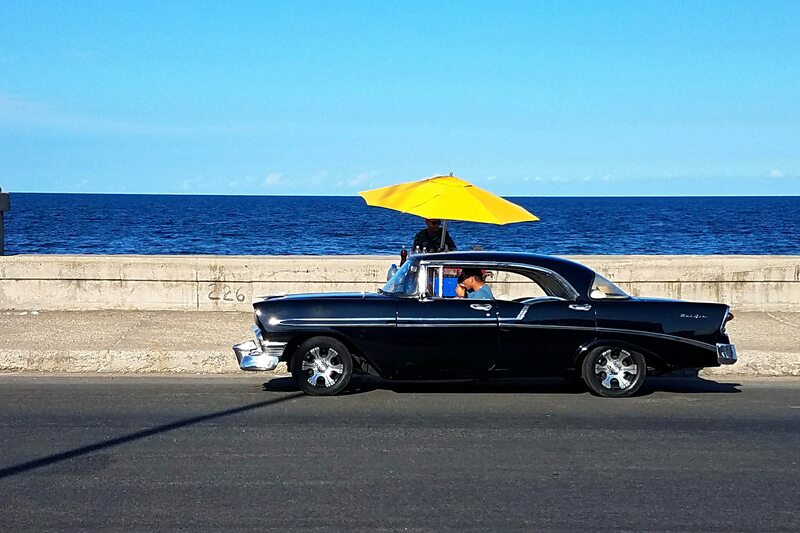 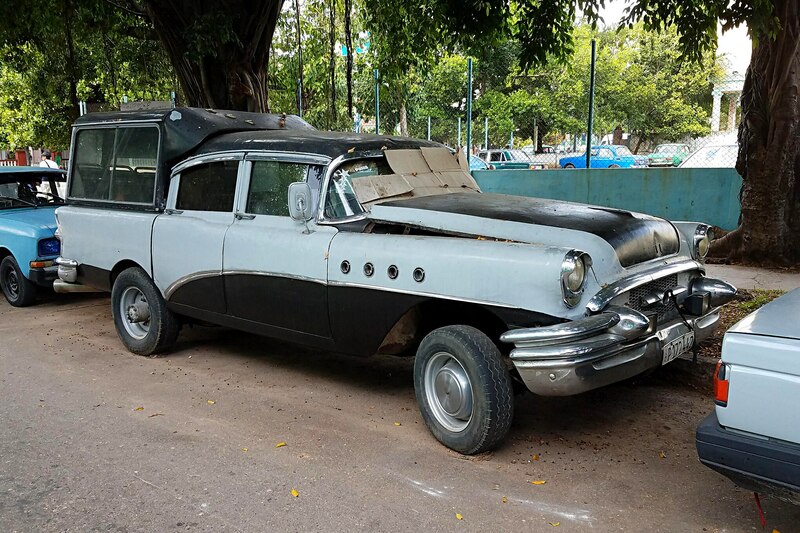 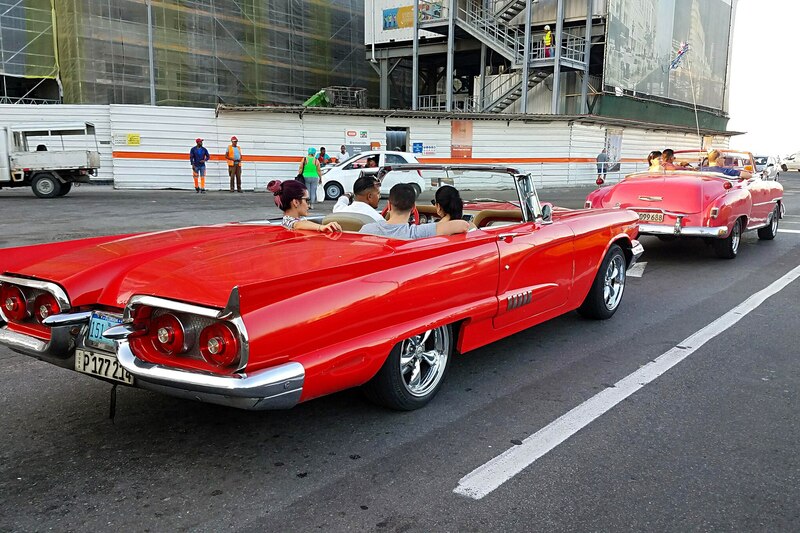 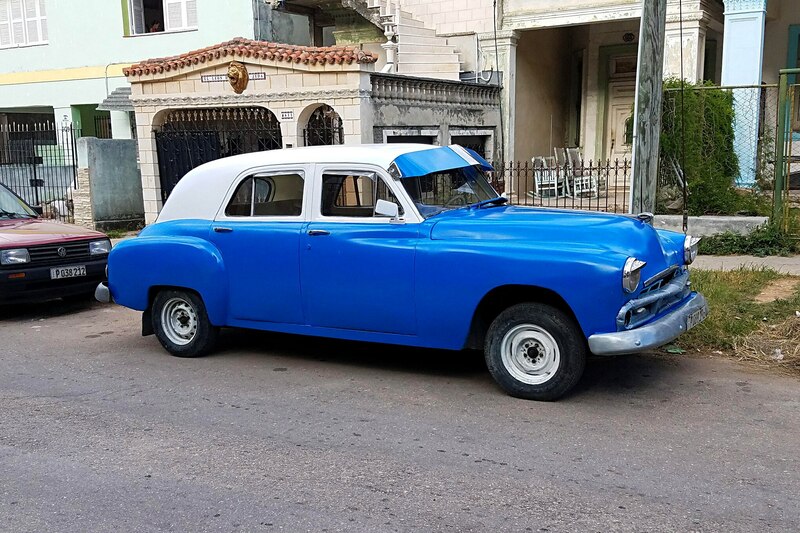 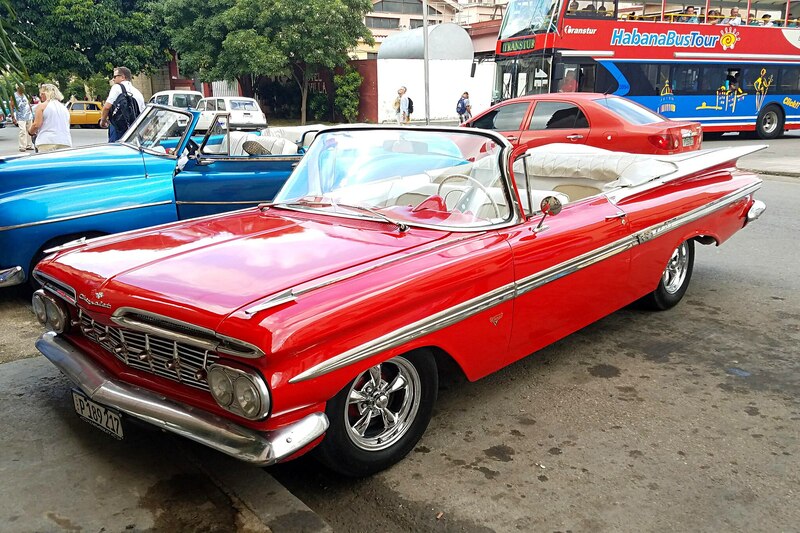 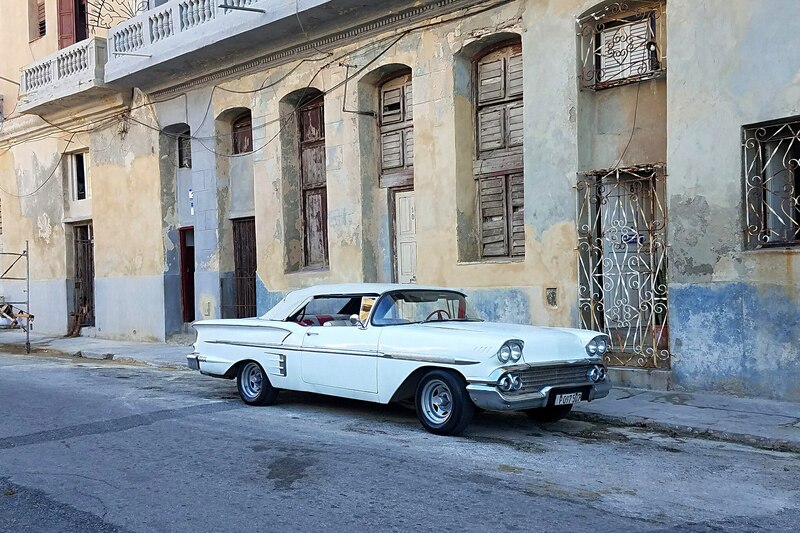 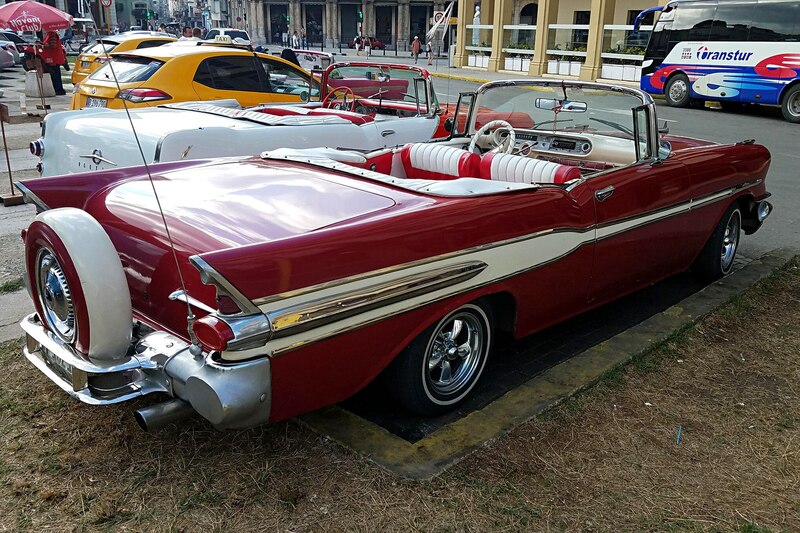 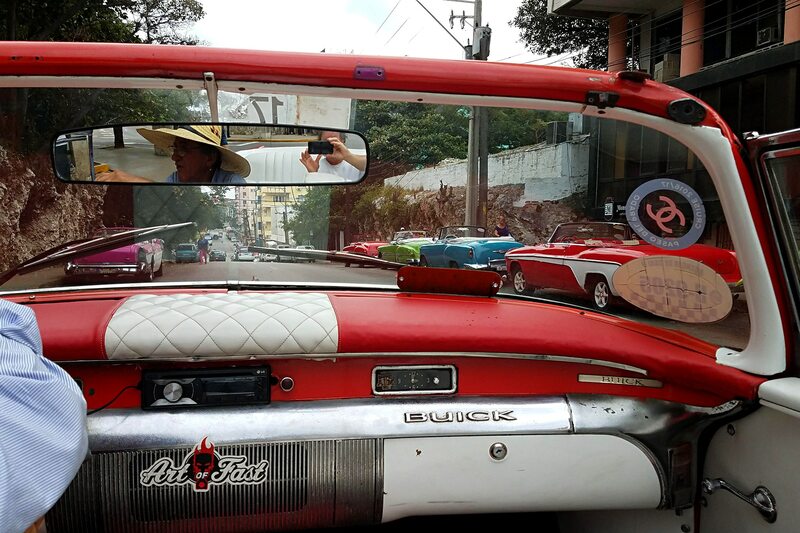 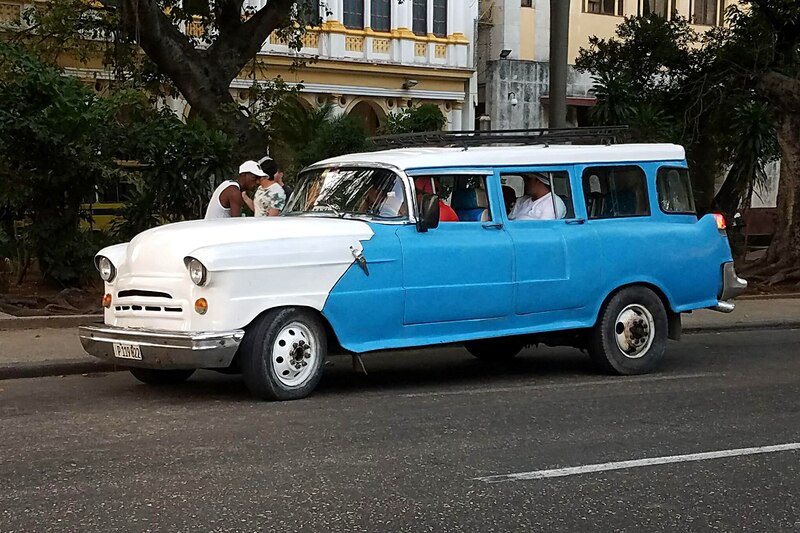 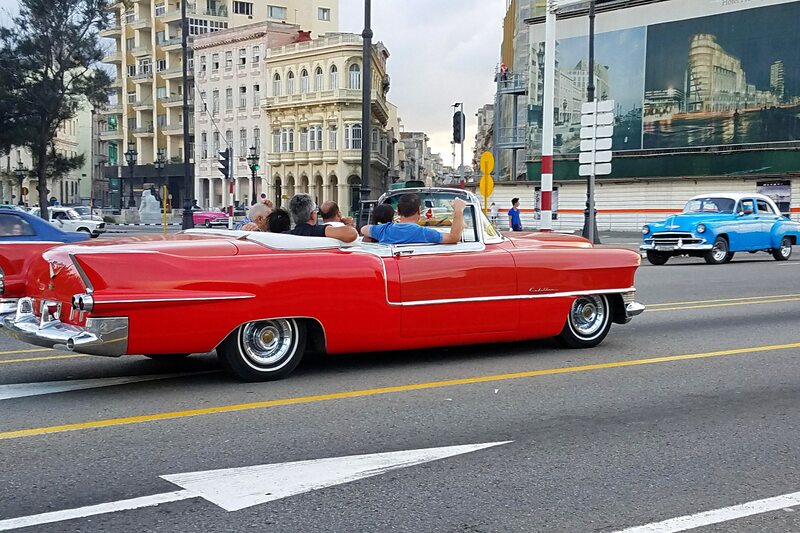 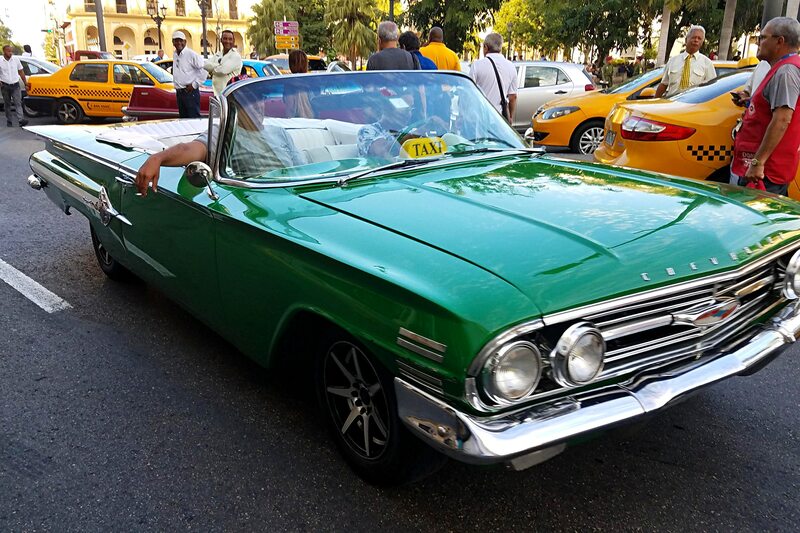 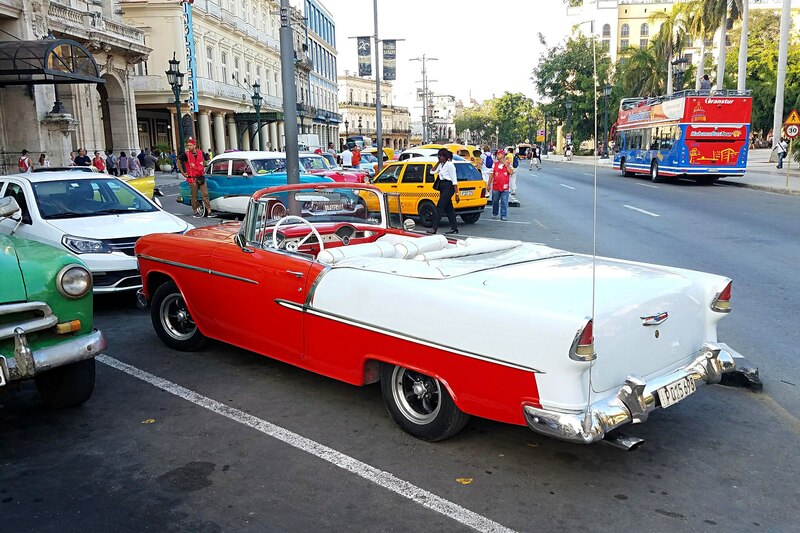 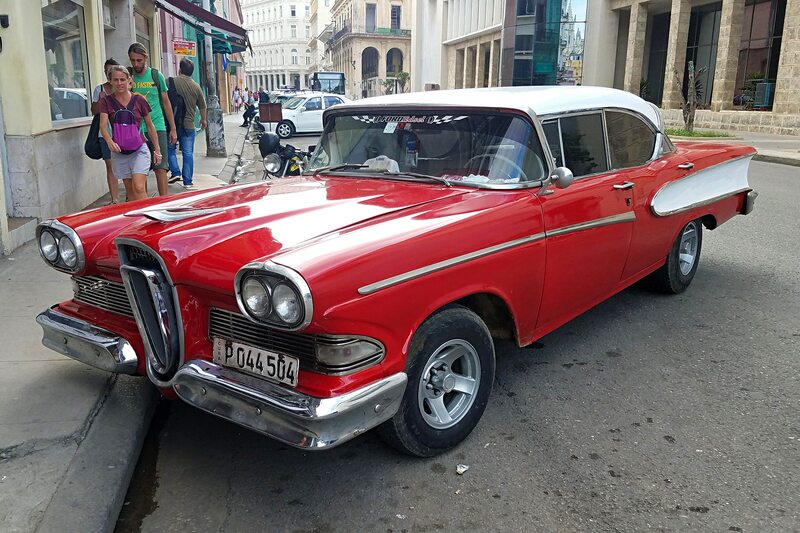 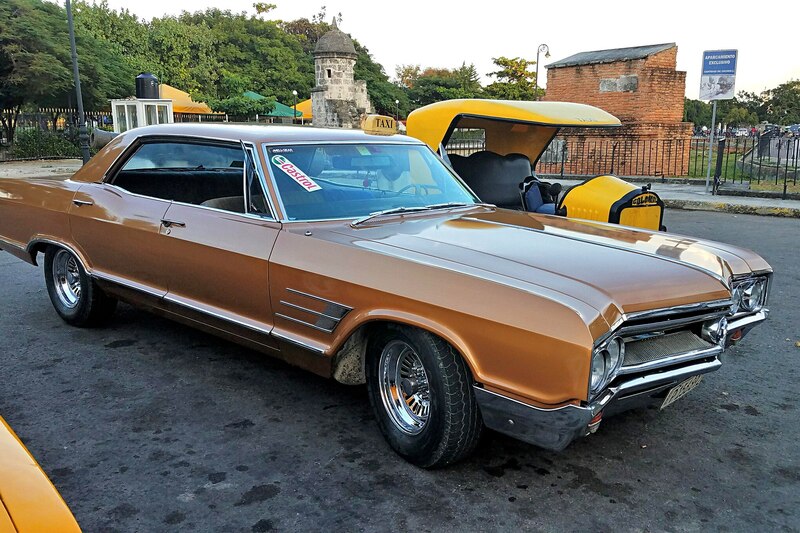 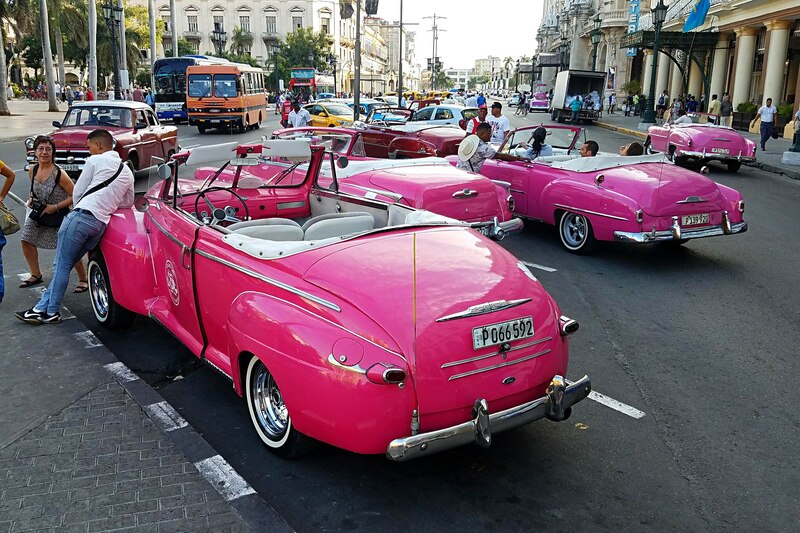 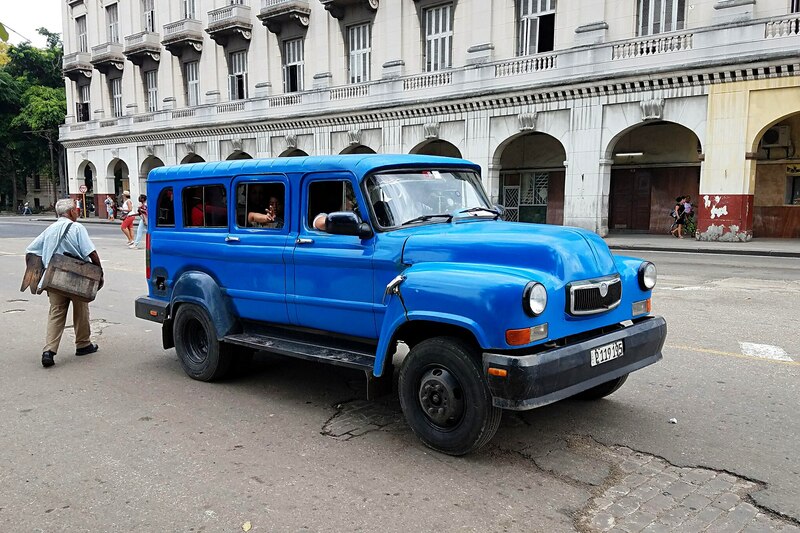 The most popular body style is, of course, the convertible and, if a Cuban happened to own a sedan, it wouldn’t be uncommon to see he’s chopped the roof off and converted his ride into an open-air vehicle to attract more tourists. 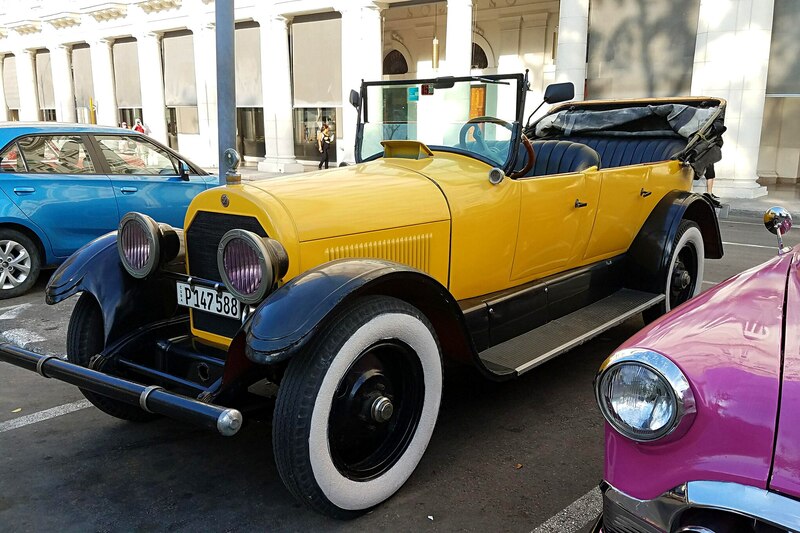 A one-hour guided tour of Havana in a nice Tri-Five Chevy convertible runs about $25, but in a 1930 Ford Phaeton it ran about $15 US. 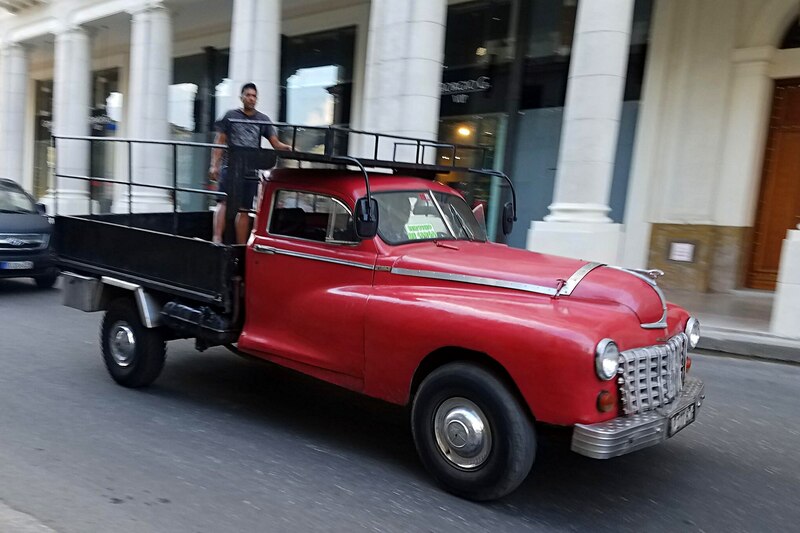 In contrast, the three-wheeled bicycle pedal pusher was asking $10 for a 1-hour trike ride around downtown. 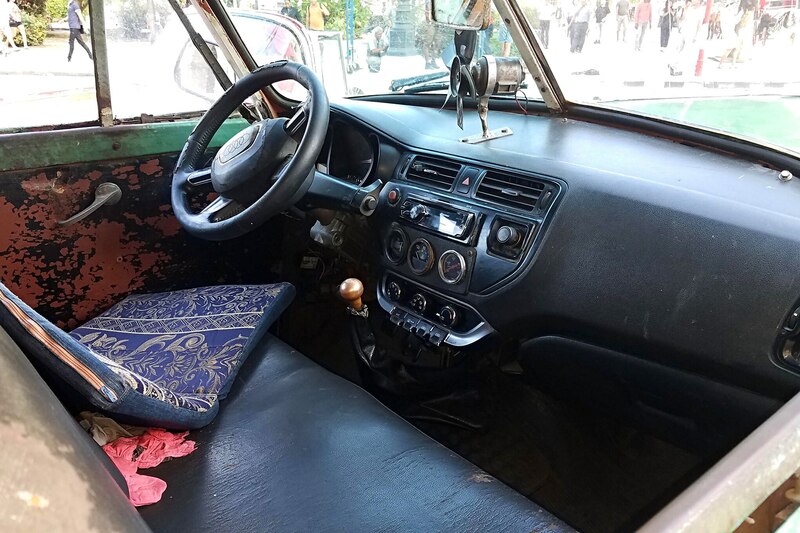 Many of the taxi drivers are employees to a car owner who might be operating with several old cars in their fleet. 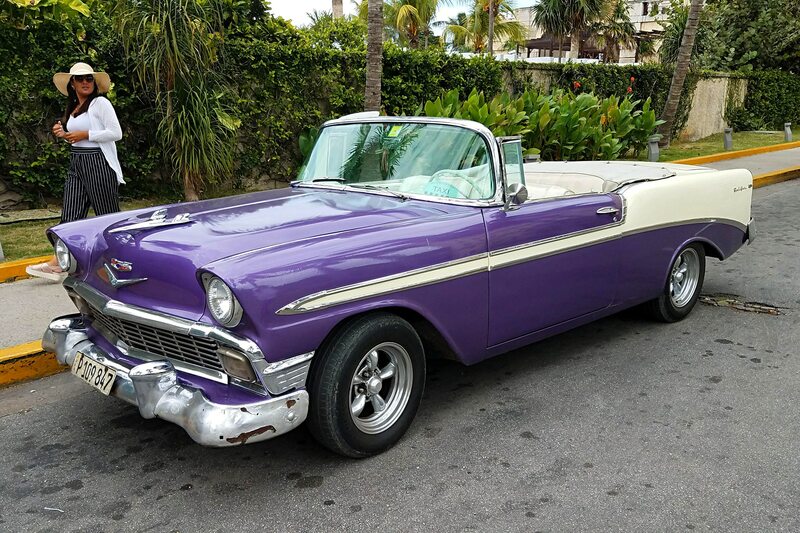 But where Tri-Five Chevys are easily the most common found driving around, Chryslers, Pontiacs, Dodges, Buicks, Oldsmobiles, Studebakers, Fords, Ramblers, Plymouths, and Mercurys are also easily found, with nearly every one having been manufactured in the 1948-1960 year range. 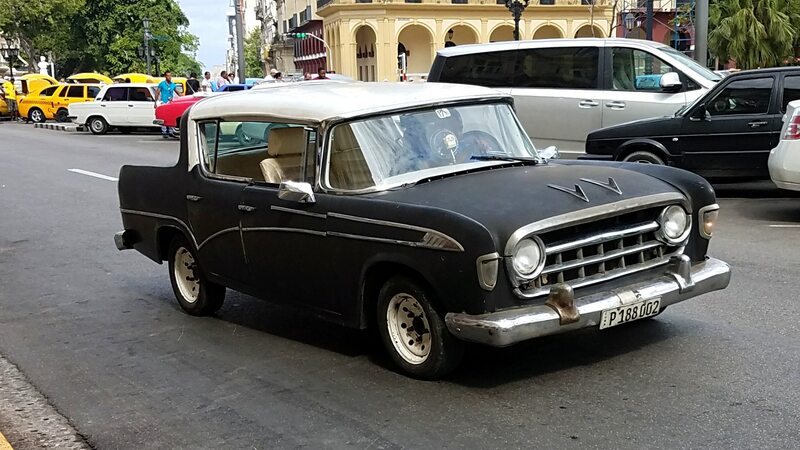 Vauxhall, Anglia 100E, GAZ, and other various European nameplates make up the balance. 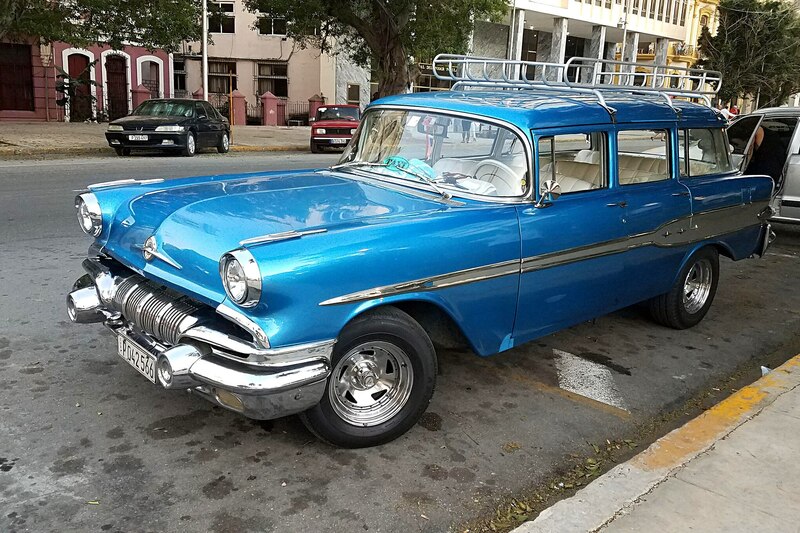 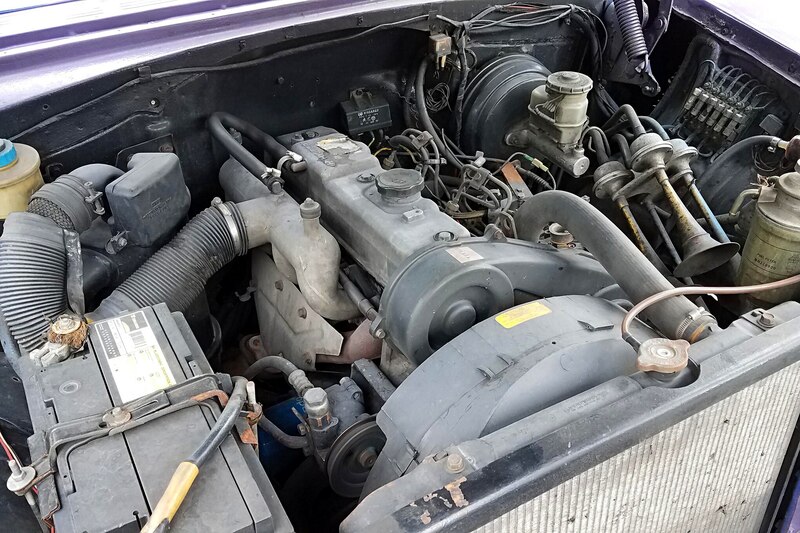 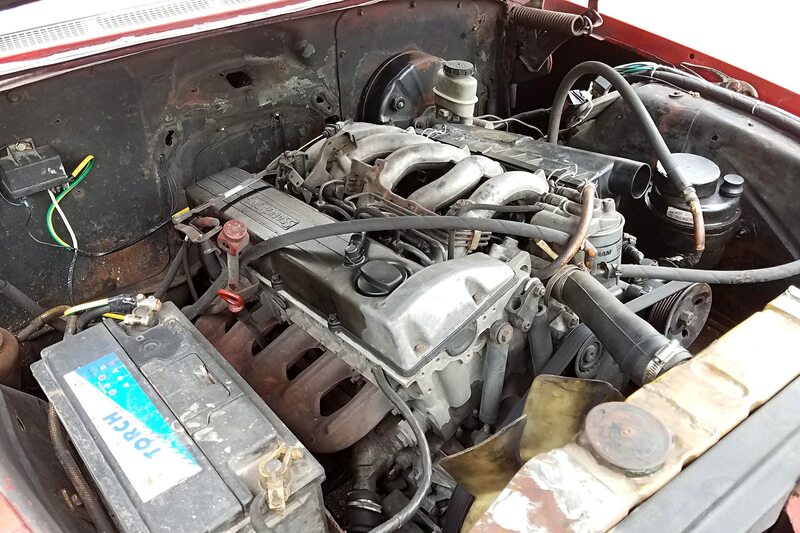 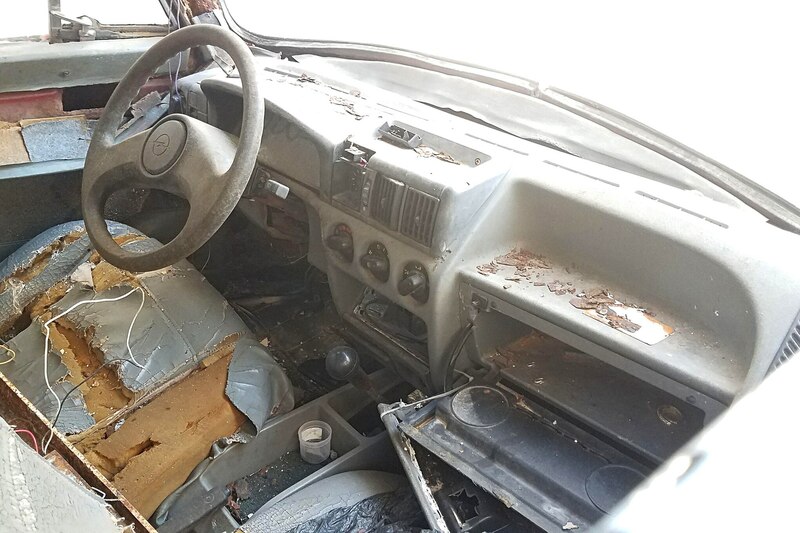 But just because you’re looking at a mid-1950s Chevrolet parked on the curb doesn’t mean it couldn’t also have an Audi dash and steering, a Mercedes diesel engine under the hood, a Toyota five-speed gearbox, and sitting on a HiLux frame. 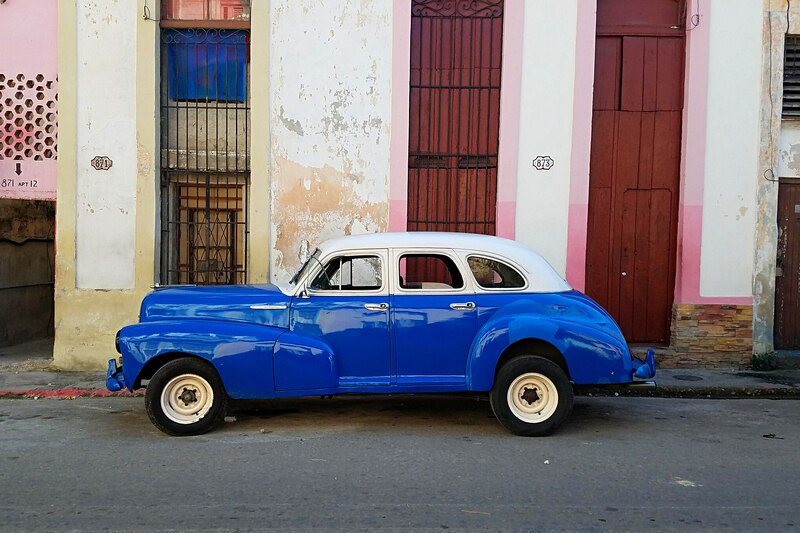 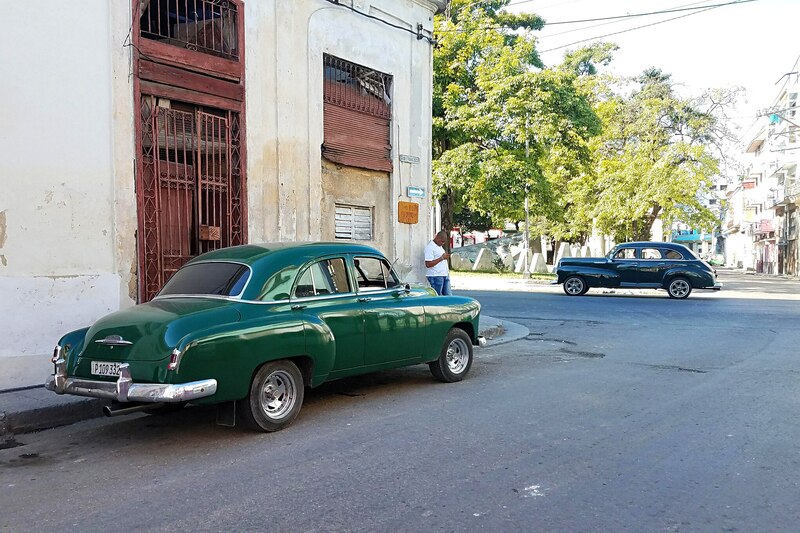 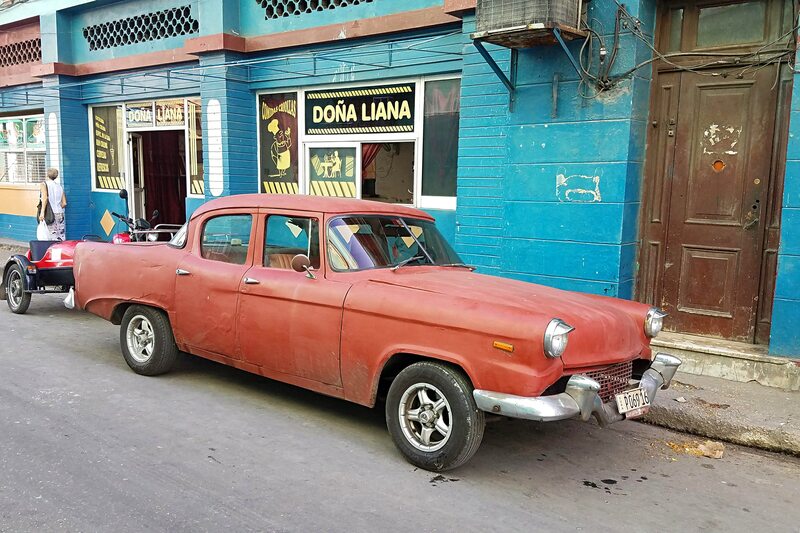 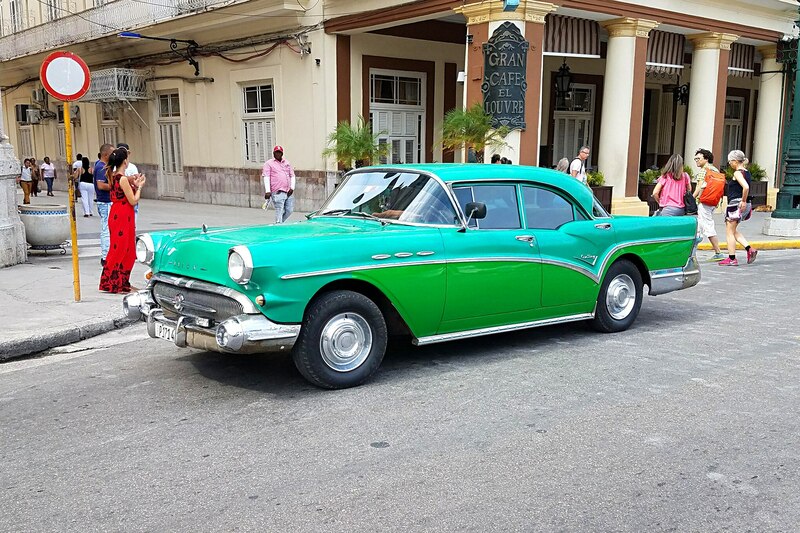 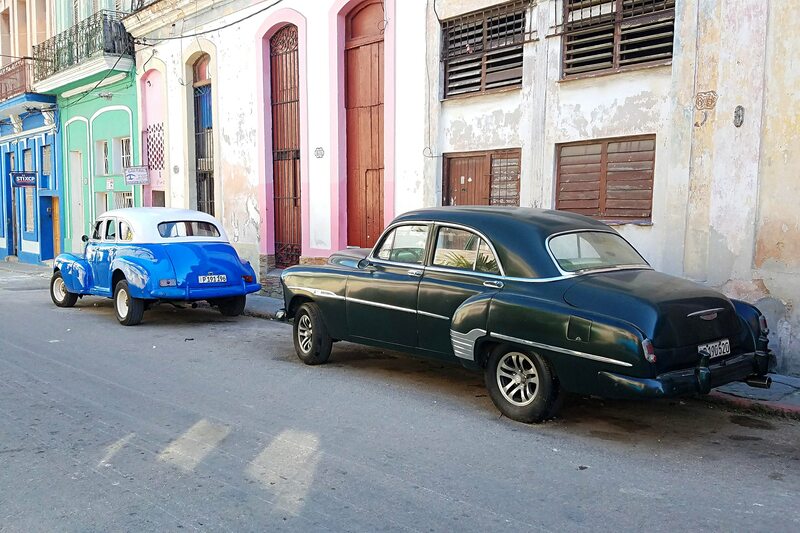 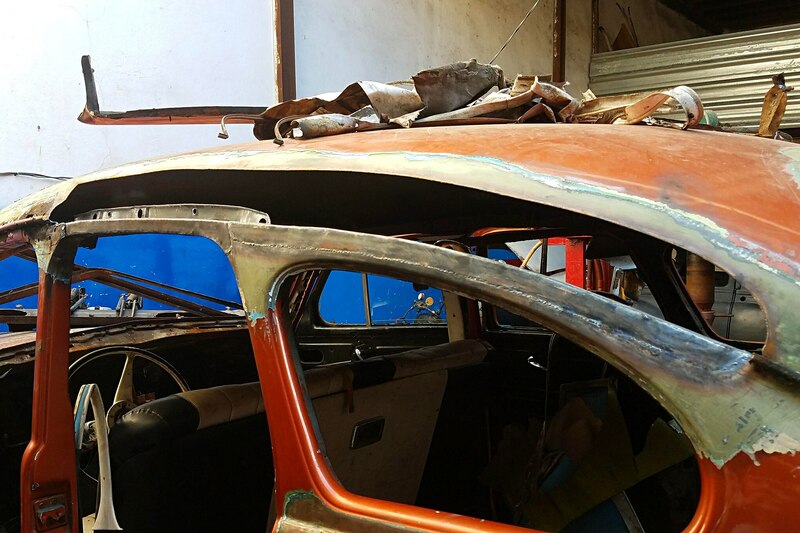 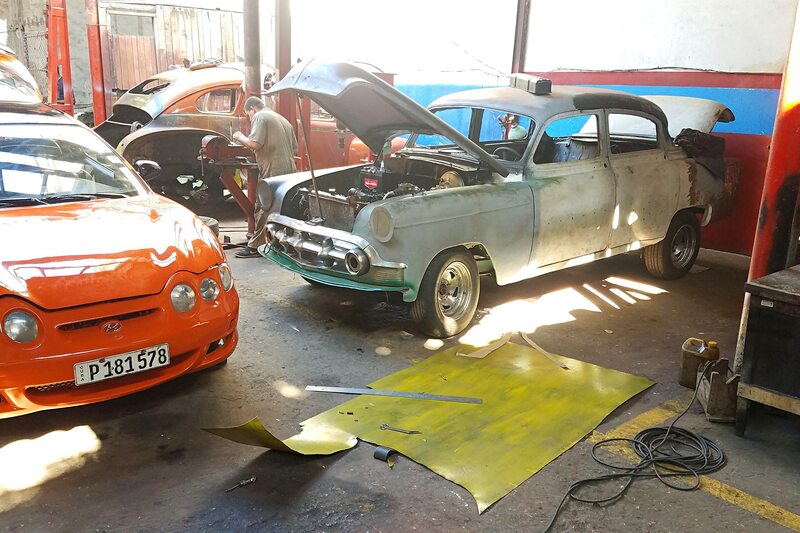 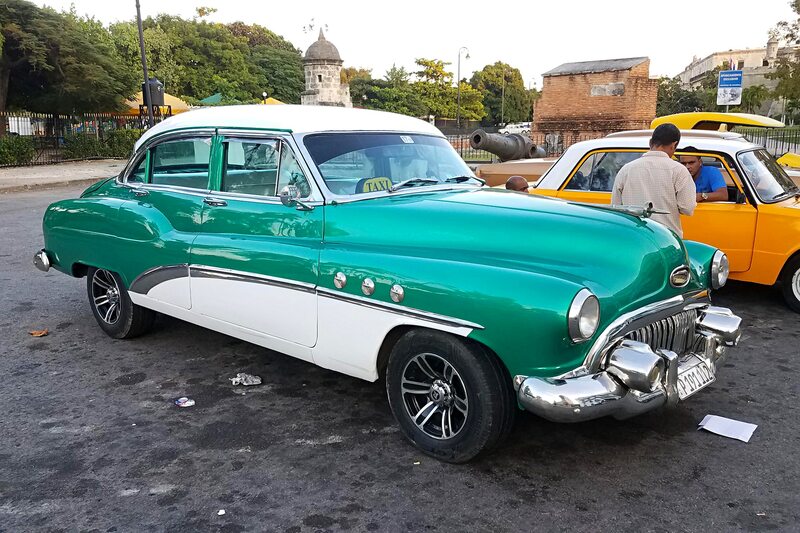 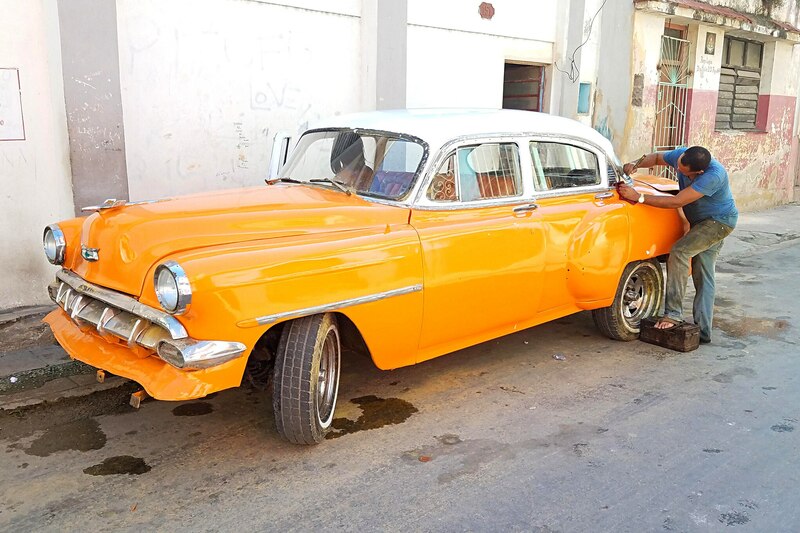 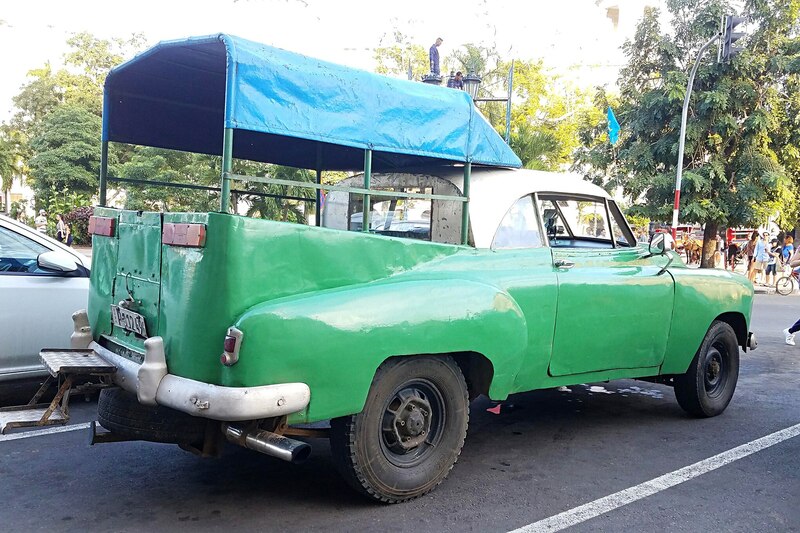 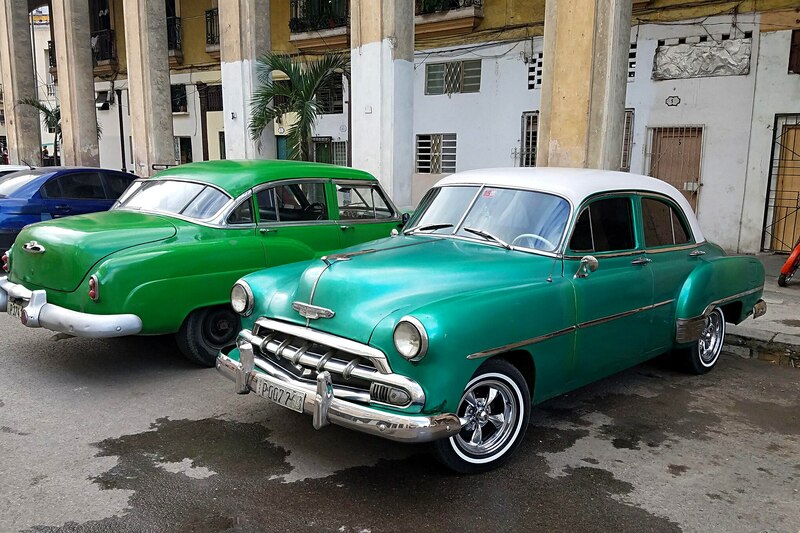 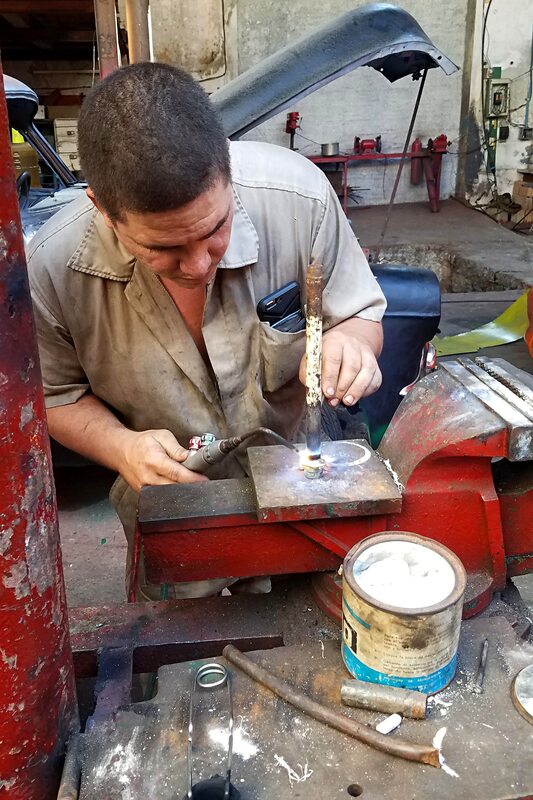 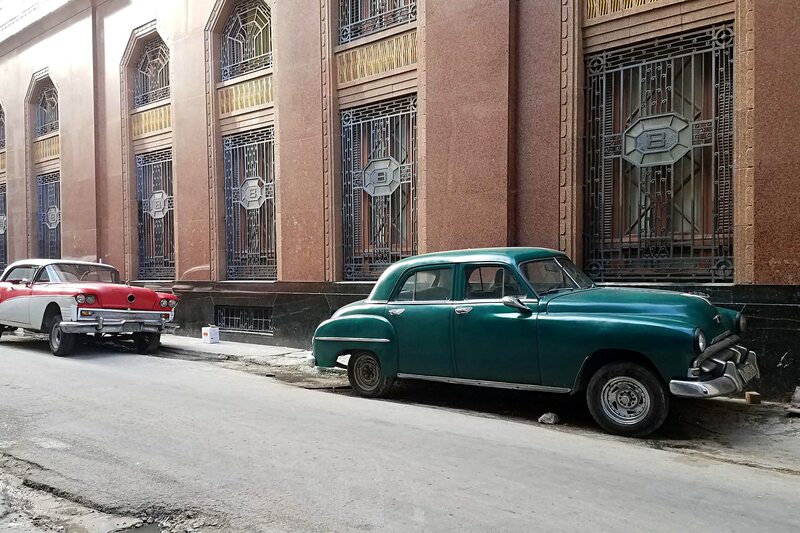 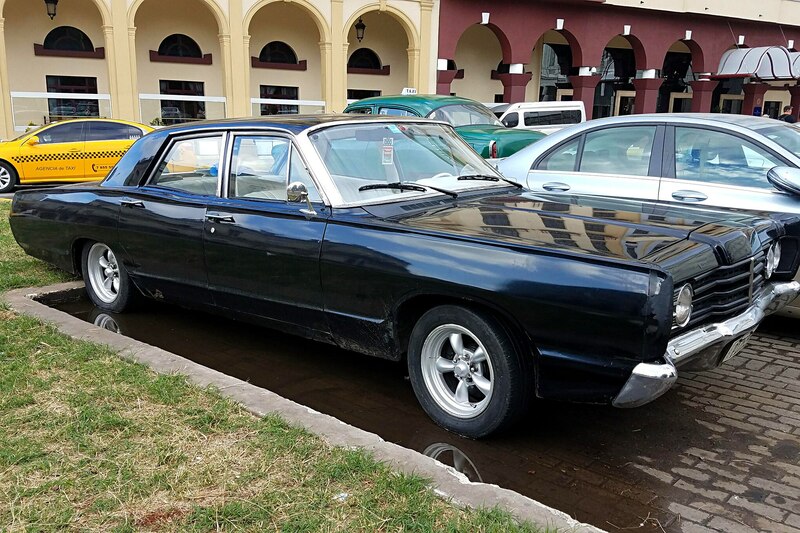 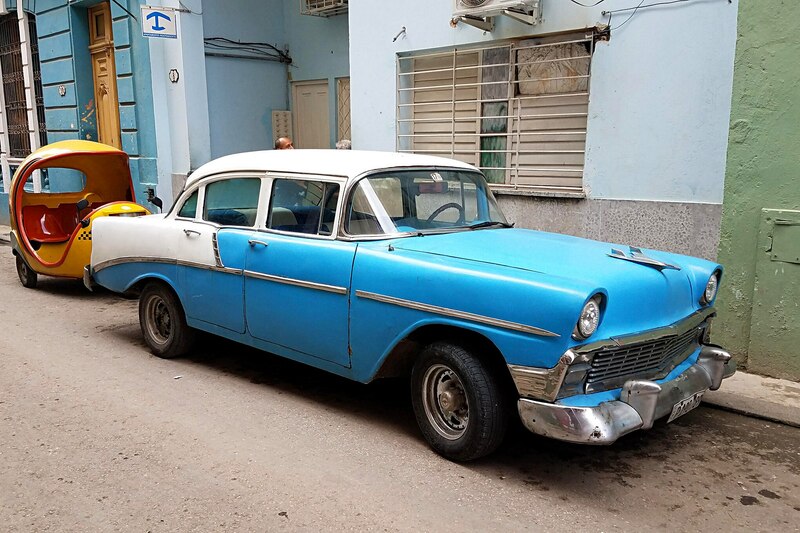 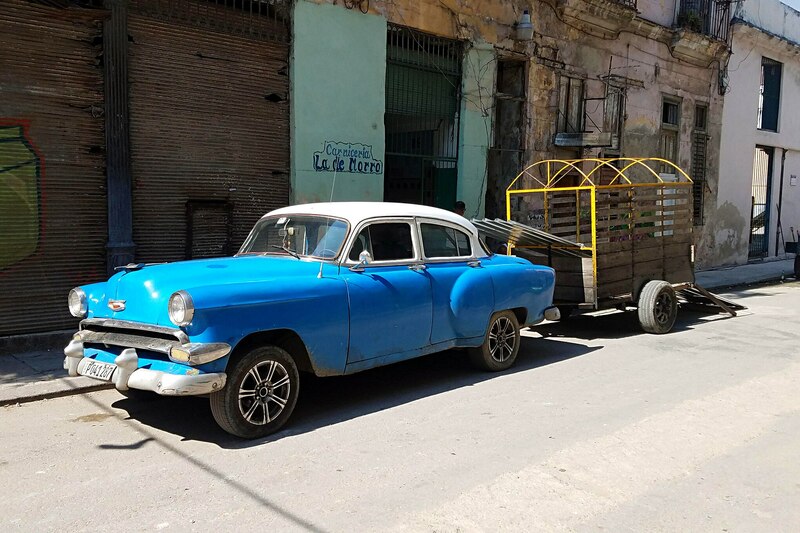 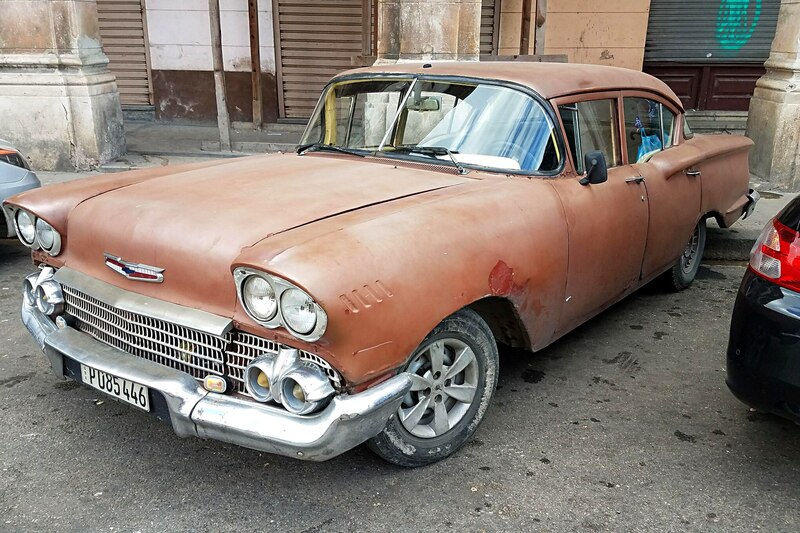 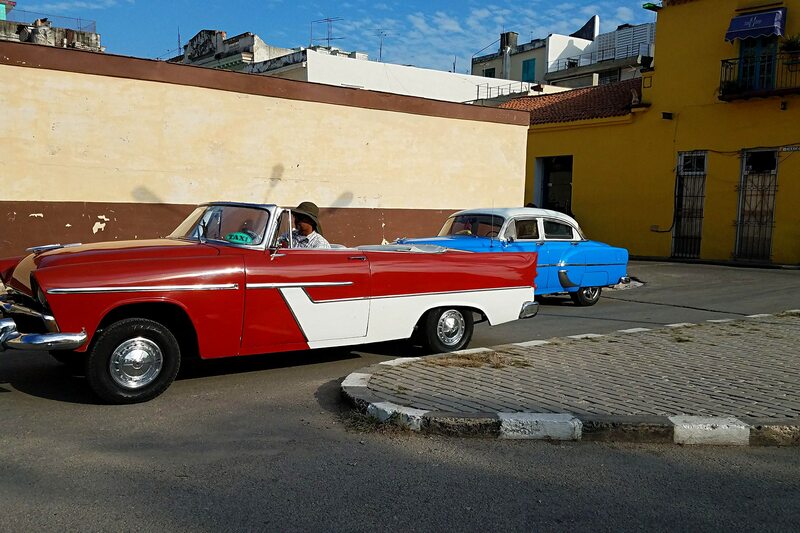 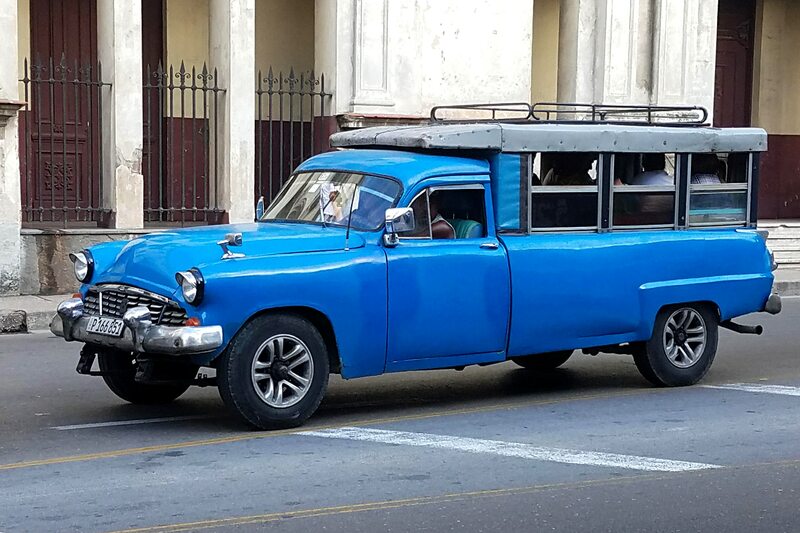 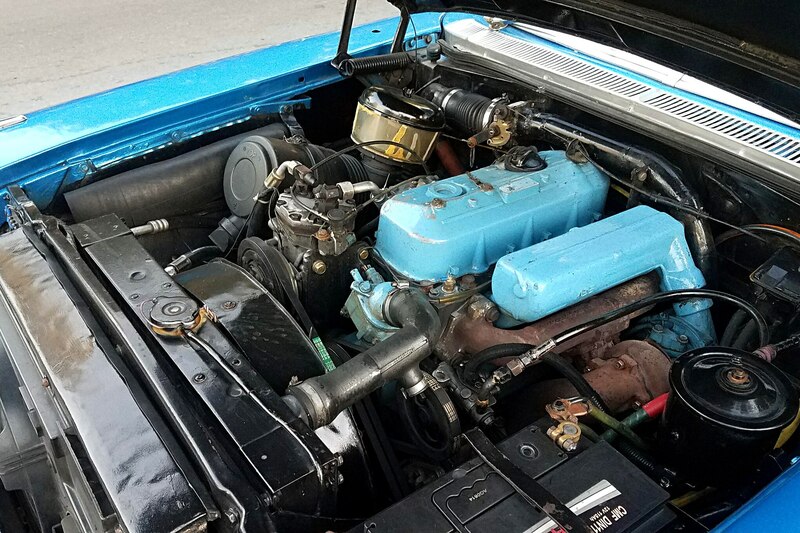 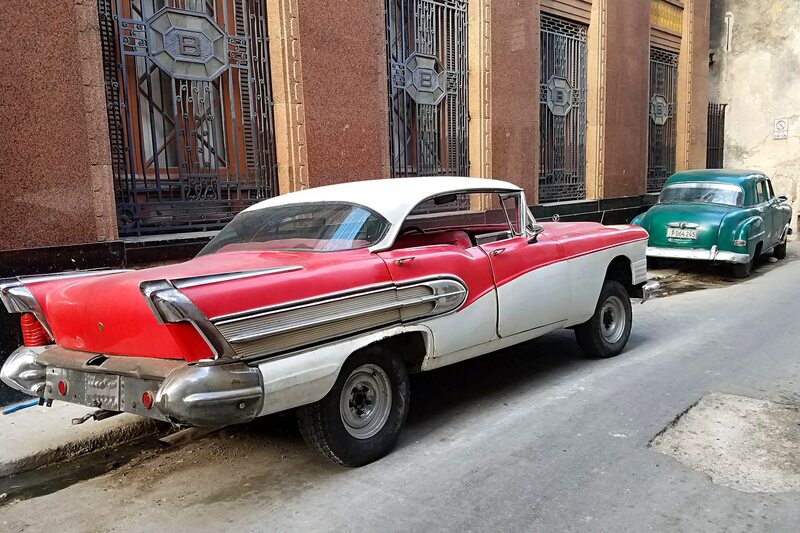 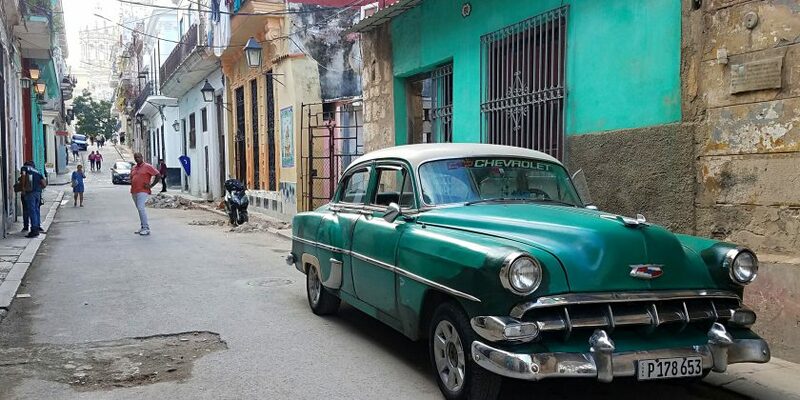 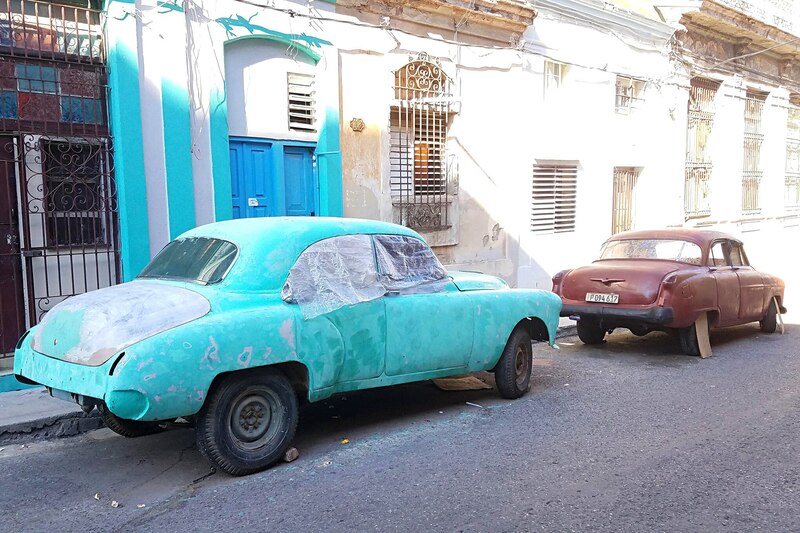 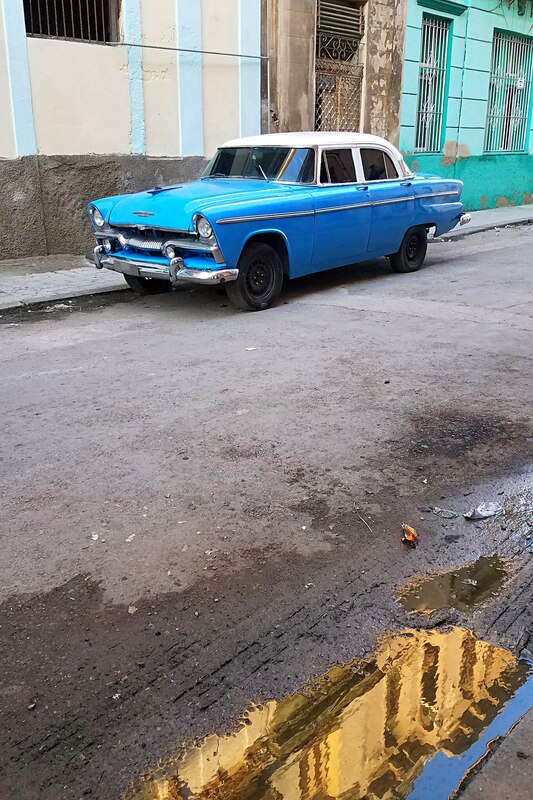 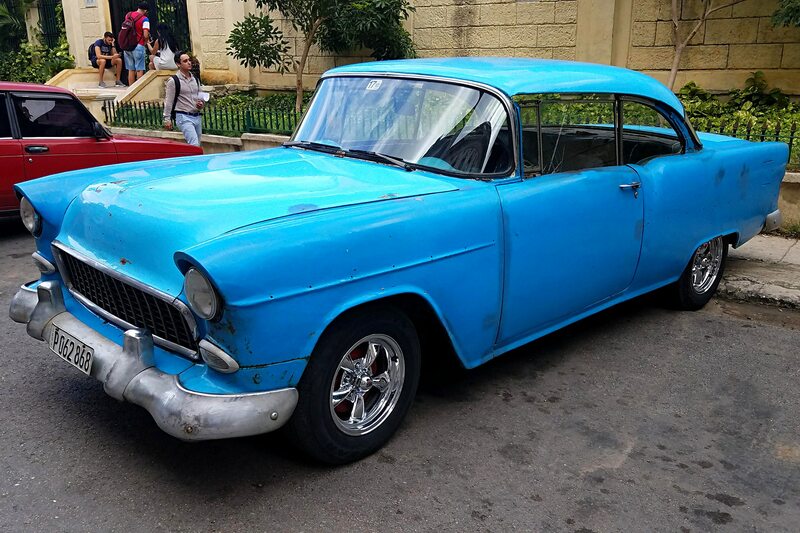 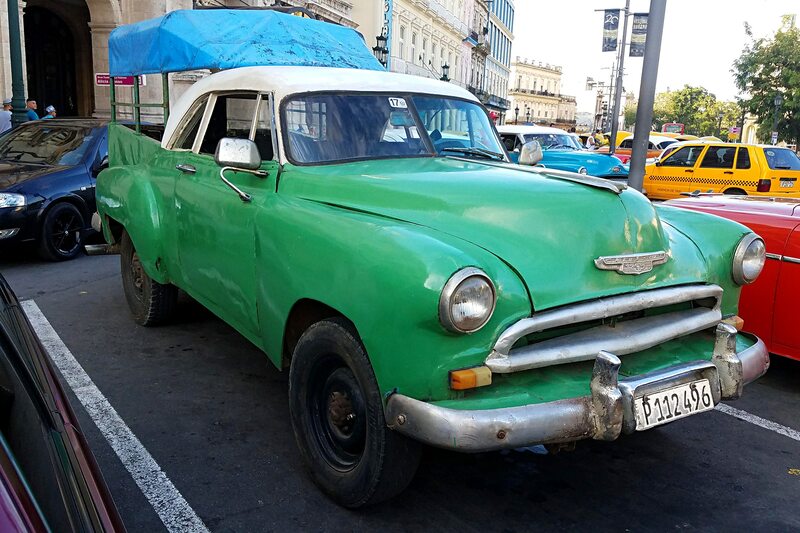 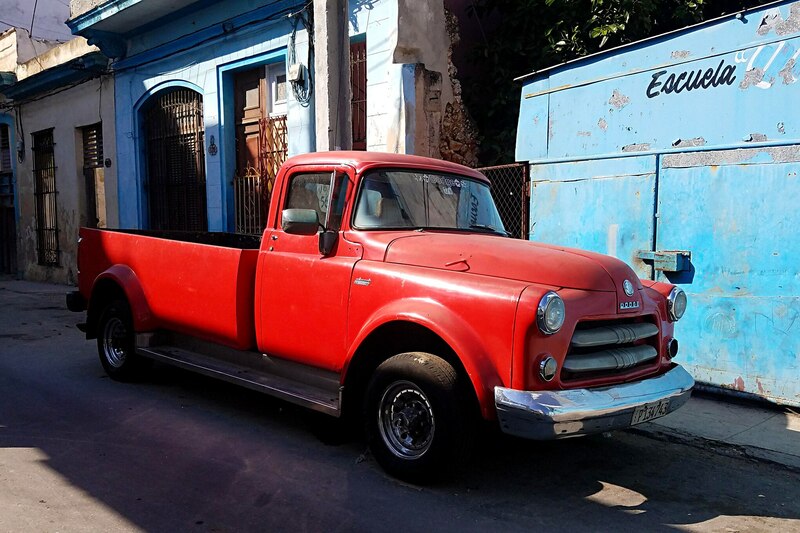 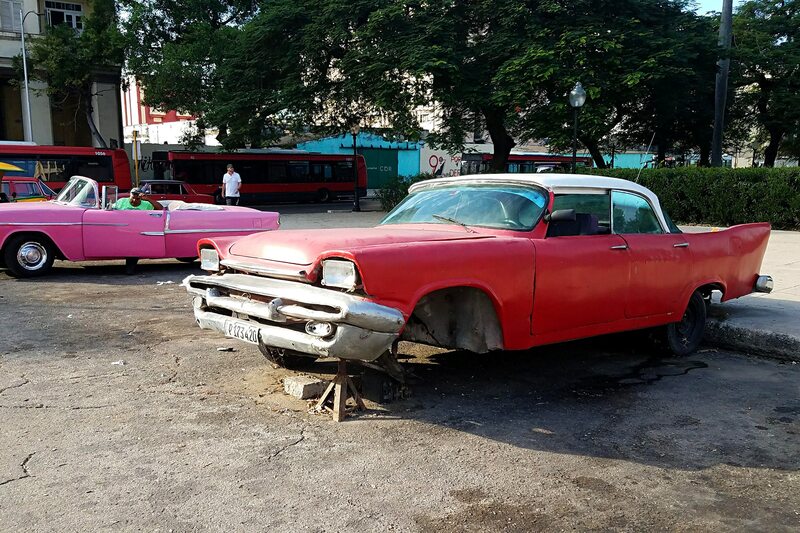 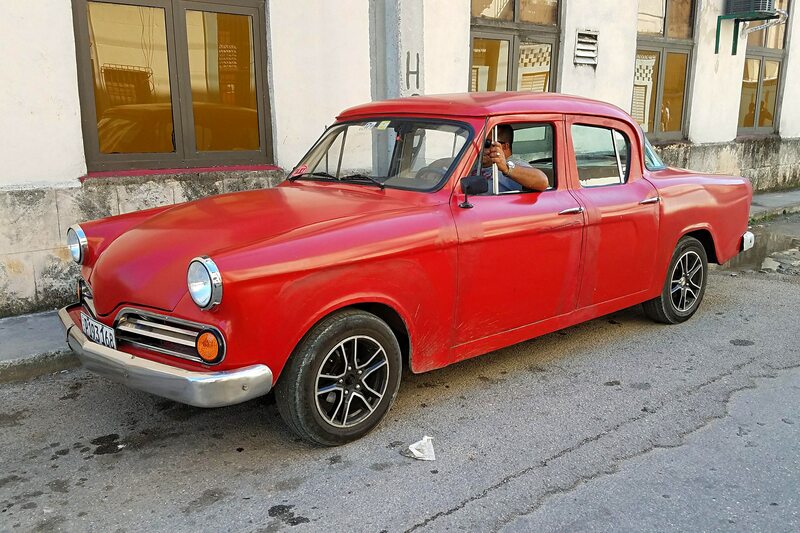 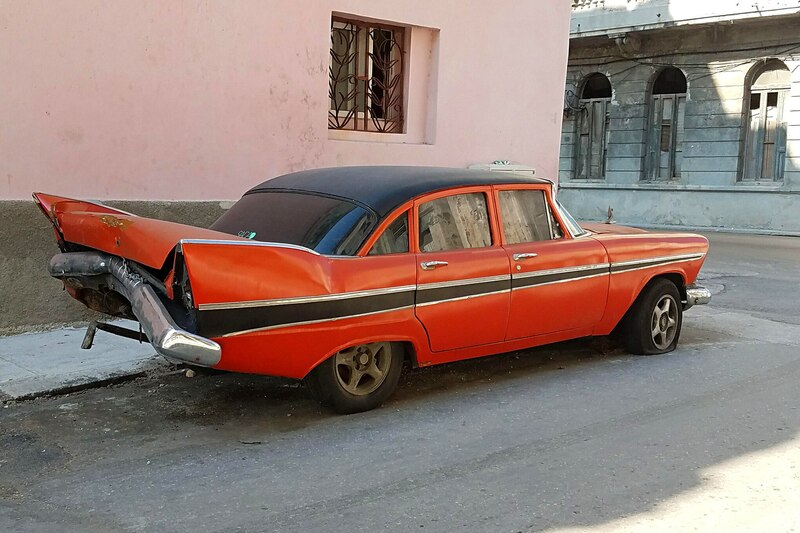 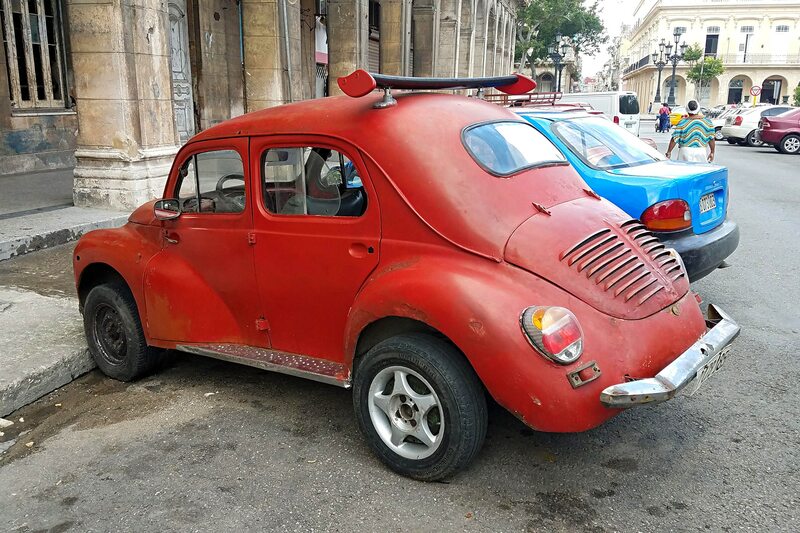 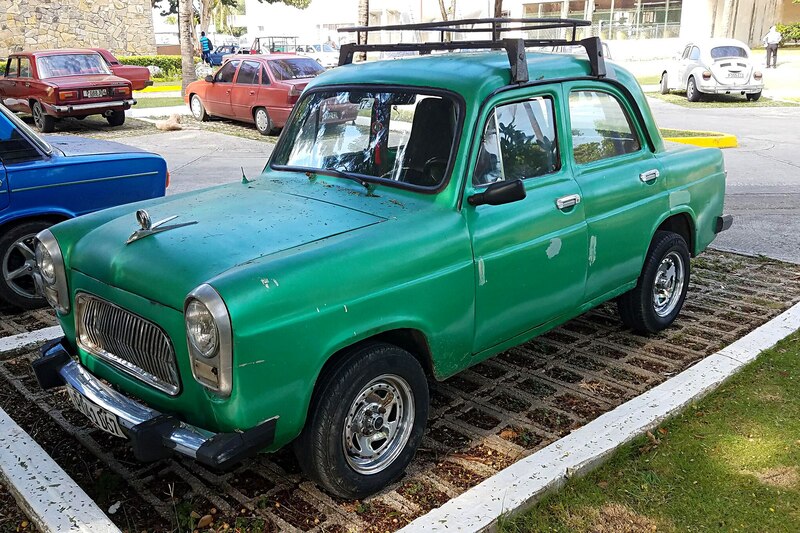 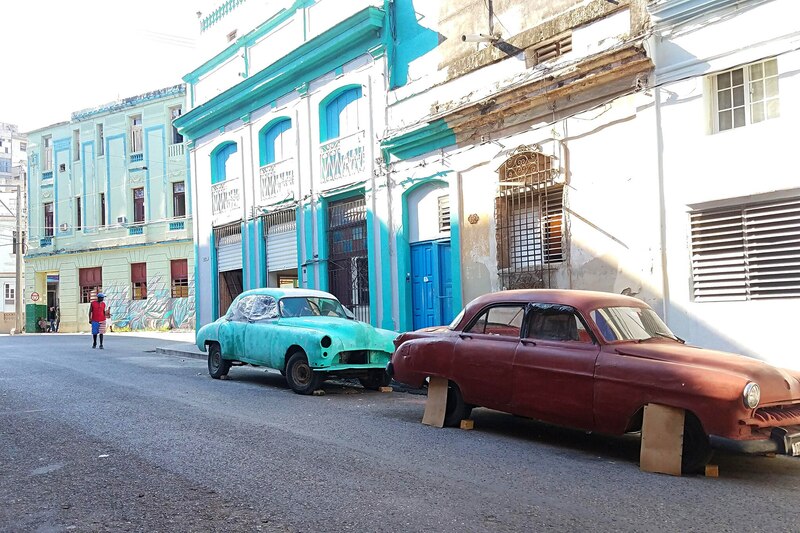 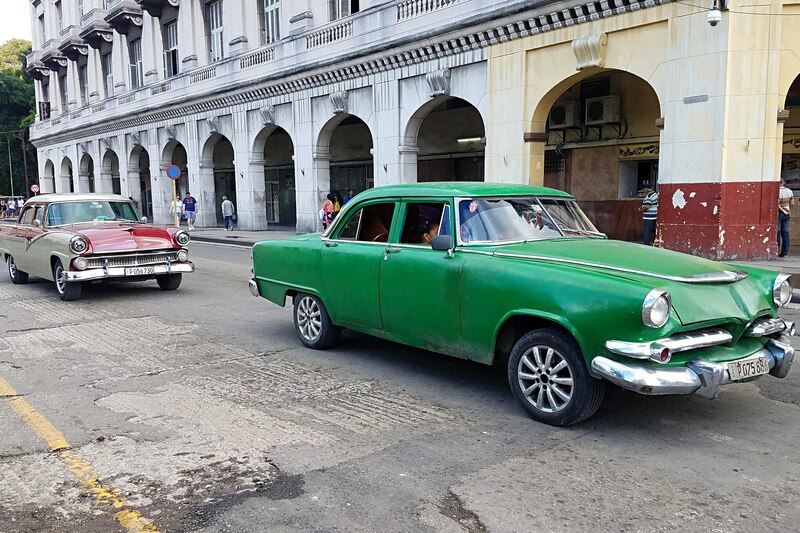 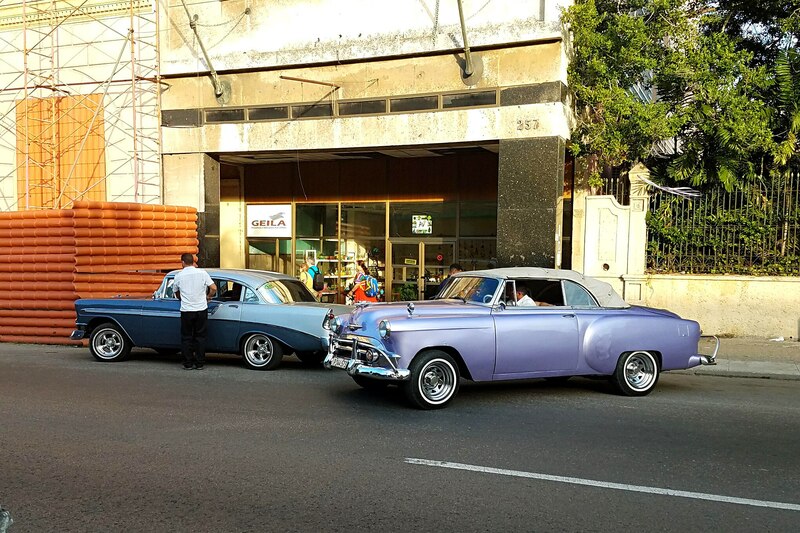 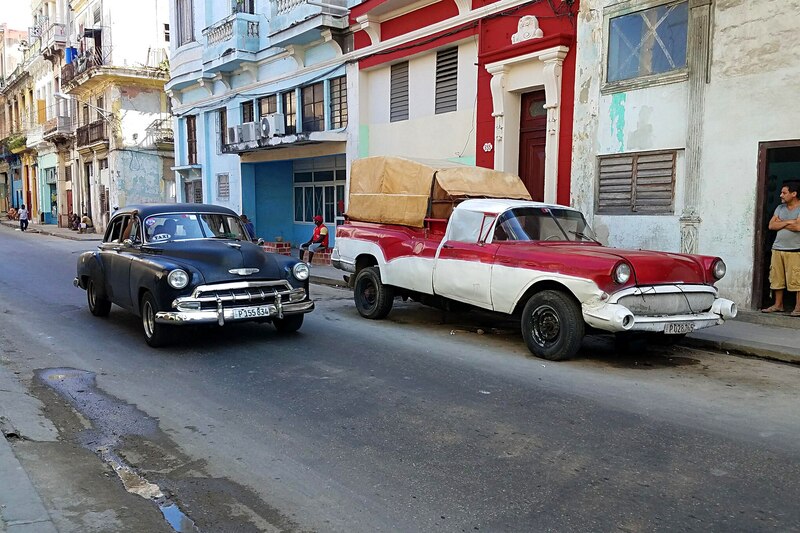 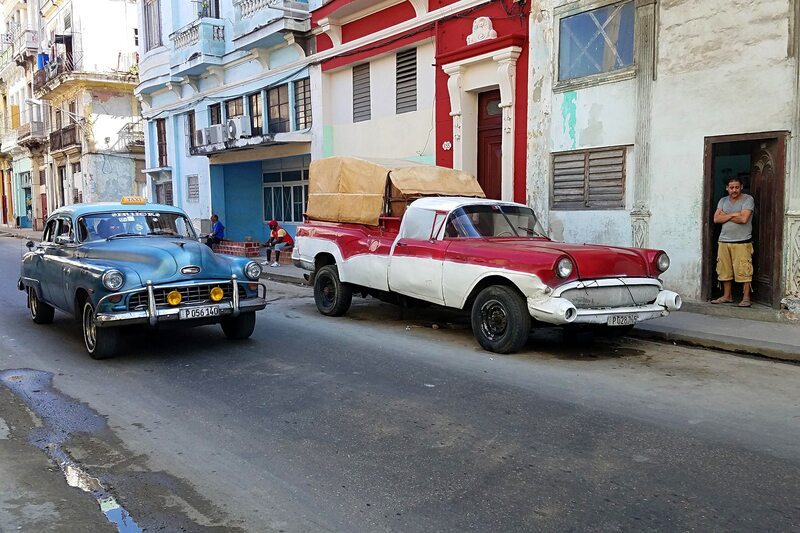 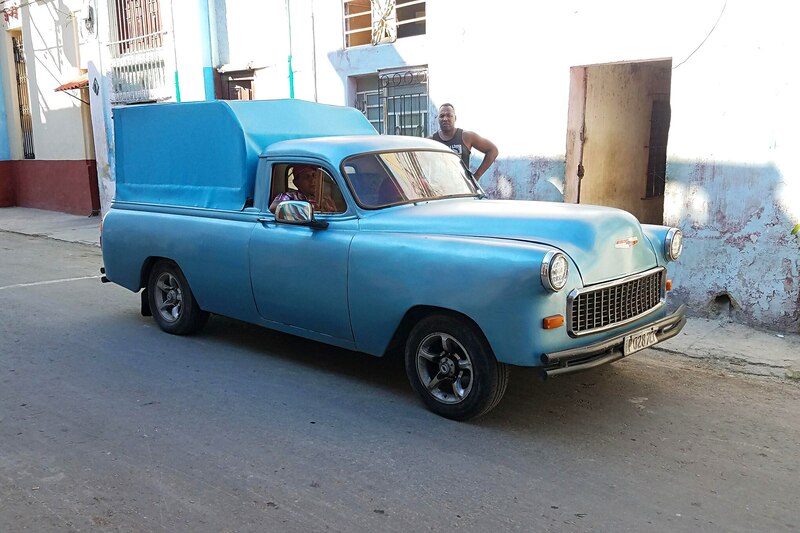 This is a country where sandpaper is not readily available, let alone automotive paint or any type of welding (though I did see some acetylene brazing being done), so it shows how creative and determined Cubans are in keeping these cars up and running. 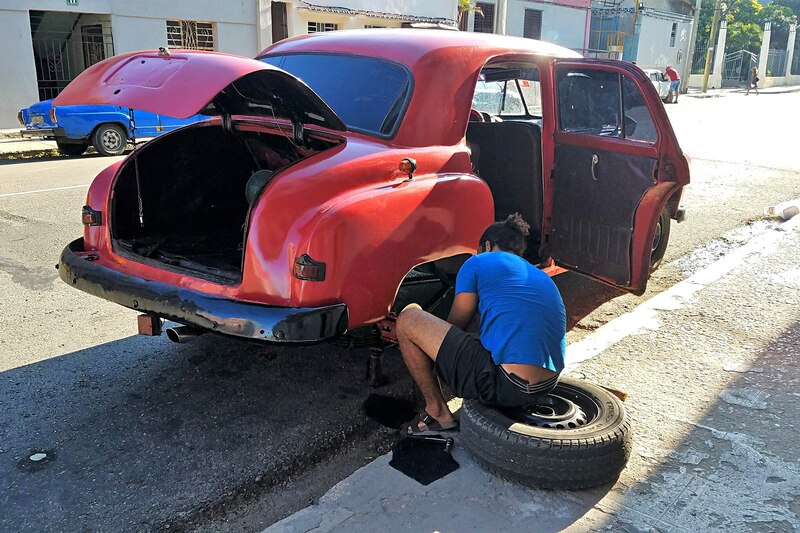 The guessing game for what you’re looking at gets trickier when the Cubans start mixing and (sort of) matching parts and pieces to create something new. 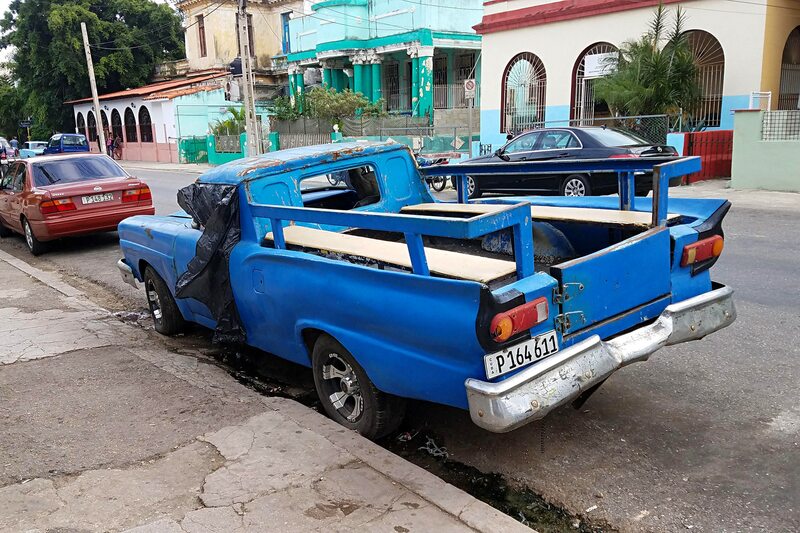 One Chevy sedan we saw was cut in half behind the door handles and set on some sort of truck frame with a large bed out back for hauling. 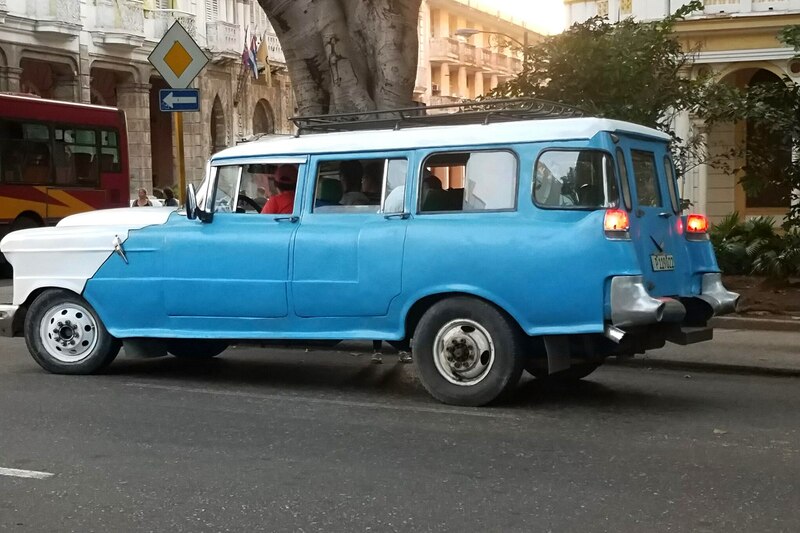 Other vehicles, such as a multi-seat taxi (not with transverse seating, but rather two long planks running lengthwise like an armored personnel carrier) looked like the roof section of a Toyota Land Cruiser had been grafted into a Dodge truck cab, while another two-door sedan with the rear window/trunk lid area opened up and vertical side panels added to the tops of the fenders to form a large bed for hauling. 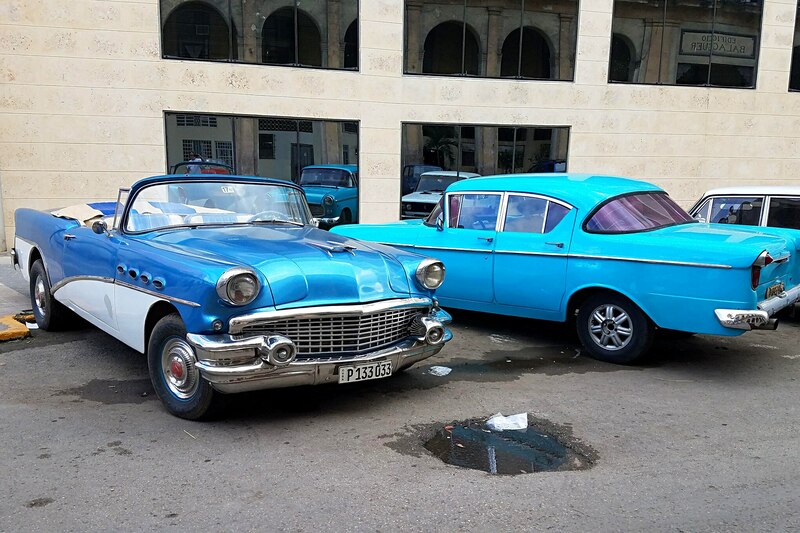 And though there is an abundance of 1950s-era vehicles, I couldn’t spot a pre (world) war car anywhere. 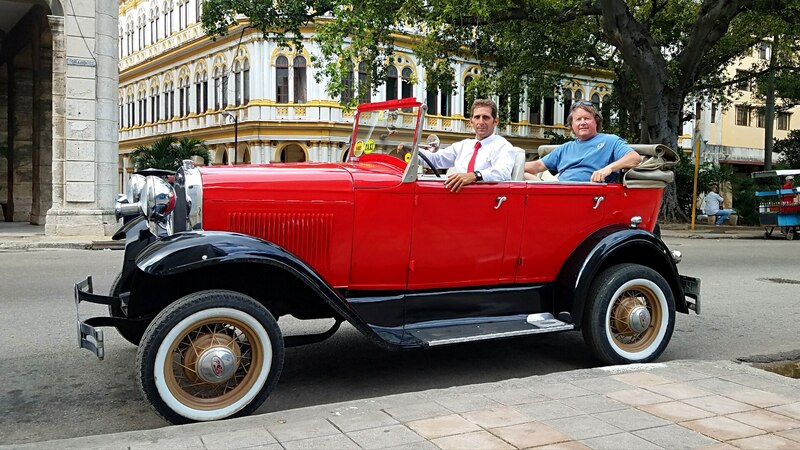 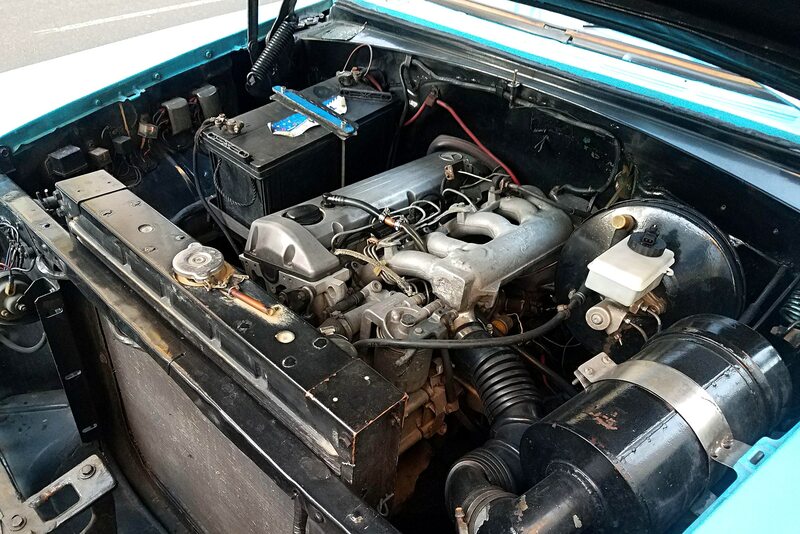 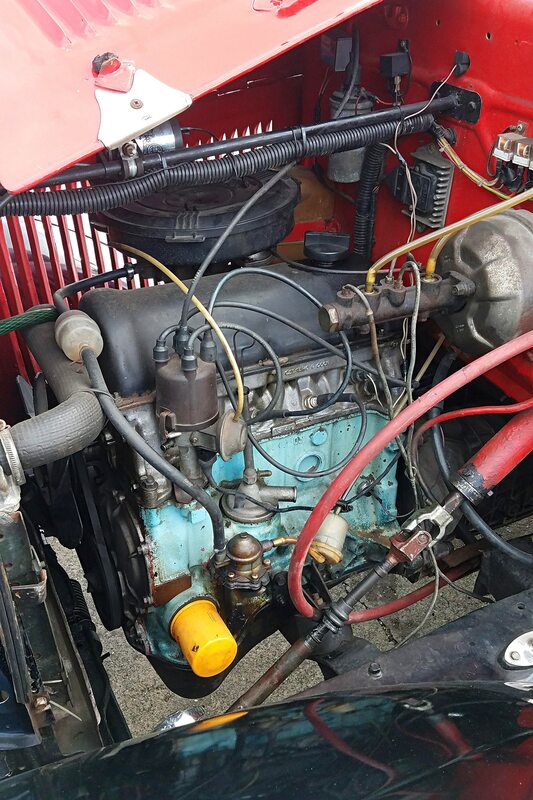 I took a ride in a Model A four-door Phaeton, but it had a Soviet Lada motor under the hood and I wasn’t sure about the rest of the drivetrain (and, judging from the ride, I wasn’t sure if the spring leafs hadn’t been welded together). 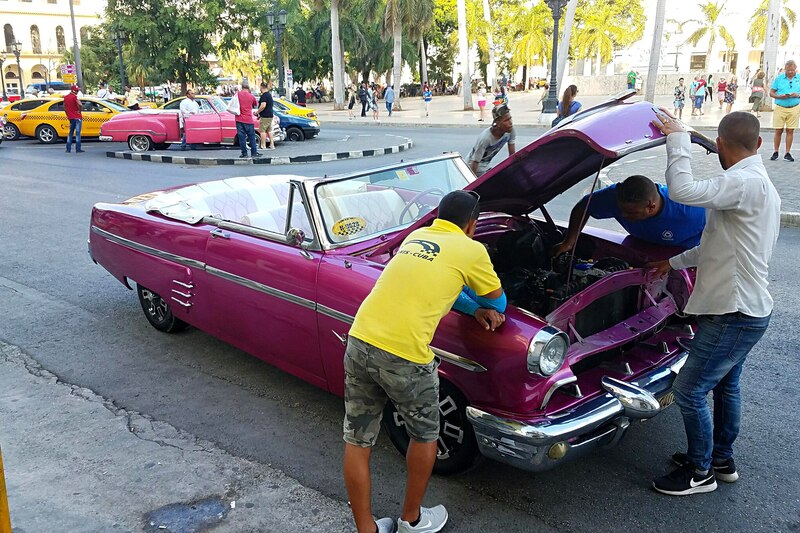 In talking with several mechanics and taxi drivers who were working on their cars (some in a four-car repair shop while others just out on the street) it seems good working carburetors are among the hardest parts to find (though we did note a few chrome Edelbrock air filters and valve covers on these cars, along with a surprising number of American Racing-style five-spoke wheels). 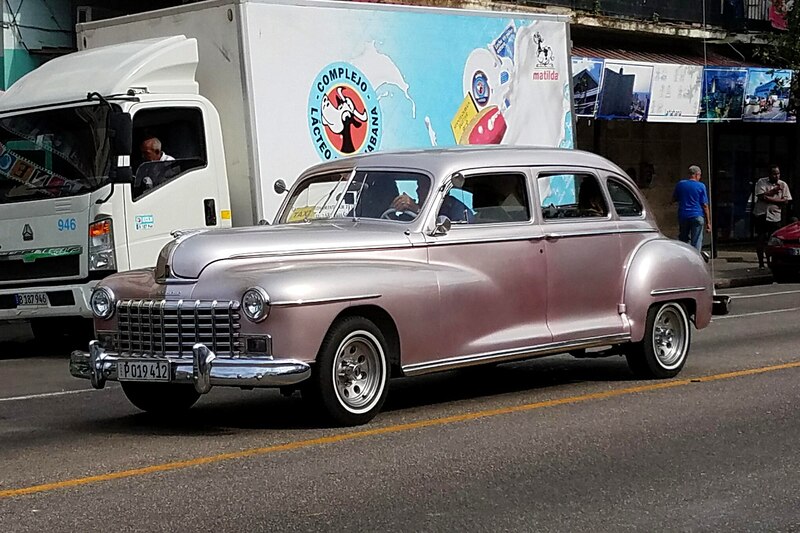 While there are many very nice old cars that would be at home in Florida or any other donut shop parking lot across America, there were also many that looked like they were a big bag of walnuts and brush painted right in the street. 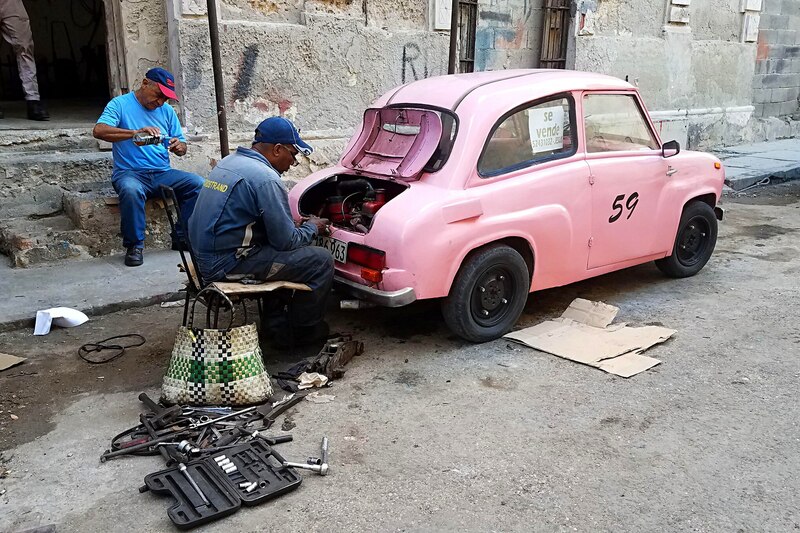 But it’s not like there are automotive junkyards overflowing with extra parts in Cuba. 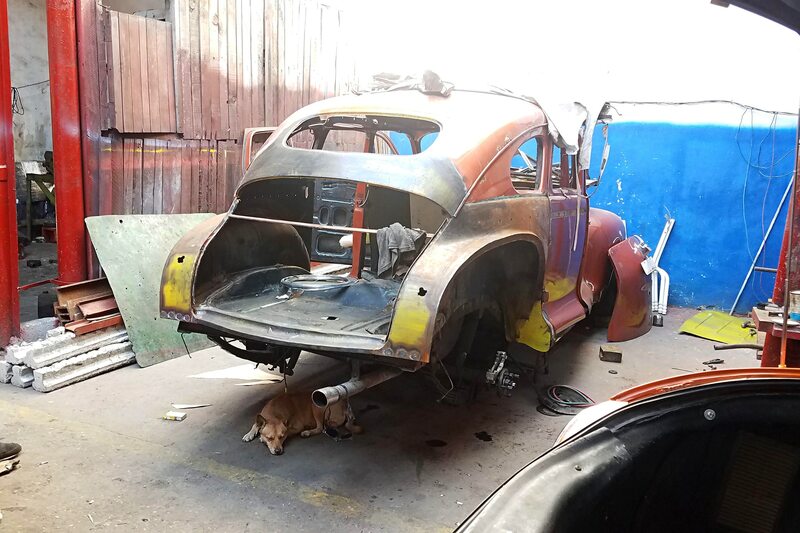 Extra parts just don’t exist. 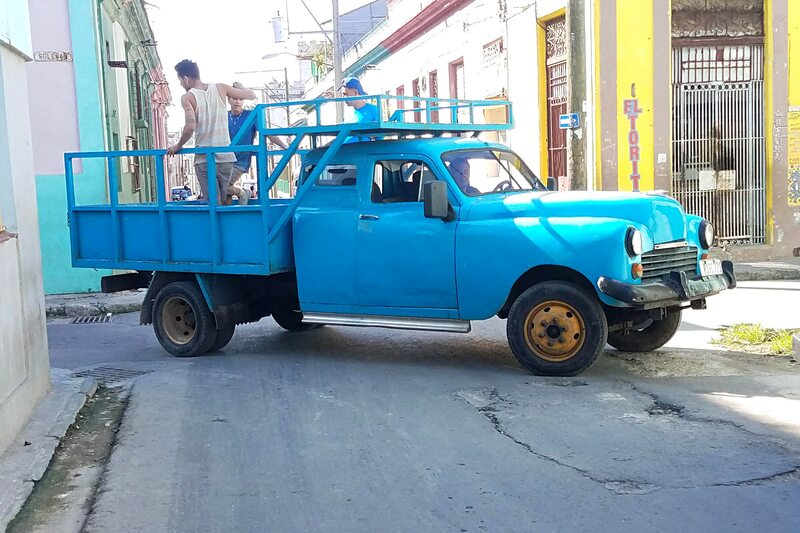 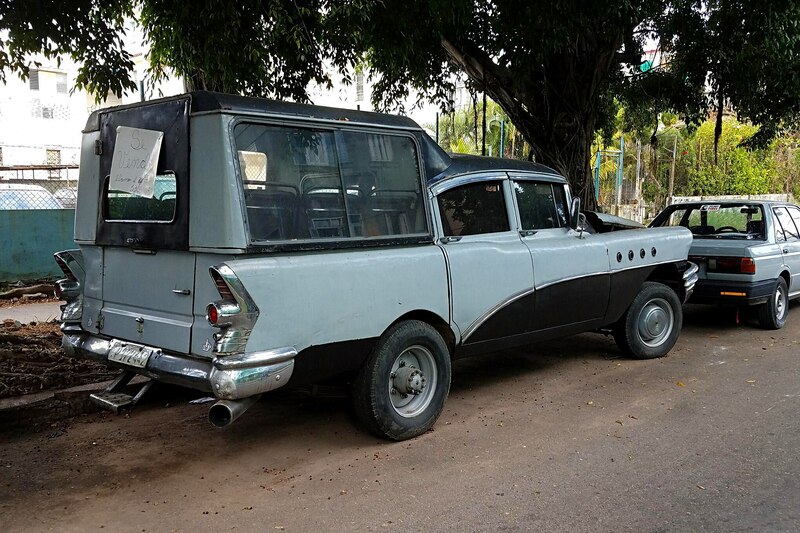 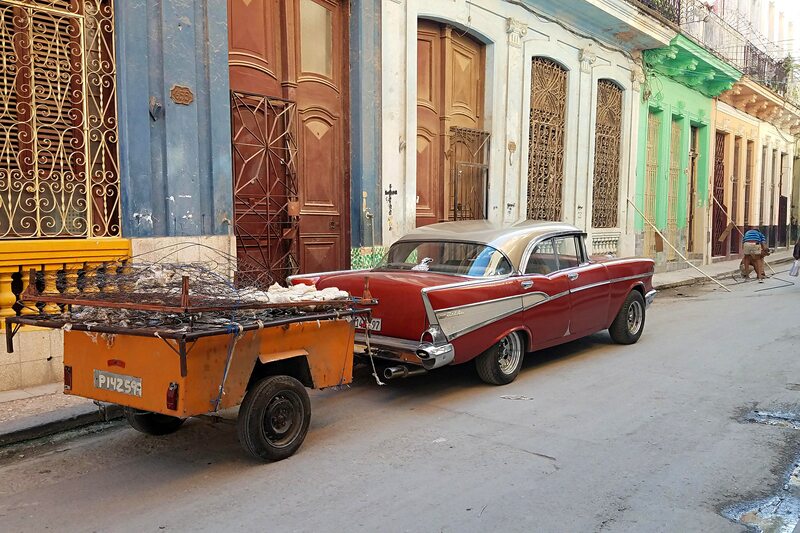 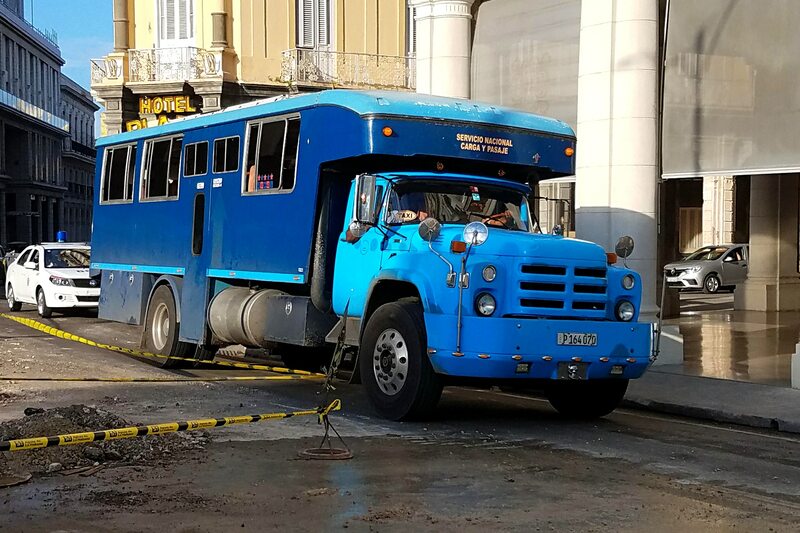 The Cubans’ ingenuity is what keeps these cars running with whatever they can lay their hands on. 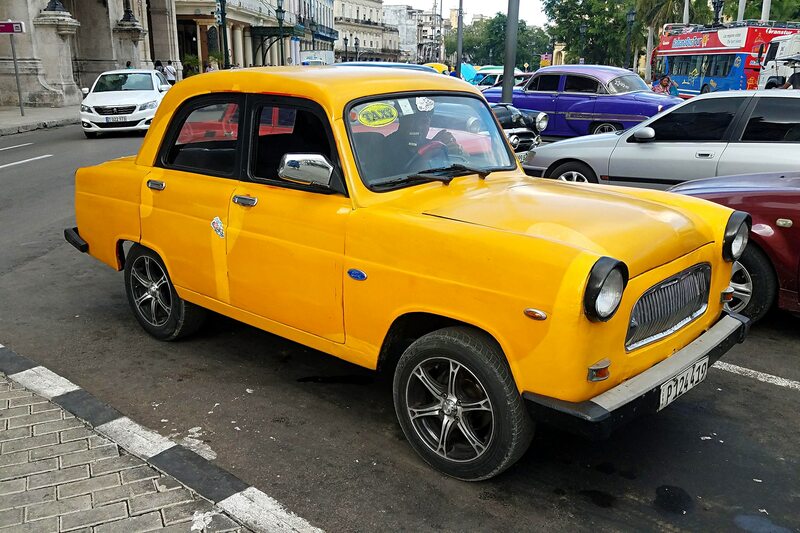 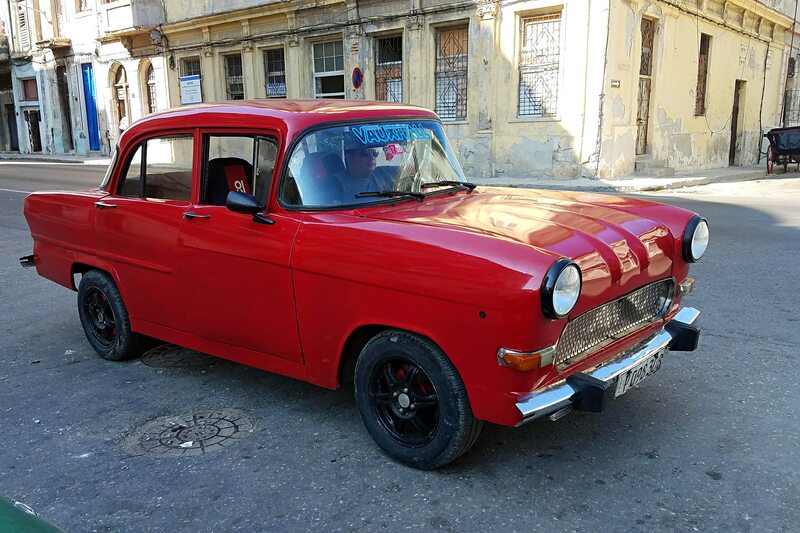 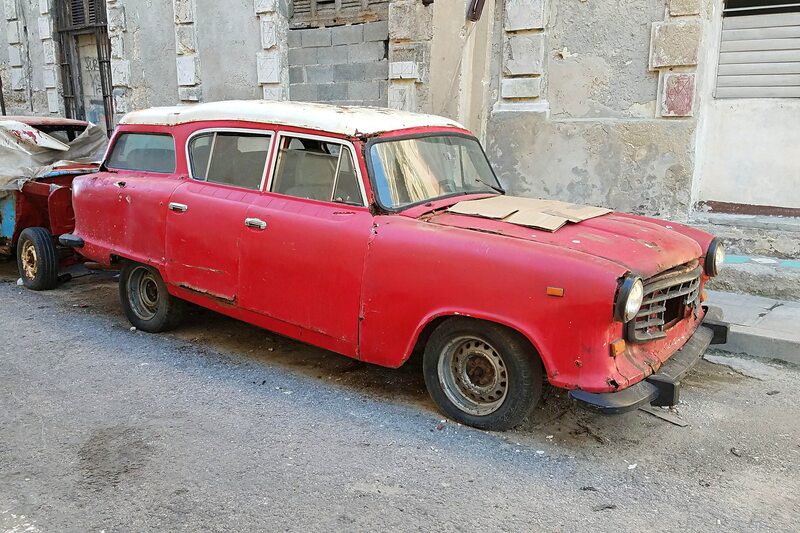 For taxis, Cubans can purchase an older, mid-1970s Soviet-era Lada (similar to a Fiat 124) for $20-25K U.S. and the ’50s-era Chevrolets will run you $30-35K U.S. Keeping in mind the U.S. government (C.I.A.) 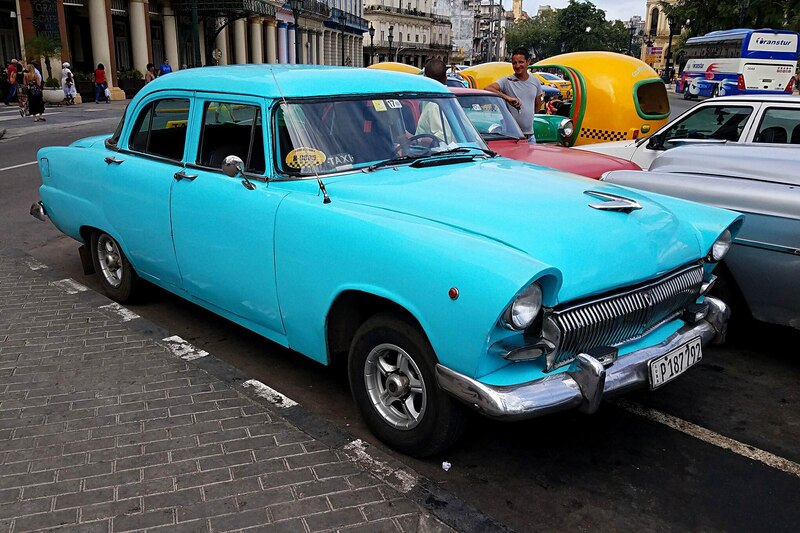 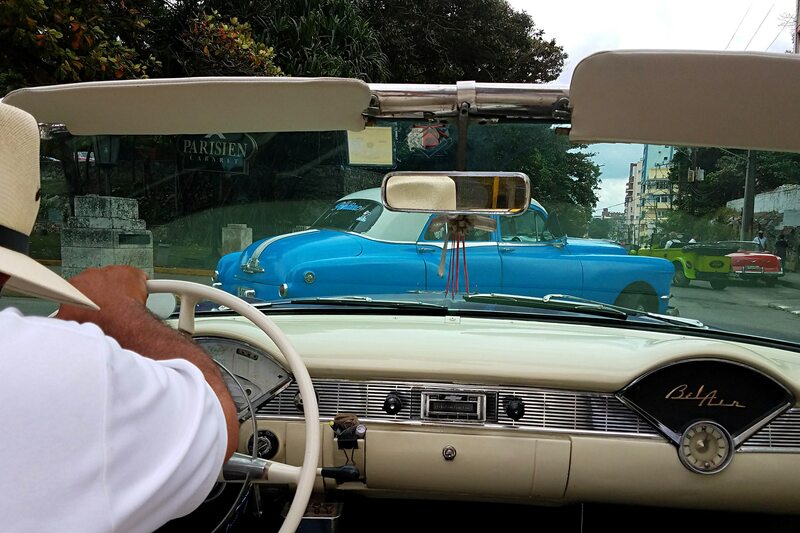 estimates the average annual salary for a Cuban to be less than $13,000, these cars are major investments. 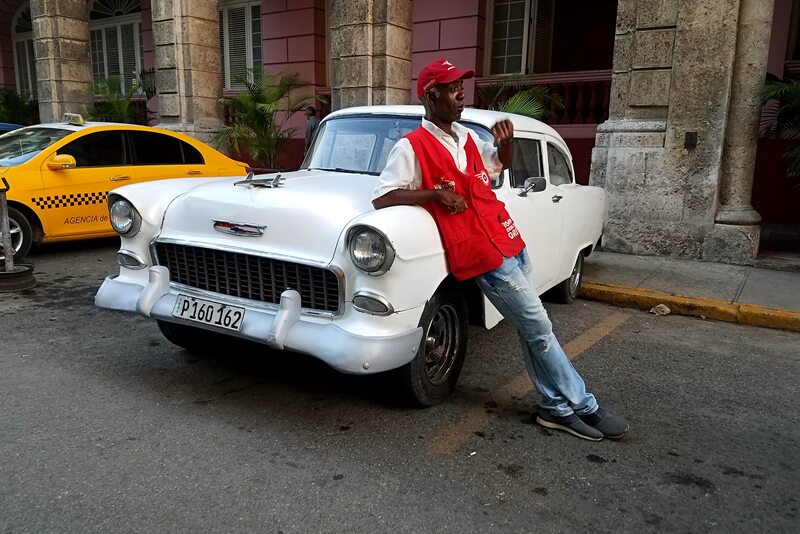 But what you will find everywhere are photos of the Cuban heroes Che, Fidel, and Camilo adorning the walls of Cuba’s shops and businesses, much as you could find images of FDR, JFK, or MLK hanging in American homes decades ago. 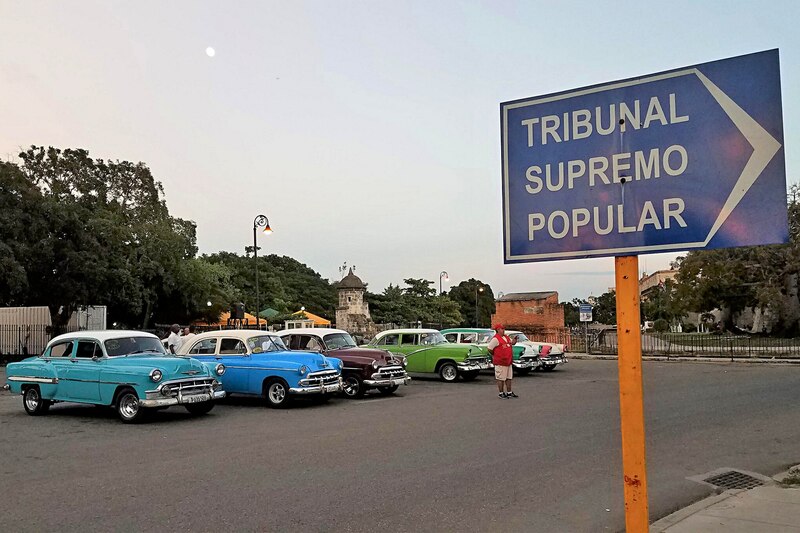 The words of Fidel Castro are literally written in stone, set into the granite sides of buildings and walkways throughout the capital city—a daily reminder of the revolutionary ideals that created the country.